Fraught with exceptional peril, better photos, new travel tips, astounding adventures, and yet again, more cows. Exchange Rate in 2005 was 1.20 dollar to 1 Euro. View Map of Route. Clicking on a number on the map will take you to that location in the journal. (when we get it complete). More pictures coming soon. We took Shirley, Karen's other mom with us this trip. We flew in and out of Shannon Airport (much nicer than Dublin Airport). We stay primarily on the West Coast. We bought Columbia Sportswear waterproof hiking boots and Omni-Tech waterproof pants to add to our Omni-Tech coats, and did some tromping around in more remote areas without as much fear of wetness. This year we took Karen's other mom Shirley with us. We left Portland with many bags at sometime around 5am. Shirley's son Dan Klug of the world renowned (or should be) White Hart Forge took us to the airport. He didn't wear his kilt or send us off with a tune on the pipes and left the claymore at home, so we made good progress through the airport. We had a bit of a layover in Atlanta and were not encourage by the large headlines reading "Delta Declares Bankruptcy" in every newsstand. Of course we were flying Delta, and speculated that we'd be flying one engine short or some other cost cutting measure. There was no perceivable difference. The service was good and we arrived in one piece. We had minor luggage damage to one suitcase and reported it and received appropriate documentation. We had purchased luggage insurance from American Express prior to leaving. More on this later. The short version is that claims are a major pain and probably not worth anything short of losing your luggage altogether. We arrived in Shannon at mid morning and collected our luggage and caught a shuttle bus to Irish Car Rental. We rented a Opel Zafira, basically a small mini van, but quite compact. It allowed Shirley to get in and out easily (knee problems were a constant plague for her) and had plenty of room in the back for luggage which grew exponentially throughout the trip. It sat up higher as well and gave a better view while driving. It handled well and fit into tight spots without any troubles. We'd recommend it for 3-4 adults. We had some time to kill before our B&B reservation time, so we left Shannon and headed towards Lahinch, intending to drive slowly up the coast. We had a painful bout of driving again in Ennis. The traffic was terrible and there was a unexplained slowdown. We finally negotiated our way through and back out into open country. We stopped for lunch at the Biddy Early Brewery in Inagh near Ennis. The food was good and our first beer in Ireland was microbrew. It wasn't bad, but we're spoiled coming from Portland, Oregon, the capital of microbreweries, so others might be a bit more enthusiastic. What we were really wanting was that first Guinness. Shirley wasn't a beer drinker and stuck to tea and whisky during the trip. We got her hooked on Powers Gold as a change from her usual Scotch. Side note: Whisky and any alcohol in general is much more expensive in Ireland. A fifth of Powers is around 28 Euro while it sells for about $20 in the US. Those taxes are a killer and are causing many pubs to shut down. 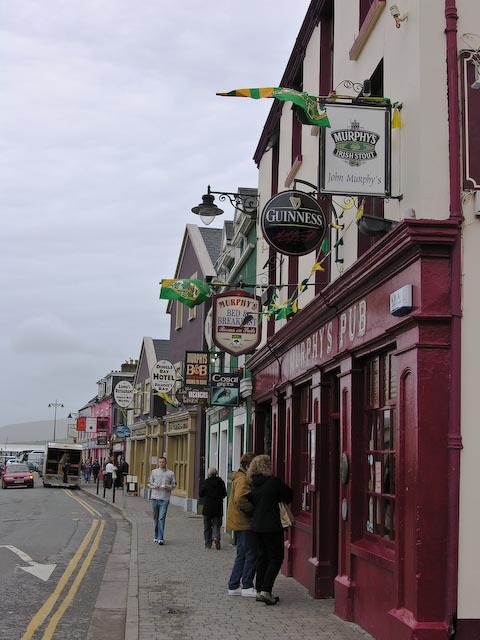 We drove to Lahinch and spent some time wandering about the town and looking at the shops. 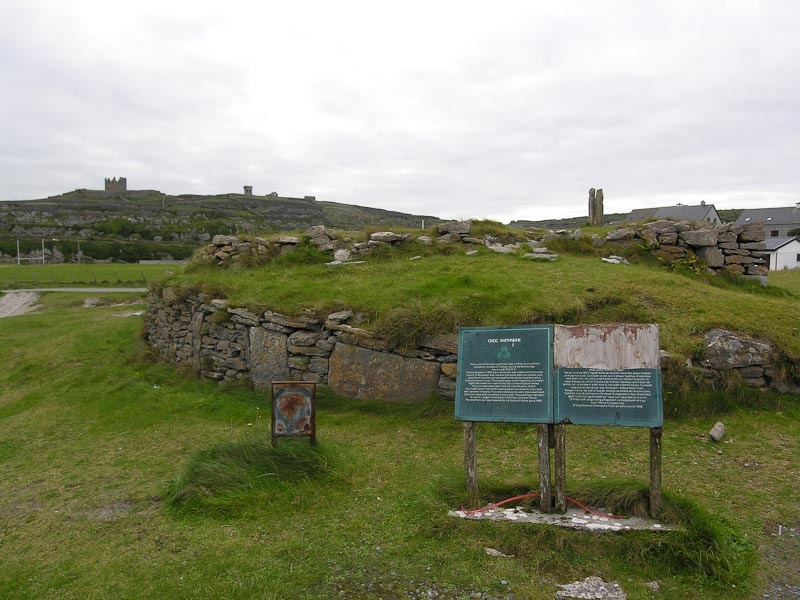 Lahinch is a golf, surfing and tourist attraction, so prices on some things can be high. There were a number of restaurants that were reasonably priced. We stopped into the Celtic T-Shirt shop again, and made a few purchases. We were impressed as before with the quality and creative designs. The weather was cold and windy, and after awhile we stopped into Mother O'Brien's for a hot tea or hot whisky as individual preferences dictated. It was a crowded, homey sort of place. The food looked good and the crowd was younger and boisterous. We drove on up through Liscannor and to the Moher Lodge B&B. We stayed here last year and loved the atmosphere, hostess and location. We were not disappointed this trip, and Mary Considine made us feel welcome and sat Shirley down for a chat and tea in front of the peat fire while Karen and I caught a quick nap. We don't know how Shirley stayed awake, we were wiped after the flight, airport and drive. The nap fortified us and we woke after a couple of hours. Little did we know that this was the best bed of the trip (cue music for ominous foreshadowing of aching backs to come). 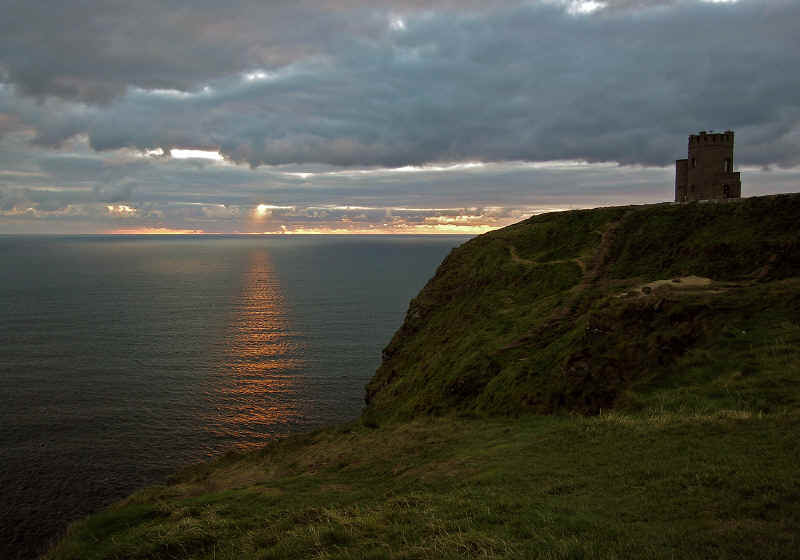 We had planned another trip out to the Cliffs of Moher at sunset if the weather held. There were clouds and wind, but we thought we'd chance it and catch some dinner afterwards. We bundled up and grabbed the camera gear and drove up the road. 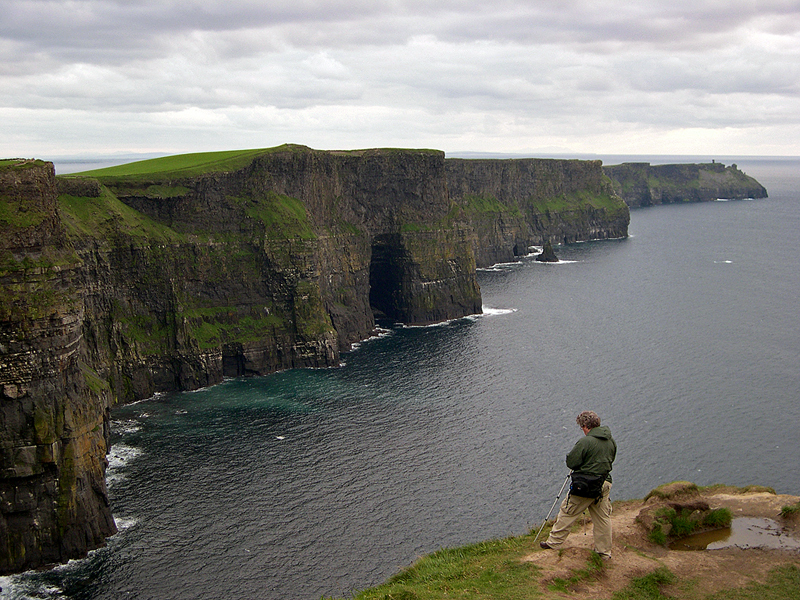 Moher Lodge B&B is the closest you can stay to the cliffs, so it is a short drive. Surprise, they are remodeling the Cliffs of Moher (OK, not the Cliffs, but the visitor centre) so you have to park in a new car park across the road. You have to do some extra walking and can't easily get out to the Southern part (where it was posted no trespassing), but it is still worth the trip. You can still trespass on the Northern side. We don't know how long the remodeling will take, but it should look nice according to the plans and drawings posted. This probably won't result in the same experience one has now, the new will be much more tour bus oriented. We've also had disturbing news via Cormac McConnell's Meanwhile Back in Ireland column at Emigrant Online, an always reliable source, that the new experience will be expensive and is in the hole already as well. Once we'd had enough of wind and the sun had mostly set, we headed off to Liscannor for some food. Prices seemed higher this year, and we entered several places and were scared off by the prices and attitude. One place didn't want to give us a table unless we were going for a full dinner. At 20 Euro plus for the dinner we were not tempted or that hungry. All we wanted was a bowl of soup, chowder or a light supper. 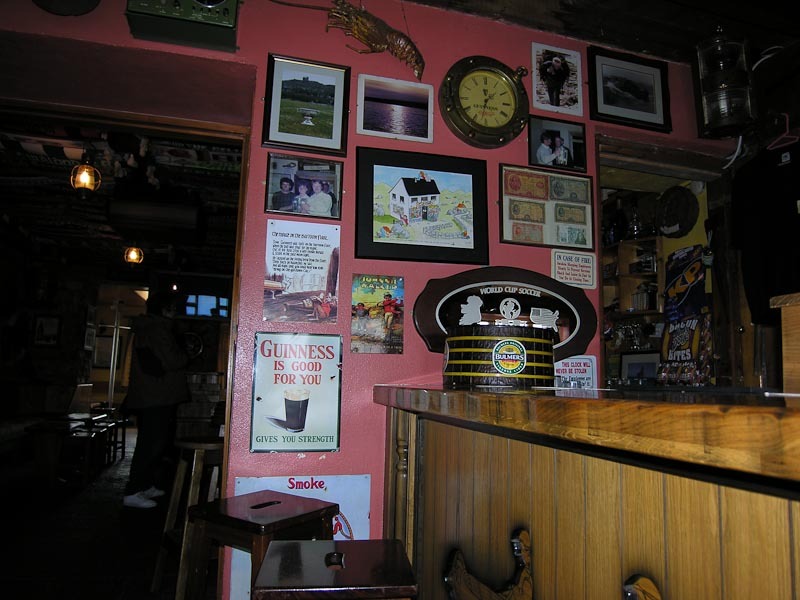 We found that Fitzgerald's Bar in Lahinch fit the bill. Good Guinness, interestingly tiled restrooms, semi-attentive service and good Irish Stew and seafood. The seafood plate was prolific in the quantity, quality and freshness. After eating we called it a day, and drove back to the B&B for a good and well deserved night's rest. 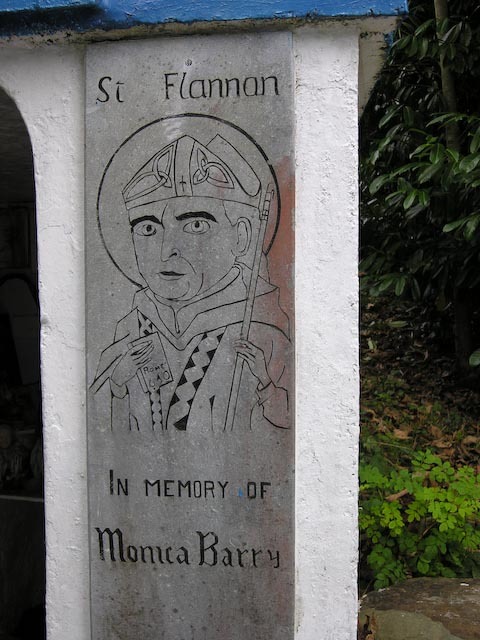 We made a brief stop at St. Brigid's Well to see if moonlight improved the pictures. Not so much, it's essentially a cave and moonlight doesn't help much. Back at Moher Lodge we tried to sit in front of the peat fire for a chat or to read a bit, but the warmth made us drowsy, so off to bed. An exceptional breakfast at Moher Lodge fortified us for the days adventures. Scott, of course, had the full Irish while Shirley and Karen tried other items, they were all exceptional. Shirley was up and had eaten before Karen and Scott left the room. We paid up and said our farewells. We'll be back next time we travel through! 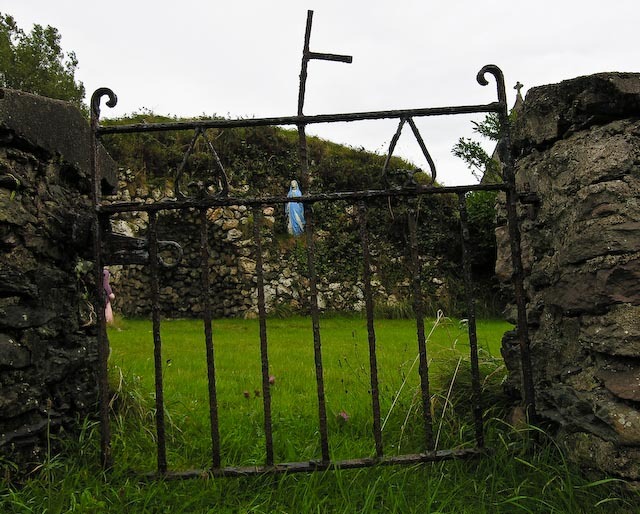 We made a daylight stop at St. Brigid's Well and the graveyard above the well. The well had some new items as well as the usual statues we saw on our last trip. Evidently someone comes through periodically and tidies up. 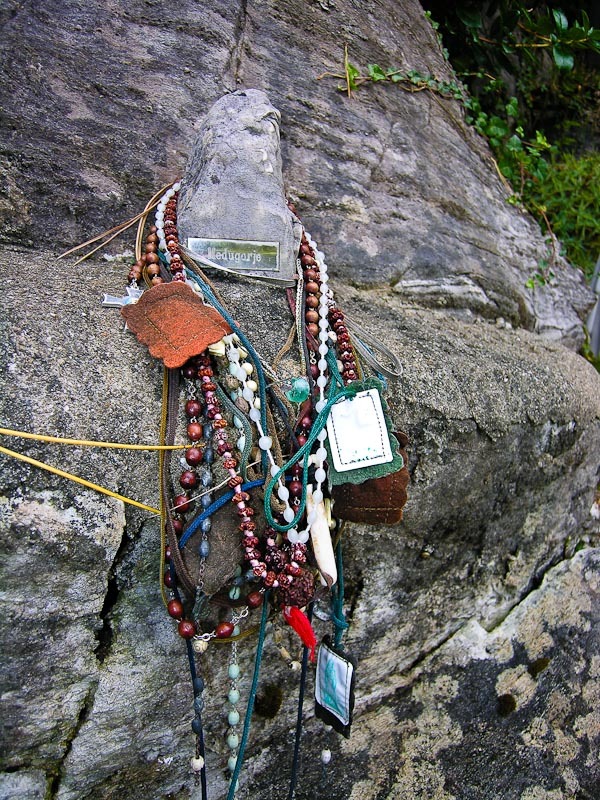 We resolved to find a few more holy wells during the trip. 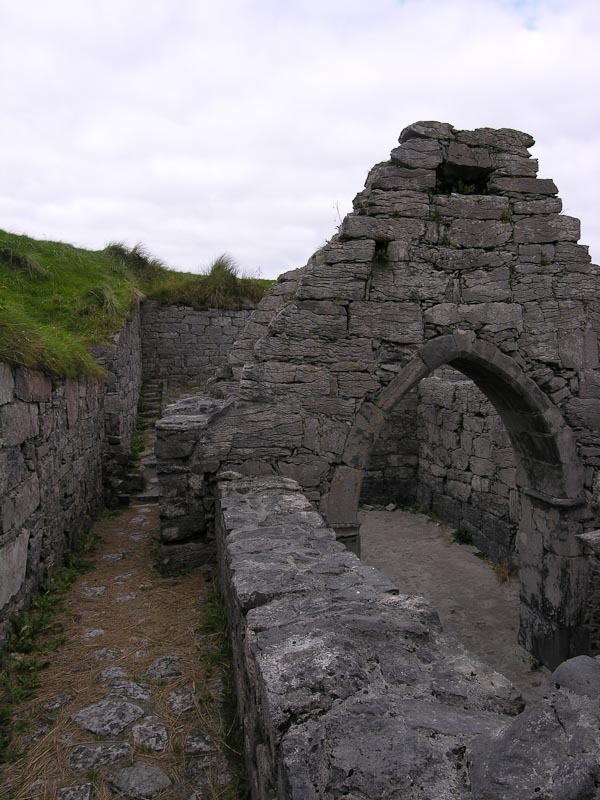 Some were real oddities like St. Flannan's Well in Co. Clare (see 10/5 entry below). 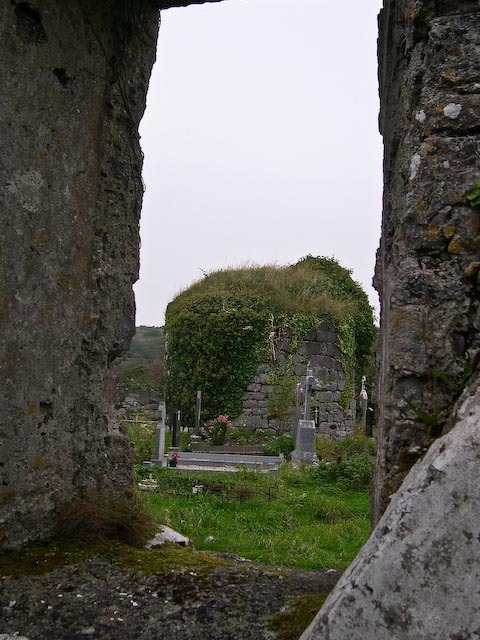 Further down the road we stopped at the graveyard near Liscannor. Between brief showers, pushy German tourists, and rainbows, we took some nice pictures. The ground was rough, but well worth the effort. The graveyard overlooks the bay and is beautiful on a sunny day and probably any other time as well. Another place to visit the next time. Onward to our first Club Soda stop, and then shortly after a stop for ice cream. 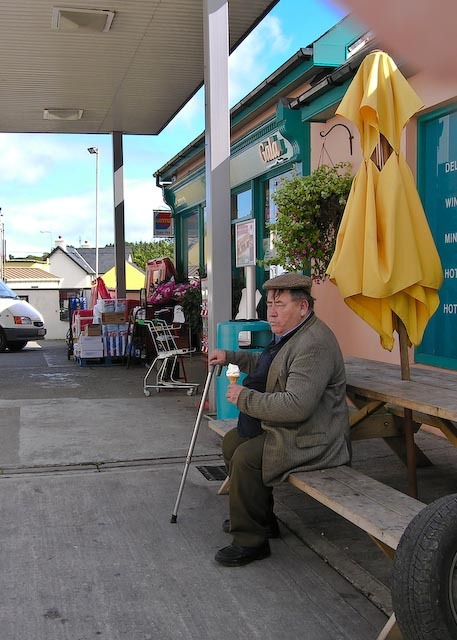 Karen had been craving it since June or more likely since our last trip, so we introduced Shirley to Irish soft serve at a Tops Petrol Station. We also introduced her to true Irish plumbing in all its leaky glory. She survived! The interior of the station/store must have suffered recently from a bout of roof troubles. The smell of mildew almost killed us. It felt like breathing pure mold spores. The floor was spongy as well. We made it through Ennis without incident and on to Limerick. We skirted the city and made good time down towards Cork. 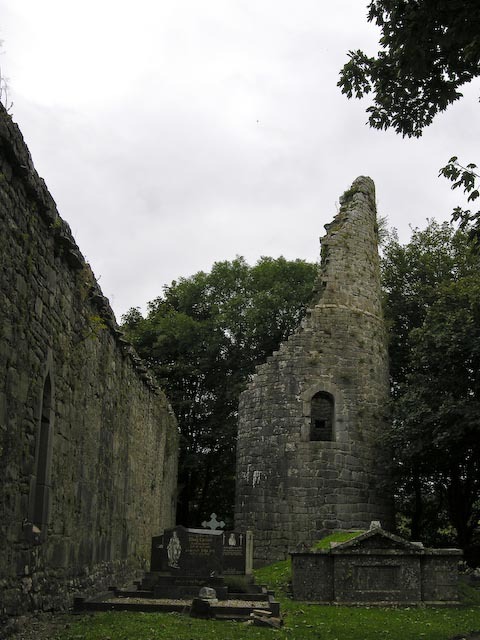 We passed through Buttavent, and had to stop at the ruined friary in the town center. It was too compelling. 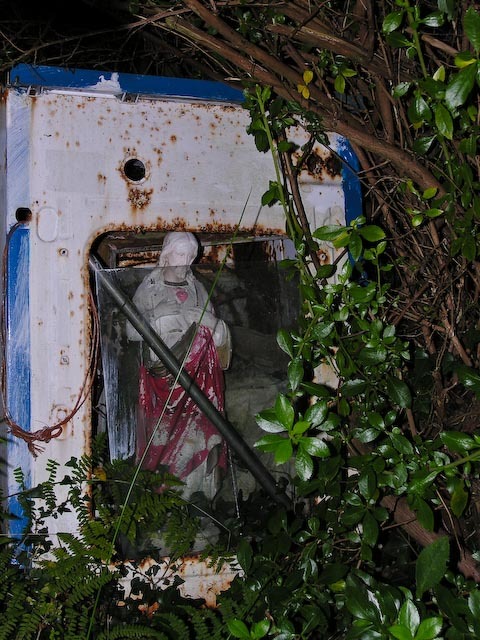 This was Shirley's first exposure to larger ruined structures as well as a Irish church in good condition. 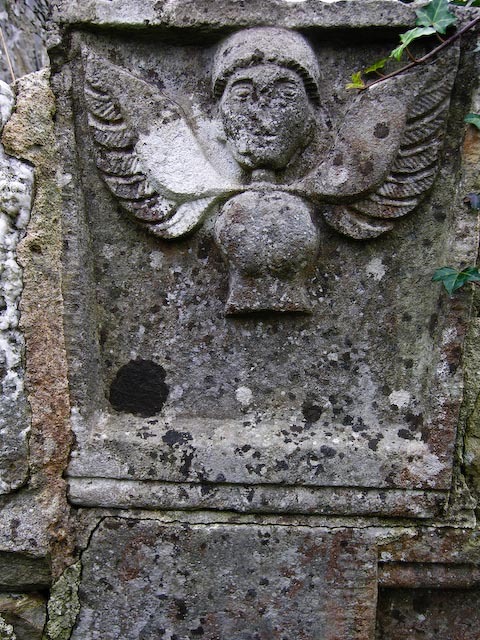 We spent an hour or so wandering through the ruins and looking at the stonework and headstones. A brief shower and a chill in the air drove us to the nearest pub. 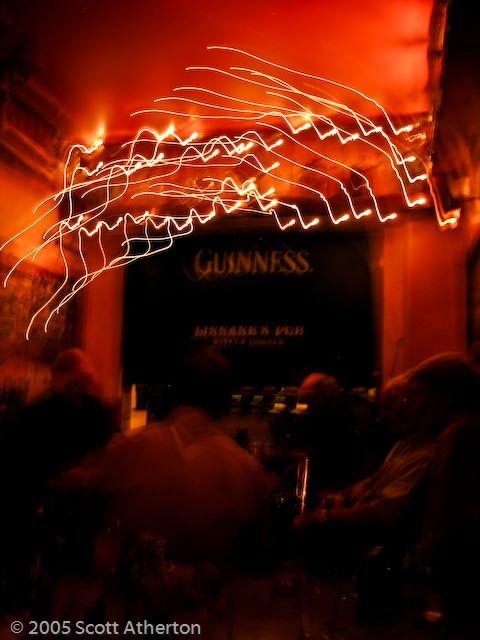 Maloney's looked the typical Irish pub with a few regulars lounging about before noon. A round of hot whiskies set us right and drove away the chill. We had to make a fast exit as someone was smoking in the pub on the other side (Karen is allergic). We didn't see them, but the smell left no doubt. This was the only real encounter with smoking in a pub the whole trip. Most bartenders and patrons are quick to jump on any offender. We picked up the driving pace as we had to be in Shannonvale at a reasonable hour, and had a long way to drive. 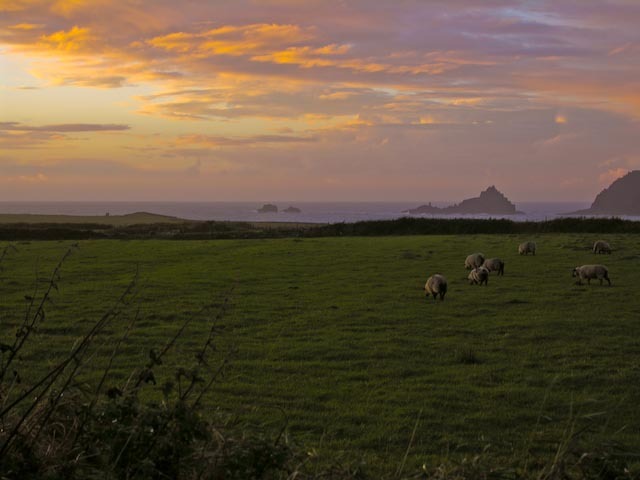 We made it through Cork easily and apart from a wrong turn and short detour towards Waterford, made it to the Shannonvale Cottages near Clonakilty after sunset. Seamus, our host, showed us the cottage. 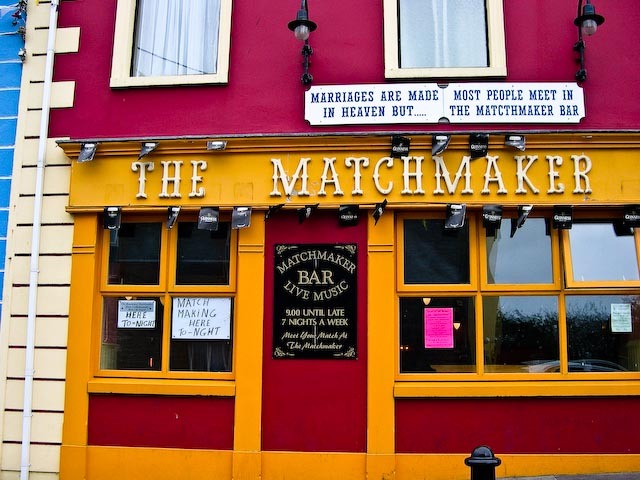 It was rustic, charming and full of "fine" Irish craftsmanship. Apparently these were restored stables, except now they stabled people. 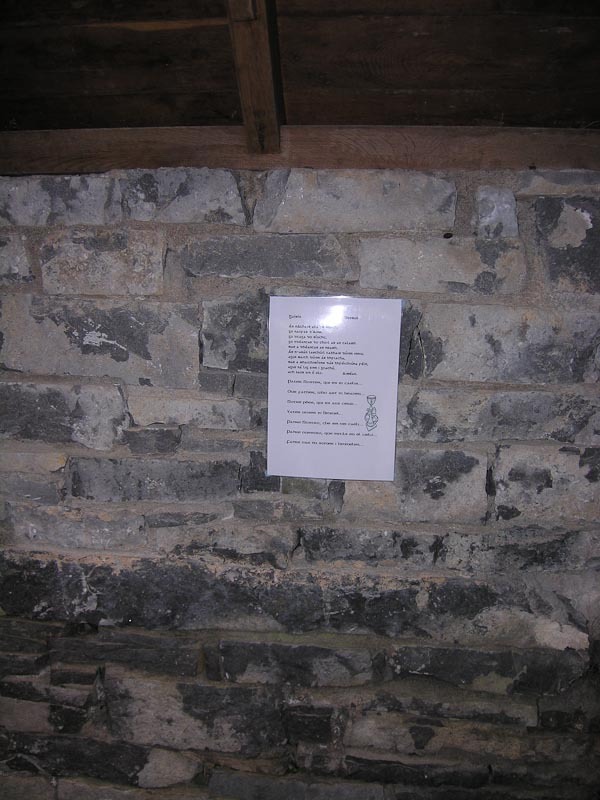 The walls were stone and the upstairs and ceiling all of wood. 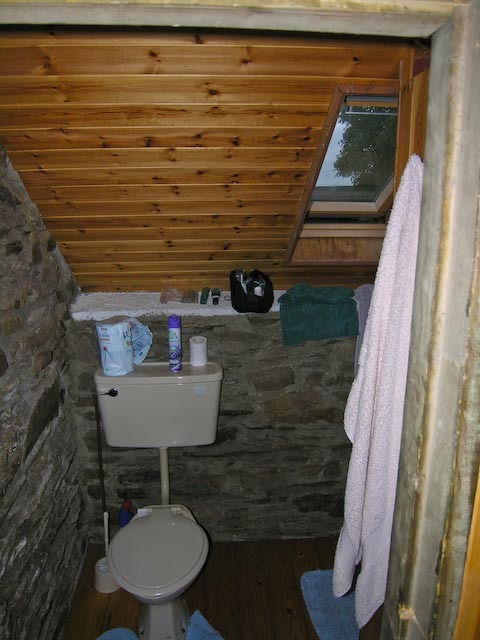 The wood was loosely fitted to the extent that you could clearly hear and sometimes see anything going on in any part of the cottage including the bathroom. The toilet rested charmingly on a single bolt and rocked you gently while in use. Unless the shower door was shut just right, it precipitated on the person doing dishes a floor below. The stairs were narrow, steep and fairly solid up to at least 100 lbs of weight. We didn't manage to break anything, but they bent and creaked alarmingly. 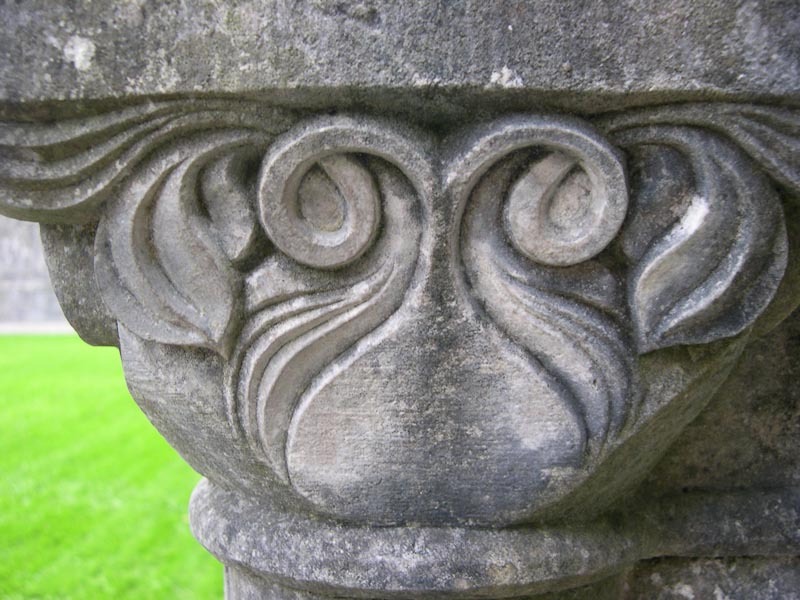 Scott observed that the Irish were master stoneworkers, but seemed to be confused when confronted by wood. Much of the wood appeared to be carved rather than cut, giving the appearance of being worked by a family of beavers. Overall the place was fairly comfortable and adequate for a flexible family or younger people. It was a bit rustic for Shirley and the steep stairs were a concern. Scott and Karen's bed was a wood frame strung with rope and a mattress atop, functional and semi-comfortable. As it was the end of the tourist season, we were the only guest and saw little of our host and family except for mornings as the children went to school. We lugged the bags inside and upstairs and did some minimal arranging before going in search of food. We drove into Clonakilty, and after some walking up and down found the O'Donovan Hotel lounge. It was a warm and friendly pub atmosphere with a couple of local families settled in for food. We grabbed a corner booth and tucked into Irish stew and Murphy's stout. When in Co. Cork, order the Murphy's. The Guinness doesn't fare so well from the transportation, and Murphy's is the local brew and just as good if not better. On the way back to the cottage, we stopped at the Spar to purchase groceries. 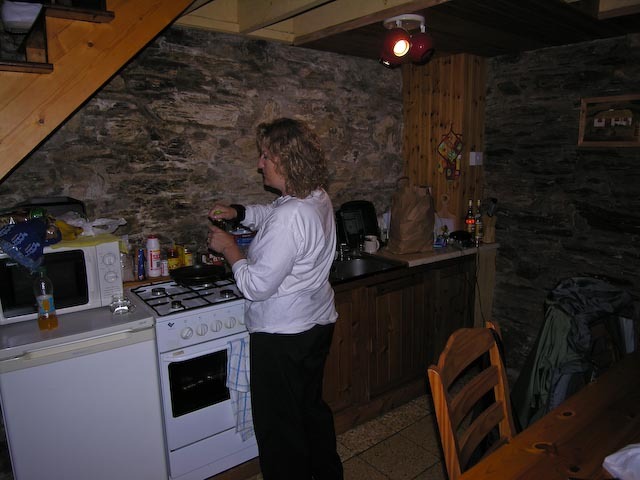 Our intent was to cook our own meals much of the time and take lunch fixings with us on day trips. 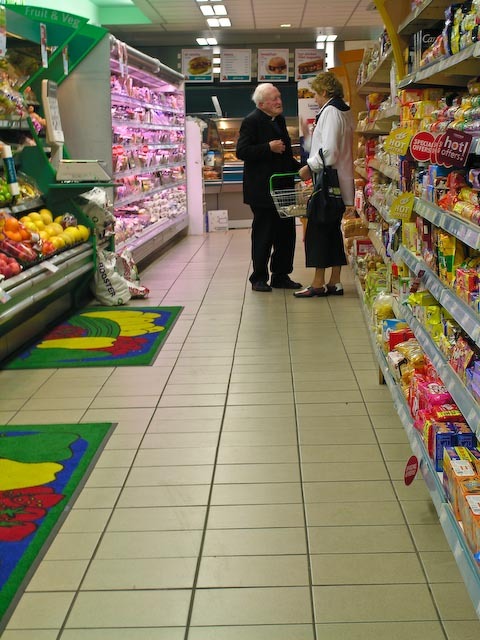 We had our first exposure to Irish grocery prices and were amazed that they were so much higher than at home. Still it was cheaper than eating out. 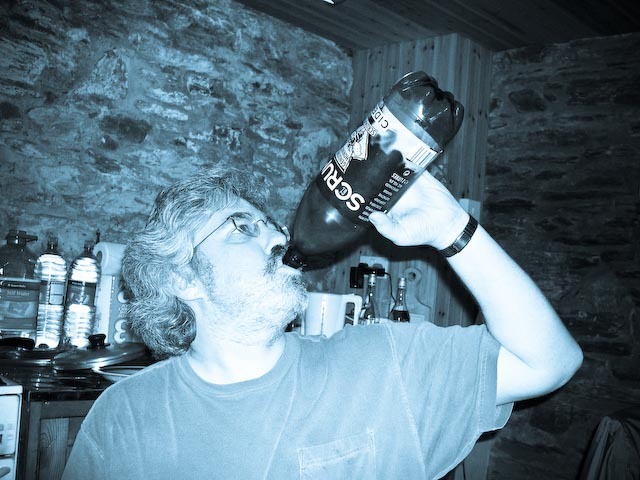 Scott found some Hornet Scrumpy in a 2 liter bottle, and was well chuffed. We drove back to the cottage and put away the groceries in the mini fridge and headed for our respective stalls for bed. We rose early and fixed breakfast. We had agreed to meet the Harrington's in Castletownbere on the Beara Peninsula for dinner. We met them last year when we had dinner at their restaurant. Karen and their daughter struck up a friendship and it looked like she might come stay with us for the summer, but things didn't work out on our end. They didn't hold it against us and invited us to visit. It is a long drive from Cork to Castletownbere not including distractions like scenery and cows. We made several stops on the way when the scenery proved irresistible. We went through Ballingeary, the gateway to Beara, and turned towards Castletownbere. The day was intermittently cloudy and sunny, and we drove along the water most of the way. the views were gorgeous with the sun on the water and the clouds casting shadows along the high hills to our right as they scuttled along. We purchased gas outside of Castletownbere and vowed not to complain about gas prices at home. Around $6 a gallon makes $2.25 sound like a luxury. We rattled into Castletownbere in the early afternoon and parked in the city square area. The town was bustling and there was very little parking. We walked down the street and there was Jack Patrick's right across from McCarthy's Bar (of book fame, that's it on the cover, no nuns out in front though). We never did make it into McCarthy's this trip, maybe next time. The sign in Jack Patrick's read closed, but they let us in anyway. We were warmly greeted by Cathy Harrington and shortly after introduced to her husband John. He had a fearsome twinkle in his eye and both proved to be a entertaining host and hostess. We were served crab, shrimp and chicken sandwiches (not combined in the same sandwich but separate) and we all sat down for a delicious lunch and chat. After lunch we got a quick tour of the restaurant and butcher shop and then we all piled in their small car (made smaller by the three robust Americans) and the five of us headed off for a guided tour of the Beara Peninsula. We drove back East and then up to Healy Pass. The long winding road up in a small car with 5 bodies gave us some concern, but the car chugged along and we made it to the top. Looking South you could see back to Co. Cork and North was Co. Kerry with Glanmore Lough below. There was a small gift shop and a lookout point where we stopped and took a few pictures. There was a good stiff breeze blowing, Karen had a clothing malfunction and we quickly headed back to the car. We continued on and headed West deeper into the peninsula. We passed through several small towns, all the while hearing stories about the area. 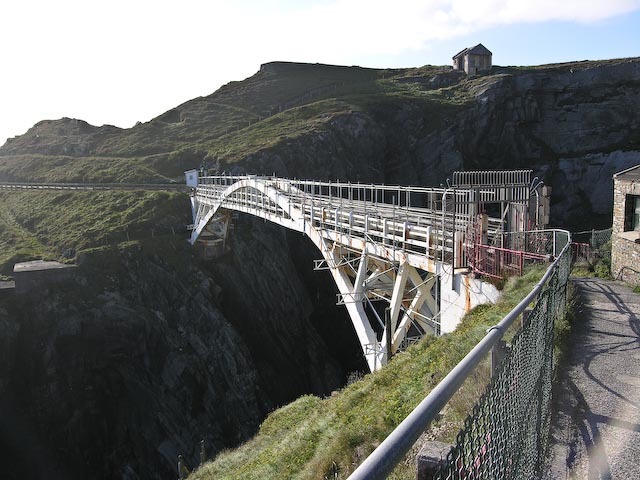 We traveled along the coast out to the Dursey Island cable car. We parked next to the cable car and got out to watch the churning water below. 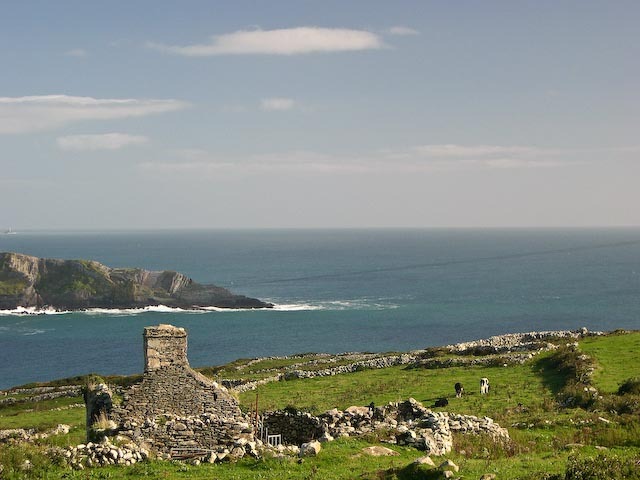 One takes the cable car to get out to Dursey Island. It looked like a terrifying ride especially if shared with a cow or a few sheep. On the way back to Castletownbere we passed Puxley Mansion and drove by on the way to Dunboy Castle. Evidently Puxely Mansion is undergoing renovations to become a 4-6 Star hotel. Hope they build a helepad or airport as it is a long drive from anywhere. We made a detour to visit the Dunboy the local O'Sullivan family castle. Karen liked this as O'Sullivan is one of her family's names. We wandered around and poked at the ruins beautifully situated along the water. Once again the cold breezes made us retire to the car and we drove back to Castletownbere. At the end of the tour they took us by Brookhaven, their rental holiday house during the tourist season. 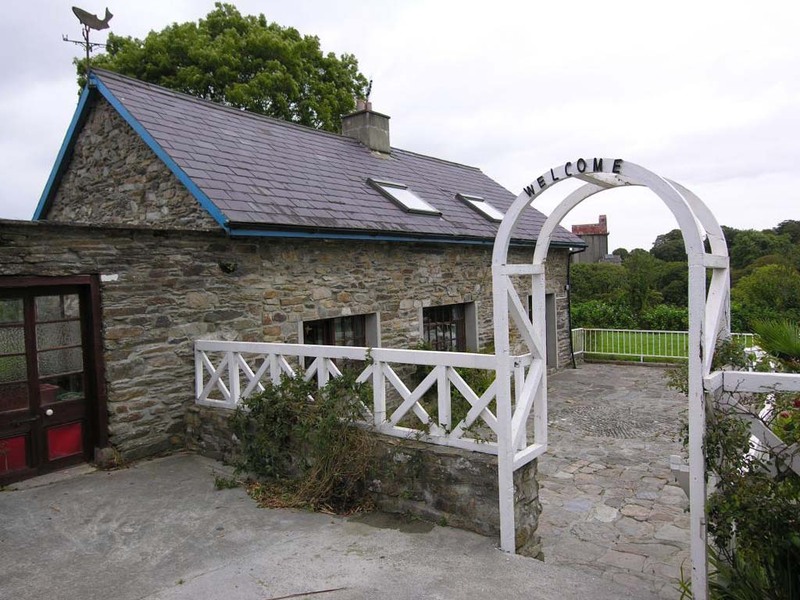 It was lovely and would be a perfect place to stay for a week on Beara peninsula (hint hint, give them a call and give it a try). Back at Jack Patrick's we sat down for a pint and chat while Cathy produced an excellent dinner of lamb, carrots, potatoes and other goodies and a wonderful dessert. Connor, their son was brought in and further entertained us (he must get it from his father). We met Cathy's sister, and a niece later in the evening. Eventually we dragged ourselves to the door for a the long drive back to Shannonvale. We were sorry to leave and appreciated the time they took to show us the peninsula and share meals, stories and time with us. We'll be back if they'll have us. It was a long and uneventful drive back to Shannonvale on a fairly clear night. We stopped at one point for a plumbing break and the sky was clear with a bright moon and liberally sprinkled with stars. We arrived at the cottage in one piece and did some more star gazing then then off to bed. The sound of rain beating on the roof and skylight woke us. We had no particular plans for the day so we rose leisurely and had breakfast. Irish Muesli was always part of breakfast and Karen's favorite. Scott was sole consumer of the black pudding but Shirley gave the white pudding a go with average results. The Clonakilty and Galtee sausages were a favorite for all. 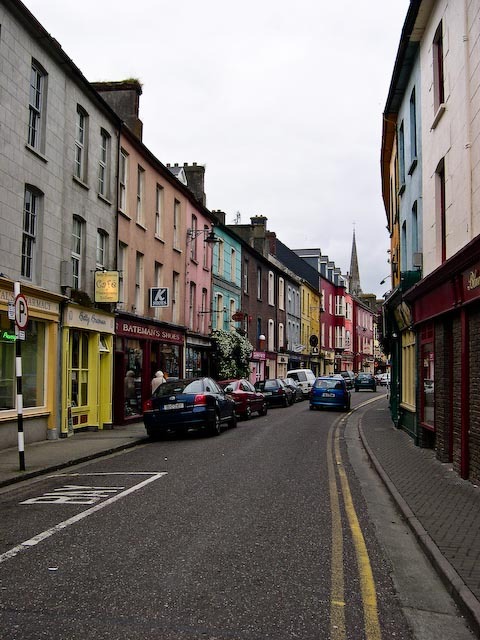 The weather continued to stay grey and damp, so we drove into Clonakilty and explored the town. Parking is at a premium and can be difficult to find. We spent some time in the bookstore and other small shops up and down the main street. We dropped off some laundry to be picked up later that day and then drove on to the Rosscarbery area just down the road. 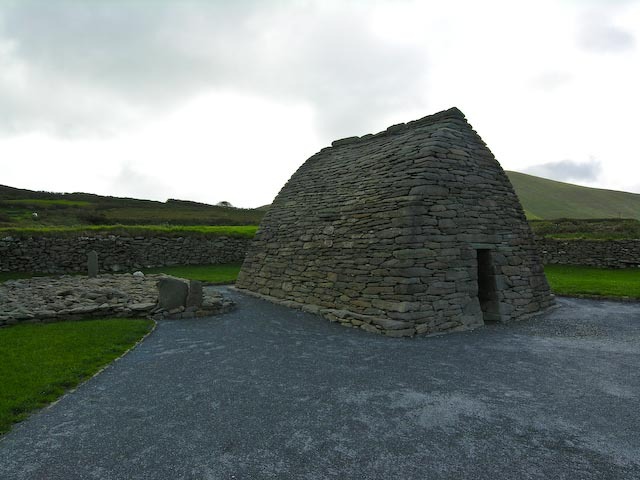 We had in mind to find a couple of sights in the area including Coppinger's Court, CastleFreake and the Drombeg Stone Circle. 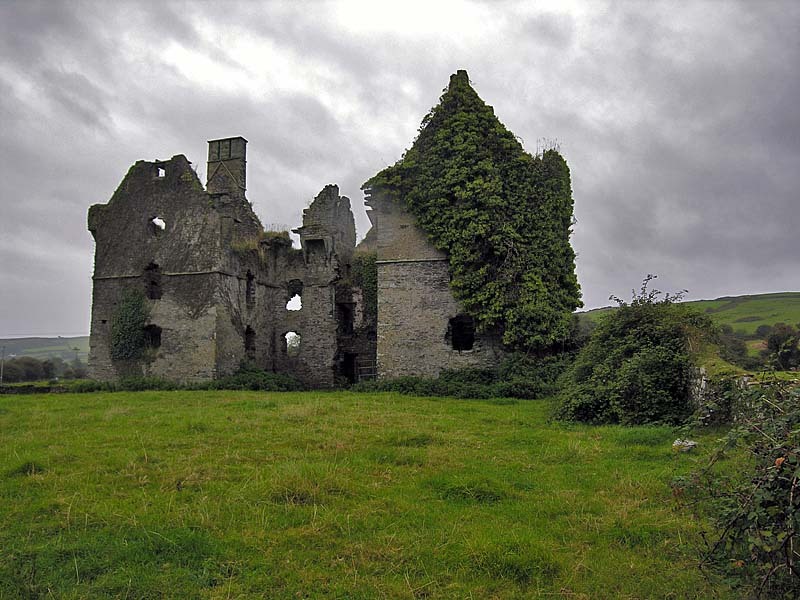 We had purchased a book a few years ago by Simon Marsden called "In Ruins: The Once Great Houses of Ireland". 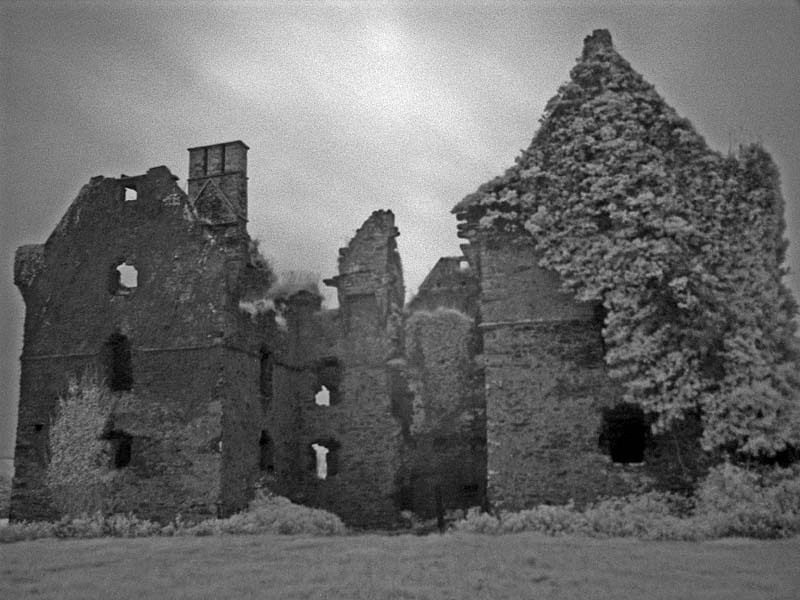 It contains infrared photos and history of ruined castles and manor houses in Ireland. Online we found a listing of the directions to the various sites and wanted to visit as many as we could. We crossed a long causeway and ended up at a hideous looking hotel and parked in their lot to access a map board across the street. Risking life, limb and traffic, Scott crossed the busy road to check out the sign. Using the wonders of modern technology, he took a digital picture of the map and we perused it at our leisure in the relatively dry comfort of the car. We established our relative location and directions and headed off for Coppinger's Court. Coppinger's Court proved to be a bit of a challenge. As we drove along the small country road we could see it across the field. Way across the field. There seemed to be a road running parallel behind it with no roads running between ours and it. We continued on and soon realized that we'd gone much to far and probably one of the small single lane dirt roads was going to be necessary. At this point we were closer to the Drombeg Stone Circle than Coppinger's Court. A shift in strategy ensued and we were off to find the Drombeg. This proved easier and after a bit of driving with relatively good signage we located the car park. 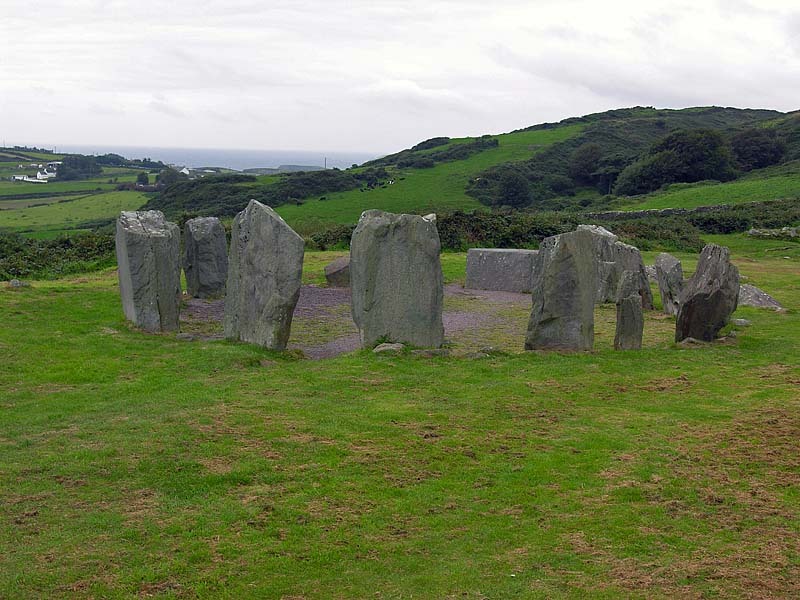 This site is overrated, but worth a quick look if you have not seen a stone circle. Around the corner to the South is a small prefab building that may eventually be a visitor center. At this point its sole purpose is to extract several Euro from your wallet or purse. If you go in the off season, it will most likely be closed. 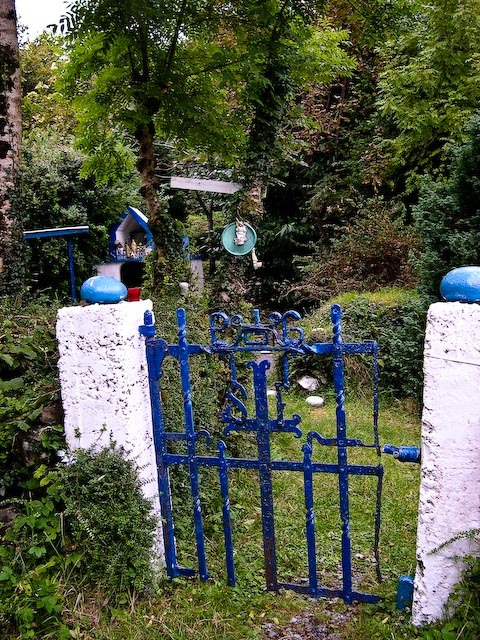 Go through the gate and down the fuchsia lined lane. The lane is also used by tractors and cows, so watch your step! The lane takes a jog to the right and continues on a way. The site is a good distance, so be prepared for some walking that may not be suitable for older or very young folks. When the trail ends you are looking out onto the Drombeg Stone Circle and the countryside beyond. Well, you might be looking out on the countryside, or just looking at driving rain and clouds. There is little cover or protection from wind and rain on the walk and in the clearing, so if the sky looks threatening, be prepared to run for it. The stone circle is overly manicured and pristine. The dirt area was neatly swept and the grass recently trimmed. A nice view out to surrounding farms, cows, and fields was more interesting to us than the circle. In the center of the circle was a pile of coins, bottle caps, and miscellaneous garbage. Evidently this is the modern equivalent of a sacrifice. At least I assume so as dead people, cows and sheep were not in evidence. I guess we're cheap these days, as the coins were all 10¢ or less. 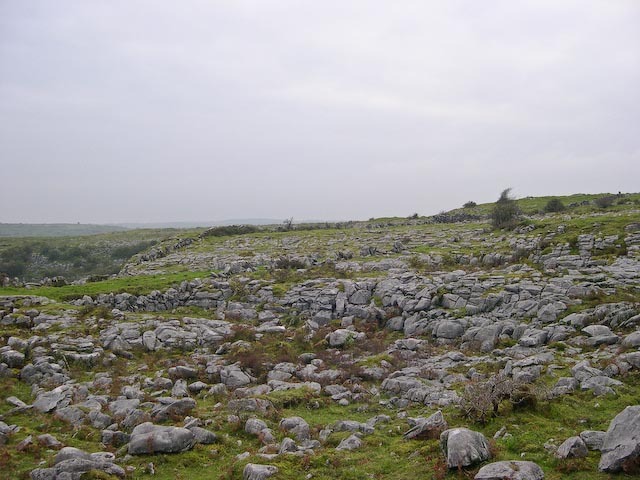 Beyond the circle is evidence of a Neolithic commune. 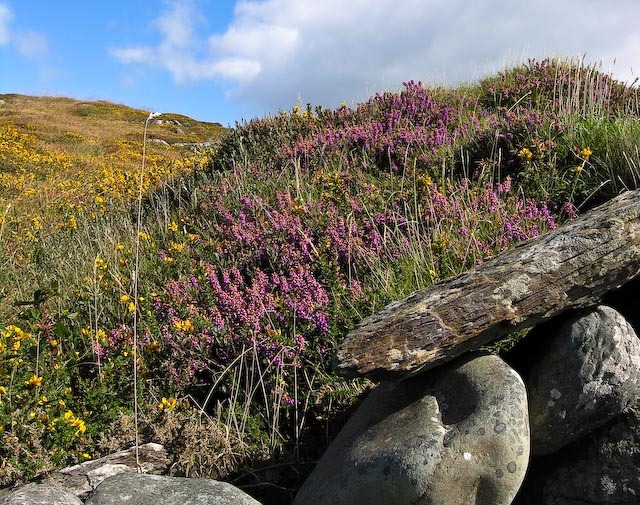 Stone huts were probably used by Neolithic slackers communing with the mystic and nature during bad weather. The large cooking trough was used to cook pilfered cows, sheep or veggies depending on the prevalence of vegans in that time period. OK, maybe this is overly harsh, but the modern slackers had left quite a bit of trash about in their effort to get close to the mystical at the overly manicured Drombeg Stone Circle. 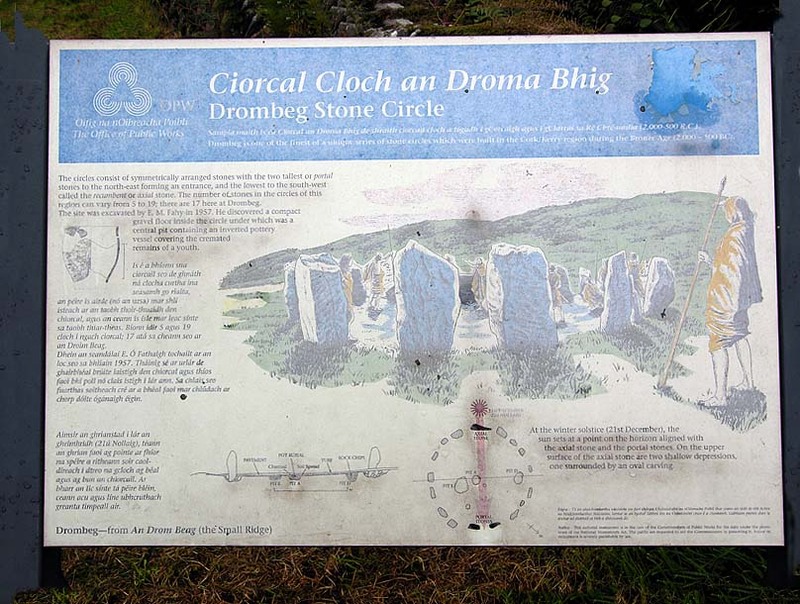 If you want to see a really nice stone circle, travel a lot further west to see the Ardgroom Stone Circle on the Beara Peninsula, and don't forget to pick up your trash and keep your pennies in your pocket! Encouraged by our success in finding the stone circle, but disappointed by it in general, we resumed our quest for Coppinger's Court. We took a road off of the route to Drombeg, but heading in the right direction. We traveled for a few miles along a wooded road. No luck. We ended up on a hill top that had a great view of the valley. We could see Coppinger's in the distance, but no road to it. Back we went. We ended up back on the main road we started on. We retraced our route back to the sign by the ugly hotel and tried again. 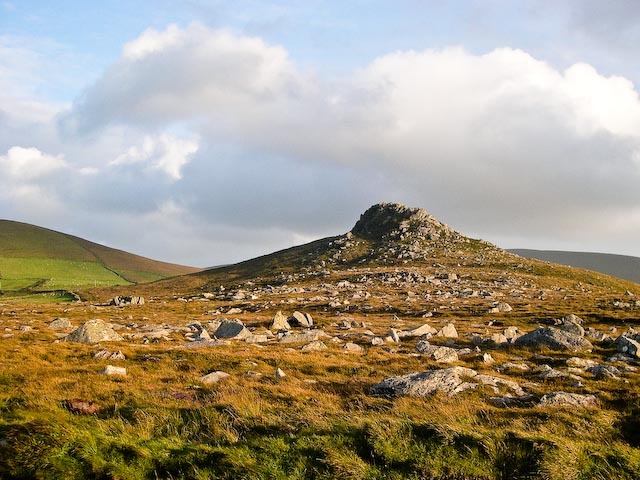 We took the first road we saw and ended up back on the route we had just come from Drombeg. We continued on the road slowly and through the trees we could see Coppinger's Court (we hoped). We found parking along the road and loaded up with rain gear and cameras. 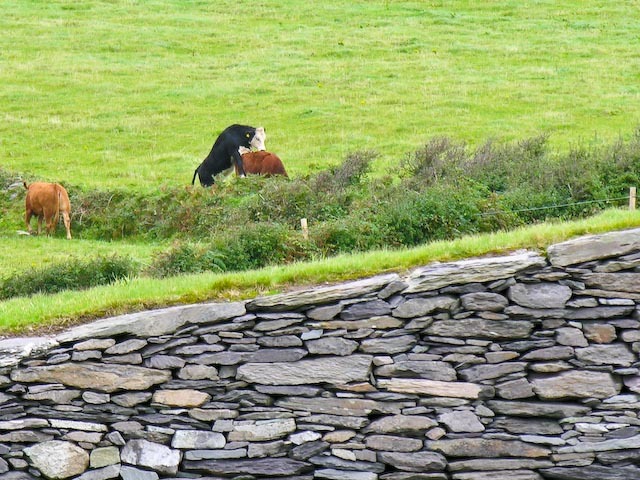 Passing through a cow gate, we walked down a overgrown stone wall through a pasture. The sky was dark and threatened a downpour. Coming out of a grove of trees THERE IT WAS!!! In all its dilapidated glory. It actually wasn't much to see, and the cows had made copious deposits all around. Karen and Shirley elected to return to the carcar, less than impressed. Scott was determined to get some Infrared pictures regardless. He vaulted the stone wall (ok, he crawled over with the cameras and tripod), avoiding the cow deposits, and set up the tripod. The wind picked up, and the first few drops began to fall. He attached the camera, set up the shot, and attached the IR lens. Each exposure was approximately 30 to 60 seconds. He took a few shots, wiping the lens frequently. He then tromped through the cow muck and went through the ruins. The cows had taken up residence, and the inside was worse than the field. I exited out the back into a heavy rain. He trotted across the field, and turned a few times to take a quick shot. The backside was more interesting than the front, but the rain had become a downpour and he was concerned about keeping the cameras dry. He ran across the field and back to the car. We'd highly recommend Coppinger's Court in good weather. There are many photo opportunities around the site. With some sun and clouds, the pictures would be spectacular. Otherwise, proceed with caution! Karen had used the time to make some sandwiches of Irish cheddar and ham. We munched the sandwiches, washed it down with club soda, and opened a bag of Tayto chips. The rain was coming down so hard that driving was impossible. We waited it out and a half hour later, lunch secured inside us, we were able to retrace our route back. 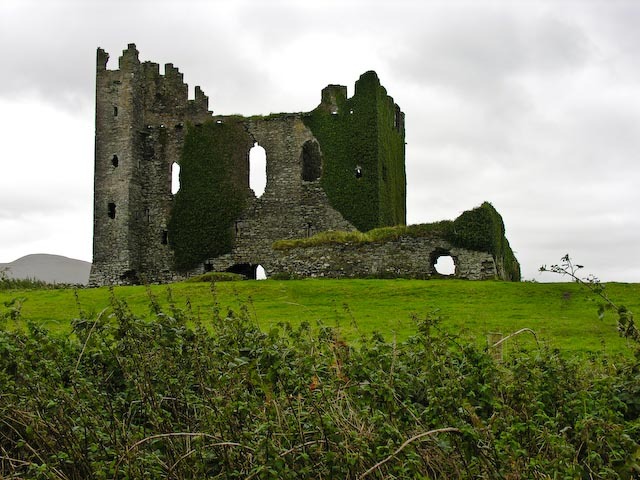 We drove back towards Cork and took some side roads to see if we could find CastleFreake. It was not visible from the road, and signs along the road said No Trespassing and warned that this land was owned by a gun club. This combination didn't seem prudent to challenge, so we drove back towards Clonakilty. We decided to drive further down the road as it was still early and the weather was improving. 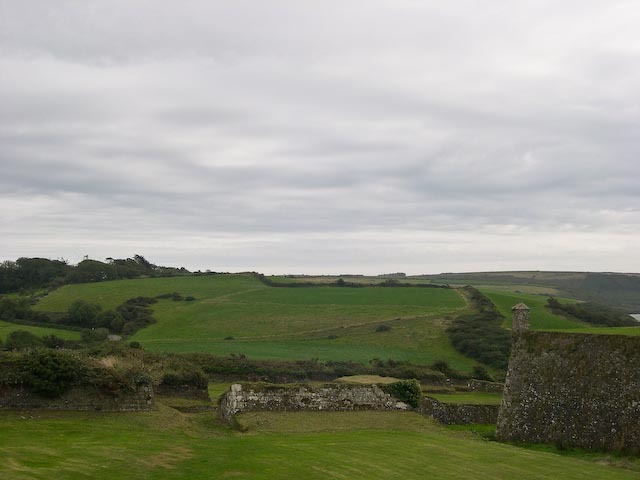 We headed for Timoleague to see the Friary. 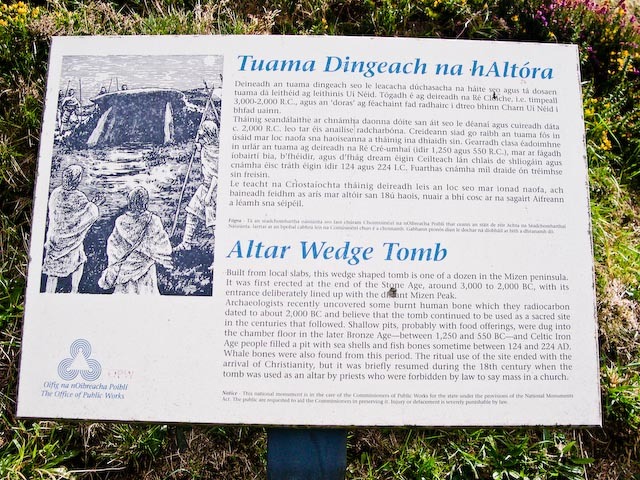 Timoleague has two attractions we discovered. 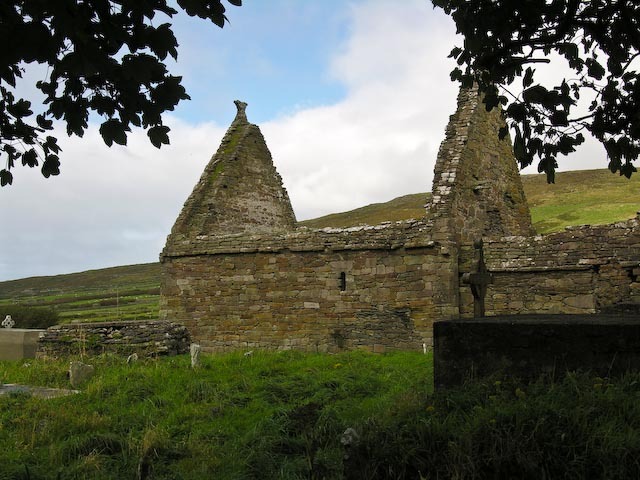 One is the Timoleague Friary, found near the water's edge near a stone bridge. 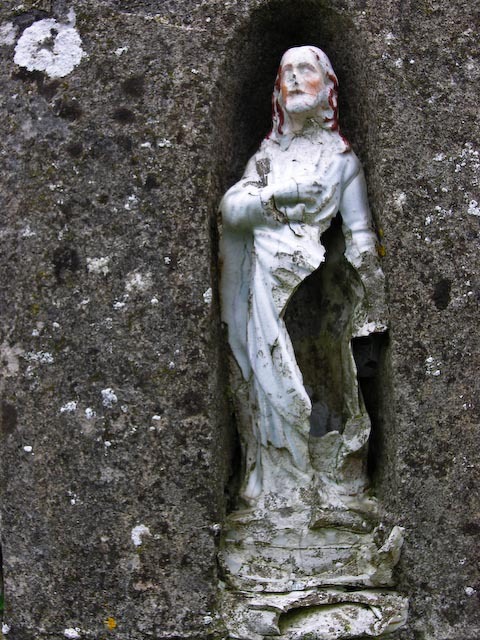 The site is very well kept, with labeled rooms and a fine graveyard with some interesting headstones. Spend some time wandering around and imagine what it was like to live there. The view of the ocean inlet from several of the windows is beautiful and makes for some good pictures. There is no roof and this can be challenging during a storm as we discovered. 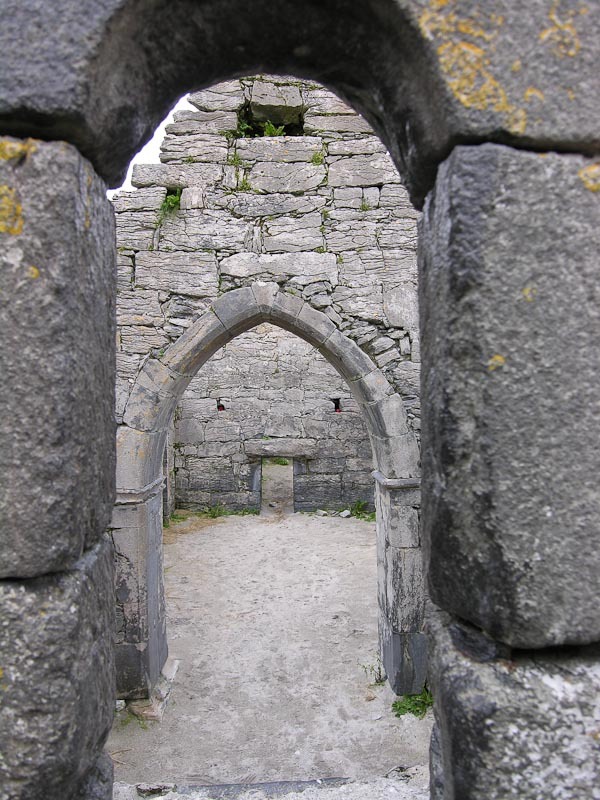 Look for the wart well in the friary. Supposedly dipping your afflicted parts into the water will cure warts. We didn't have any so we can't attest to its powers. 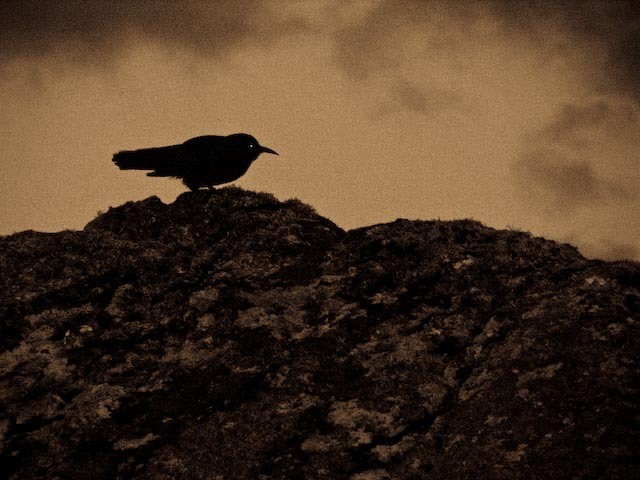 The place was infested with crows roosting on the walls and around the tower. I didn't see a lot of droppings, but be careful looking up. 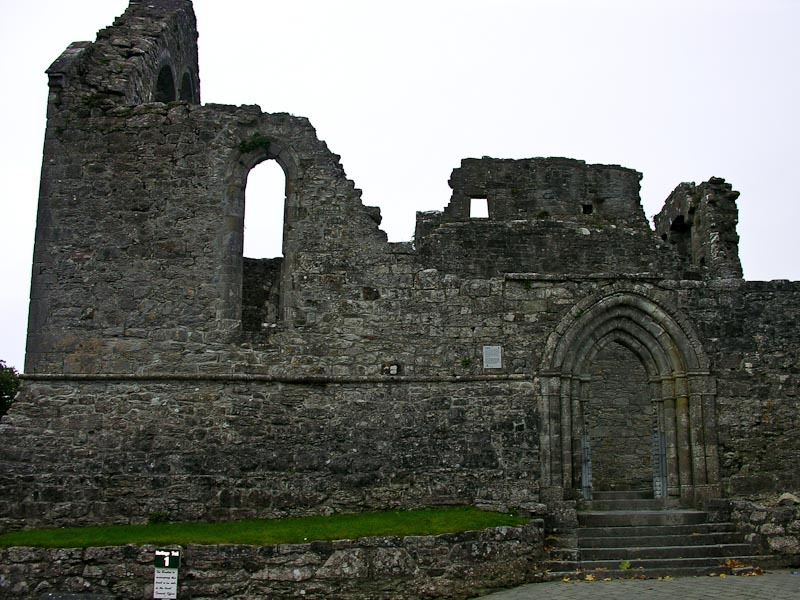 Timoleague abbey was founded by the Franciscans in 1240 A.D. 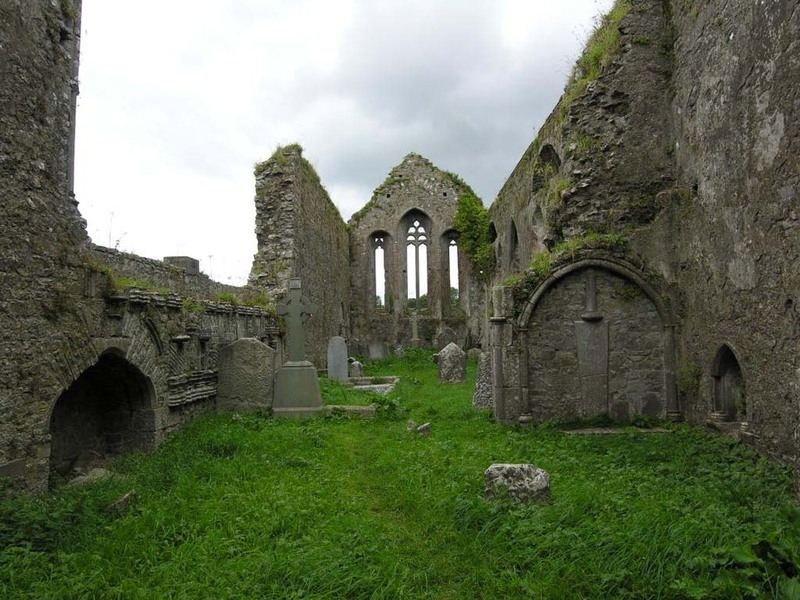 The abbey was built on the site of a monastic settlement founded by Saint Molaga in the 6th century. 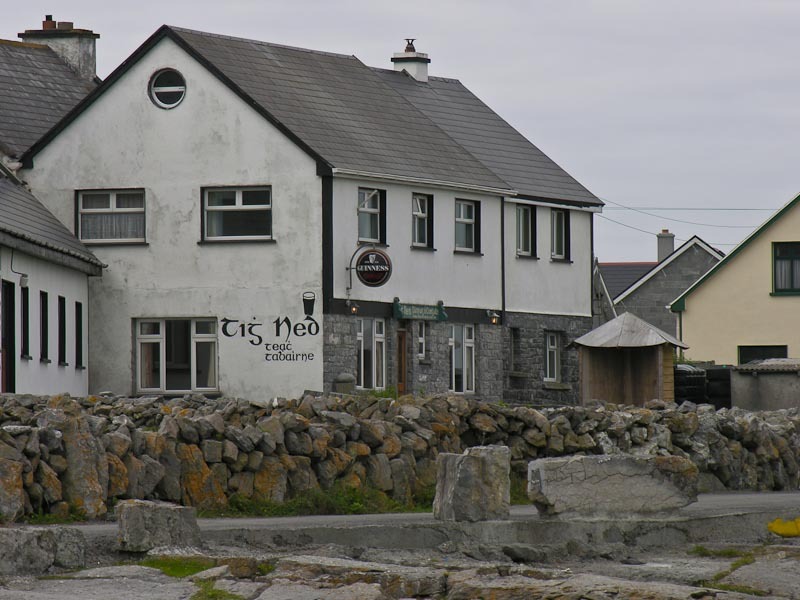 The village name comes from the Irish for House of Molaga, Tigh Mologa. 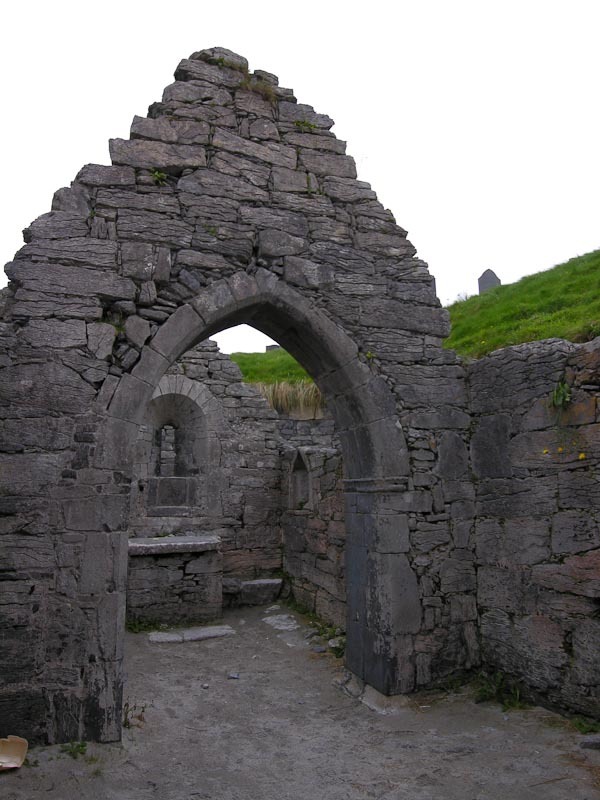 The Friary was used up until 1629. Up the hill above the town is the Timoleague Catholic Church (the church of the nativity of our lady) has triple stained-glass window by the well-known artisan, Harry Clarke. Beautiful mosaic and tile work abound throughout. We spent some time here exploring the grounds. It is well worth a drive up the hill to see both the church and the grounds. There is also a nice bell near the church. 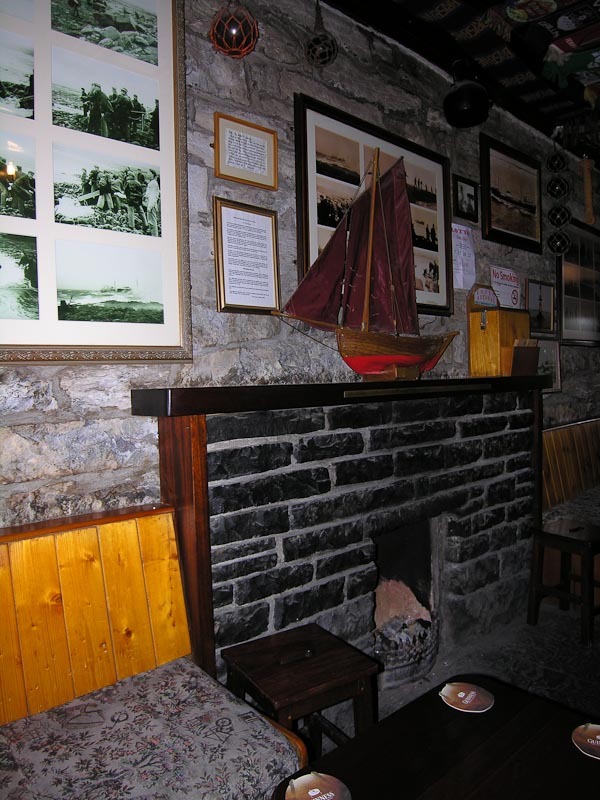 As we came back into Clonakilty, we decided to stop at O'Donovan Hotel lounge for a hot whisky to drive off the chill. We found this delightful drink last year after a cold wet day at Cashel. It is pretty simple, and we've recreated it at home with good success. It is basically just a shot of Irish whisky, lemon and sugar topped off with hot water in a mug. Lemon and sugar are to taste, you can also dunk a Barry's Tea bag in for more flavor. We picked up our laundry and did a bit of grocery shopping for dinner. We picked up some HP Sauce and a bottle of wine, and cooked up the steak and potatoes we purchased the night before. We tried a bit of telly viewing, but there were only three channels repeated five times. None came in well or had anything interesting, so we did a bit of reading and then up the stairs to bed. The morning dawned a bit grey, but we'd determined to take an excursion. We fueled up with eggs, sausage and muesli, loaded up the car and headed east. 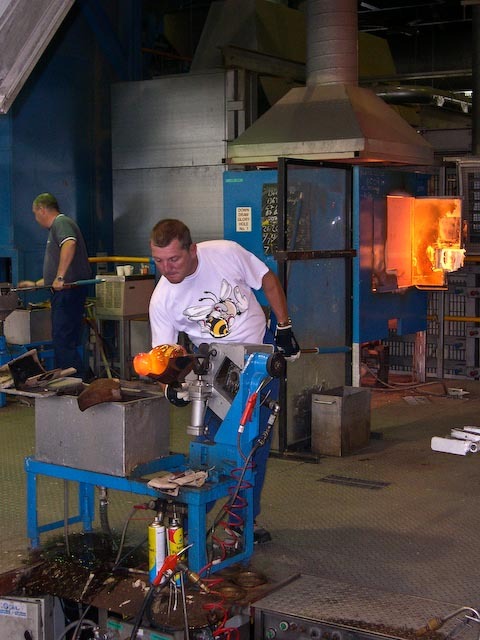 Our ultimate goal was the Waterford Crystal Factory, but we expected to get there in a leisurely fashion. We were not wrong and quickly made a detour at Midleton to visit the Old Midleton Distillery. It was a bit more pristine than the Jameson Distillery in Dublin, and we passed on the tour and went directly to the restrooms. After the break, we took a swing through the gift shop and picked up a few items for gifts. It is probably best to not purchase whiskey at the distillery unless it is a special bottling only available there. Most can be purchased for less at the duty free shop in the airport. You also don't have to cart it around the whole trip either. Nothing is more distressing than a broken bottle of uisce beatha in your luggage. We hopped back on the road and headed towards Waterford. The trip took longer than expected, but was easy driving on a major road. We made a lunch stop in the parking lot behind a pub. Sandwiches were produced under Karen's expert hand and we munched on bread, sandwich spread, meat and Irish cheese washed down with Club Soda. Back on the road and continued on towards Waterford. The only difficulty was a traffic slowdown coming into Waterford near the factory. We made is safely into the large parking lot and got out of the car. Much stretching ensued as we walked towards the entrance. We passed a lot of tour buses and sure enough, there were the usual track suit clad crowds milling around. We dodged the slow moving herd and after another rest stop, bought (expensive) tickets for the tour. We killed some time until the tour started and then cued up for a bus ride through the facility to the actual tour area. Our tour guide was somewhere between bored and apathetic, probably understandable as we were the last tour of the day. A brief audio visual welcome and presentation was next and then we were off to walk through the process of crystal making. Surprisingly it was quite interesting as you were watching actual work being done. The process is painstaking and lengthy. There was a fair bit of walking, but the track suit crowd held up well. Cameras were allowed in most areas, but the flash was discouraged or prohibited in some areas. I suppose a flash going off as you were doing some precise crystal cutting could be distracting. The tour ends predictably in the gift shop. This causes some interesting effects on people. Females become instantly energized, their eyes light up and they proceed to examine each type and kind of crystal as if they were actually going to purchase it all. Males on the other hand seem to go limp, the eyes glaze over and one hand clutches their wallet in a protective gesture. Scott blew through all the crystal and headed down to look at the other gift areas before Karen and Shirley covered a quarter of the floor area. 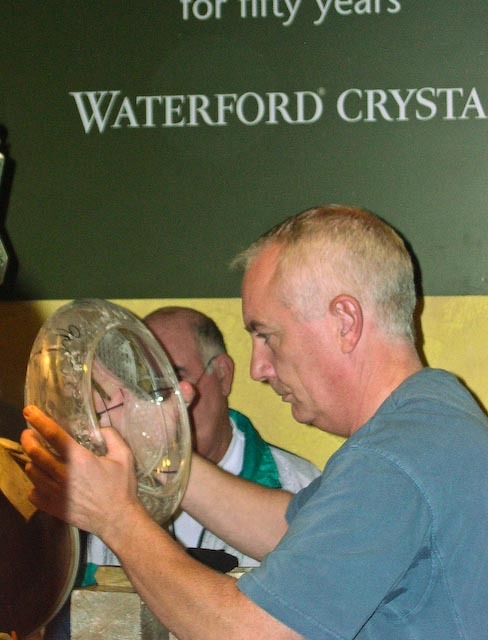 We escaped without devastating financial ruin, but did our part to support Waterford crystal and Belleek China. Once free of the temptation to consume, we began the drive back to the cottage. Nothing interesting happened or was seen as it was dark. Scott managed to stay awake and we arrived back without incident. We had some sandwiches from leftover steak and then began the long climb up the creaky stairs to the creaky bed. We decided to see what all the fuss was about Kinsale. 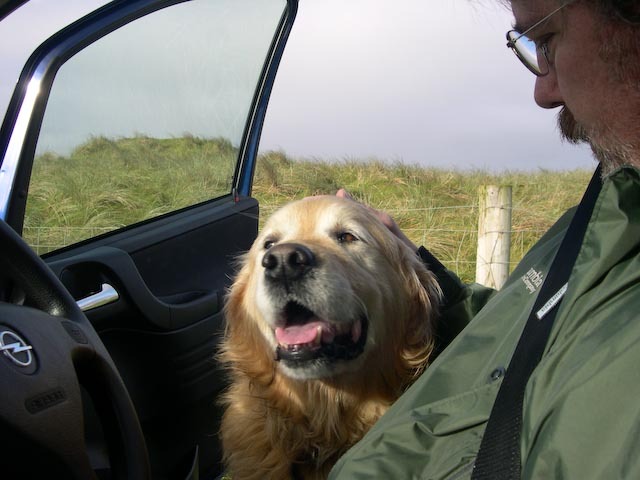 It was a short jaunt down the coast from the cottage and after a leisurely breakfast, we loaded into the car and off we went. 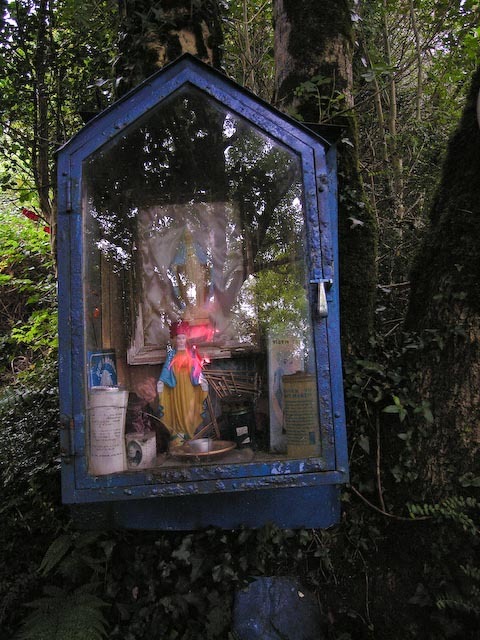 Along the way we passed Our Lady's Shrine at Ballinspittle. Not being ones to pass up an interesting site, we stopped for a few pictures and to read about it all. 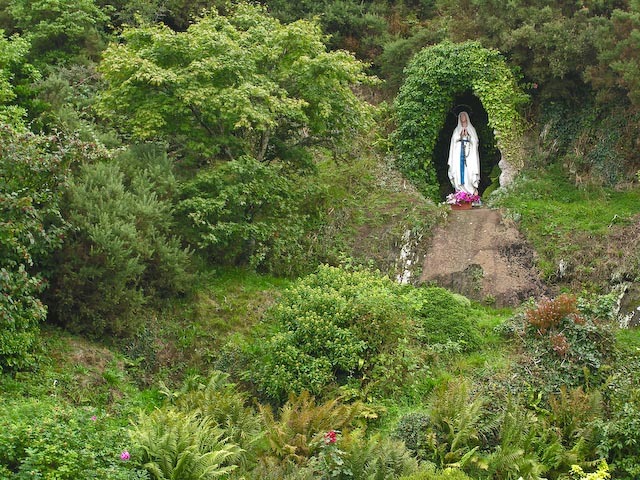 Evidently the statue of Mary has been seen to move on occasion and crowds gathered to view the next movement. I'm not sure if it was to have moved side to side or actually walking about. In any case, it appeared to be fixed in place during our visit. The crowds were singularly in absence as well and we observed alone. 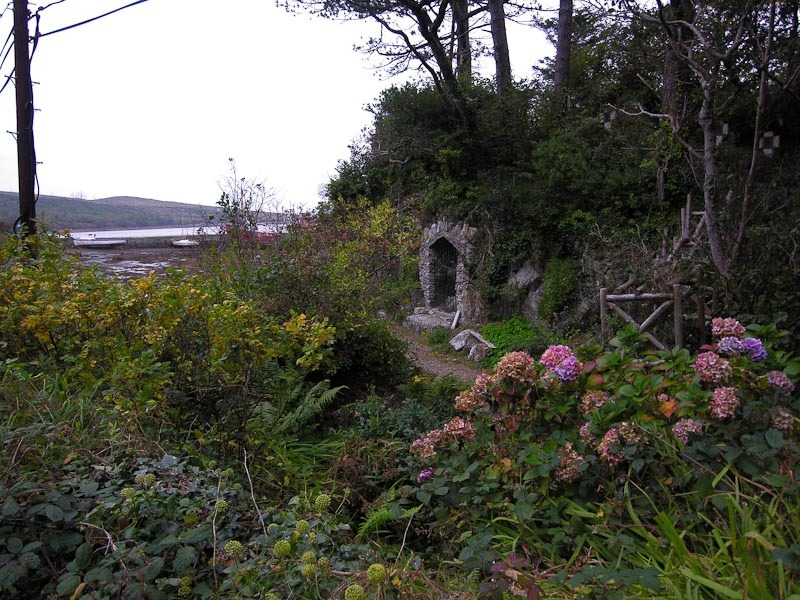 Several other ruins and points of interest passed by until we reached Kinsale. 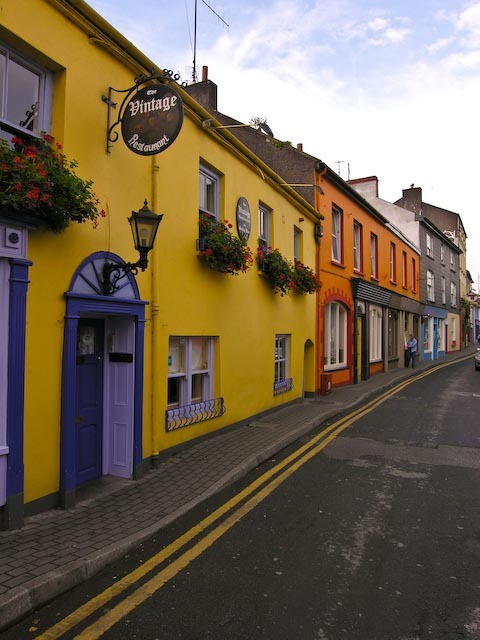 Now we've heard a lot about how charming, picturesque and wonderful Kinsale was. The houses and shops were brightly painted. Lots of shopping was available, but prices seemed to be high for all class of goods and food as well. The roads were narrow and steep as the town perches above the harbor. Overall I'd say it was overrated. There are many more charming towns and certainly better shopping. If you have not been around Ireland much and this was your first exposure, it could be impressive. We had lunch in a small pub and the food was average and the service poor. We'll give Kinsale a miss next time. Clonakilty was far more picturesque and charming. 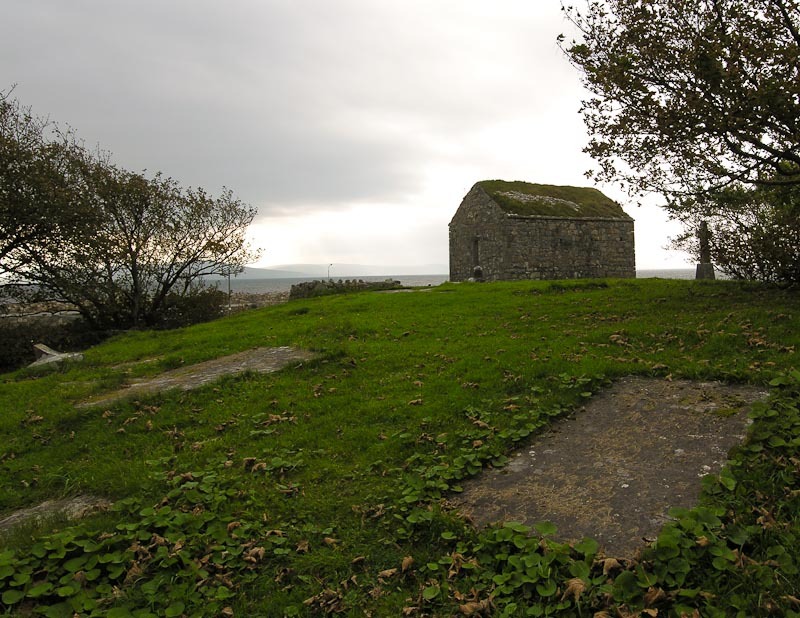 The more interesting part of the area is Charles Fort from the 17th century and James Fort from about 1600 across the bay. 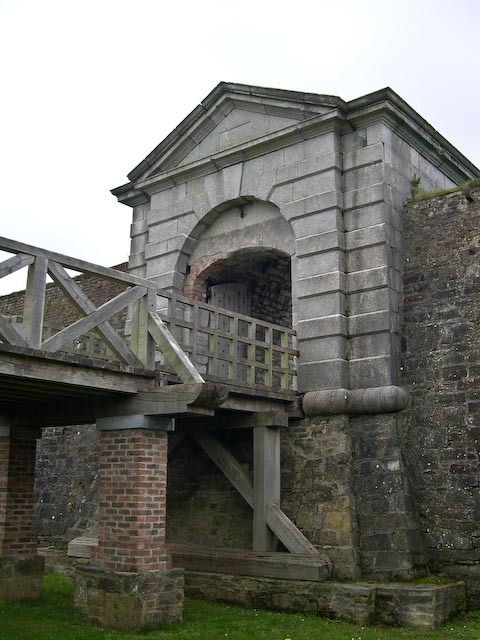 Charles Fort is a large and fairly intact structure. A large causeway into the fort is impressive and also houses the spot where they collect your money. We didn't see anything spectacular enough to justify the entry fee, perhaps next time. The wind was blowing off the water, and Shirley wasn't comfortable at the thought of the exposed fort. There were a number of sailboats out on the bay. We waked around the perimeter of the fort and took a few pictures of the heavy fortified walls. 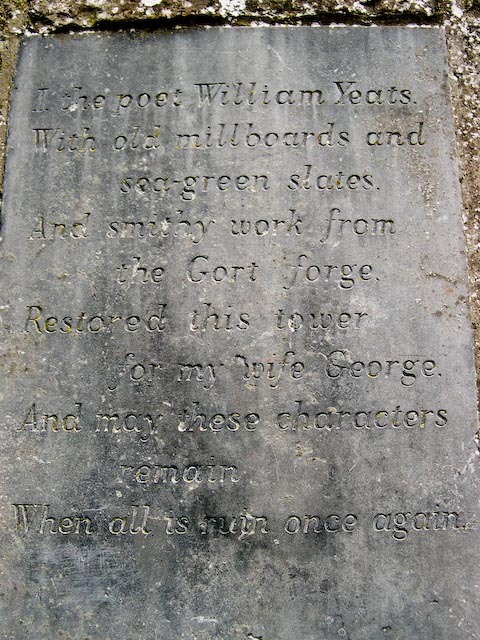 Driving around the bay, back through Kinsale we found a sign to James Fort. A short drive put us directly across the bay from Kinsale. Karen and Shirley didn't feel like and expedition, so I loaded up with camera gear and jogged up the trail towards the fort. The job quickly slowed to a trudge as the trail rose and wound around. Not to far up the ground opened up onto the top of the point overlooking the harbor entrance. Across the harbor, one could see Charles Fort. 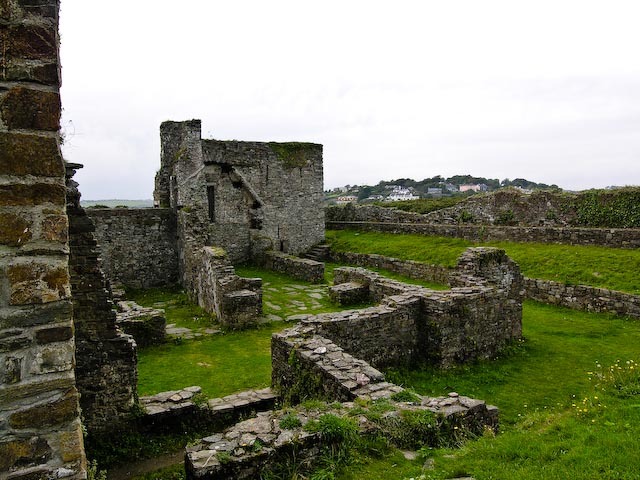 The ruins of James Fort were much more interesting to investigate and didn't have an entrance fee. 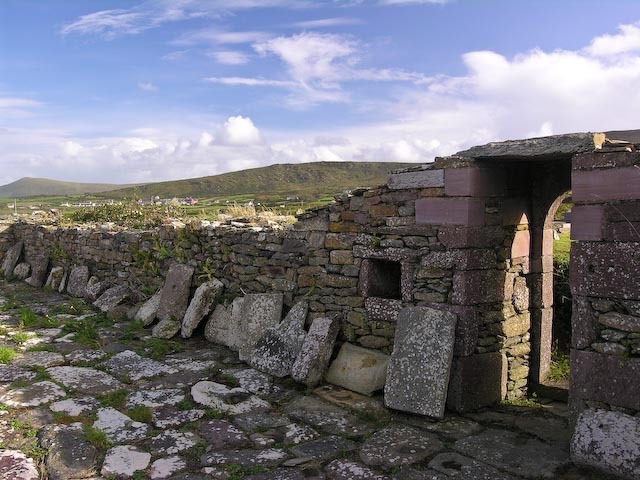 The walls were broken and little remained of the wall of numerous buildings inside the walls. I spent a happy half hour or so climbing and taking pictures before duty called and I headed back to the car. Along the way back to Shannonvale we passed a old stone house or barn, it was hard to tell which. The cows seemed comfortable near it, so my guess was a barn. Back at the cottage we had a nice dinner and relaxed with a hot whisky or scrumpy, depending on the preference. Obviously mine was finishing the last of the scrumpy. The morning dawned a bit grey with very low clouds. Very low, so low that they appeared as water droplets on the windows. A lovely soft Irish day. We took a leisurely approach to the morning and decided that some local excursions were in order. 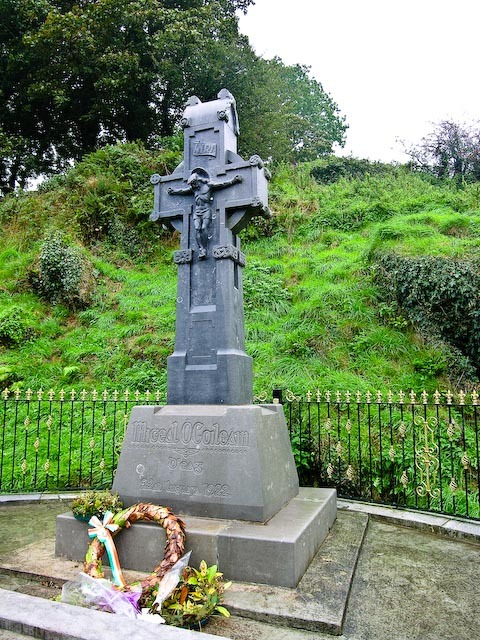 We would try to find the Michael Collins monument where he had been assassinated and wander Northward to the Cork Gaeltacht (Irish speaking region) around Ballyvourney. We made a brief stop in Clonakilty to get our bearings, accumulate any available instructions on finding the Michael Collins ambush site and to stock up on Club Soda and a few snacks. The ambush site wasn't to far away, near Bandon at a place called Beal na mBlath. 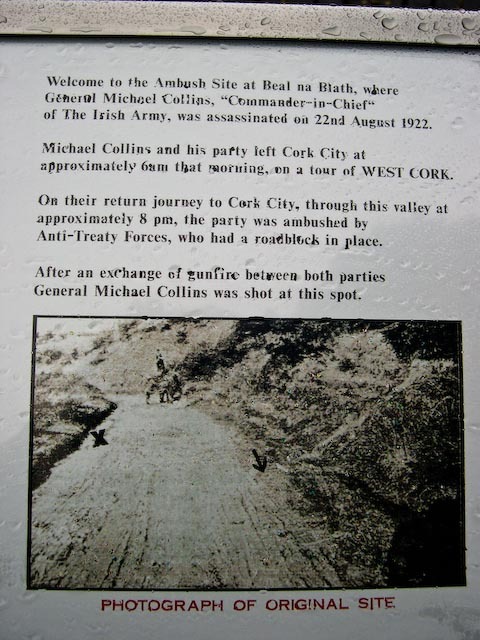 You can read the details of the ambush here and more about Michael Collins here. The ambush site appeared out of nowhere, as you'd expect a good ambush site to do. You're winding along a country road, overhung with trees and there it is. A large stone cross on a raised platform with a marker nearby. We parked and got out to take a look. There were flowers in several places and the site looks well visited although no one came by while we were there. An annual commemoration of his death is held on the spot. We had watched the movie Michael Collins (well played by Liam Neeson) before we left and had a read a book or two as well knowing we'd be in the area. We left quietly and headed further North. Further along we saw a sign to a toy soldier factory. As we appeared to be in the middle of nowhere, finding a town let alone a factory seemed amazing. We followed the signs and after much winding, twisting and turning, the road led to a toy soldier factory. The factory is 3 km from the N22 between Cork and Killarney. The travel time from Killarney is 35 min and Cork 50 min. Open 10 to 4p.m GMT on Saturdays and Irish Bank Holidays. Fortunately for us, they were open and in we went. The place is actually called Prince August Toy Soldier Factory. 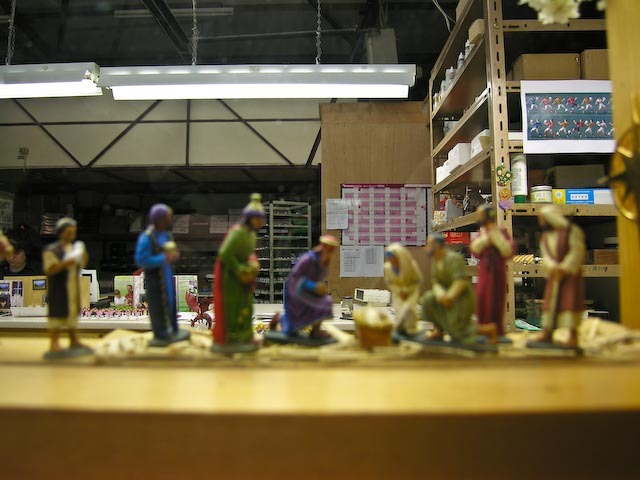 They have a nice sized showroom with all manner of figurines, both finished and unfinished depending on your creative abilities. They also have tours where you can see the molds and figures being made. You can also purchase molds and metal (usually pewter) and make your own. We purchased a couple of kits as gifts. It was nice to see such unusual entrepreneurship in such a remote location. If you are in the area, it is well worth a visit. We had to retrace our steps back to the main road and towards Ballyvourney, but there was beautiful scenery along that way as evidenced by the panorama below. Ballyvourney in Co. Cork is a lovely little town on the way to Killarney. 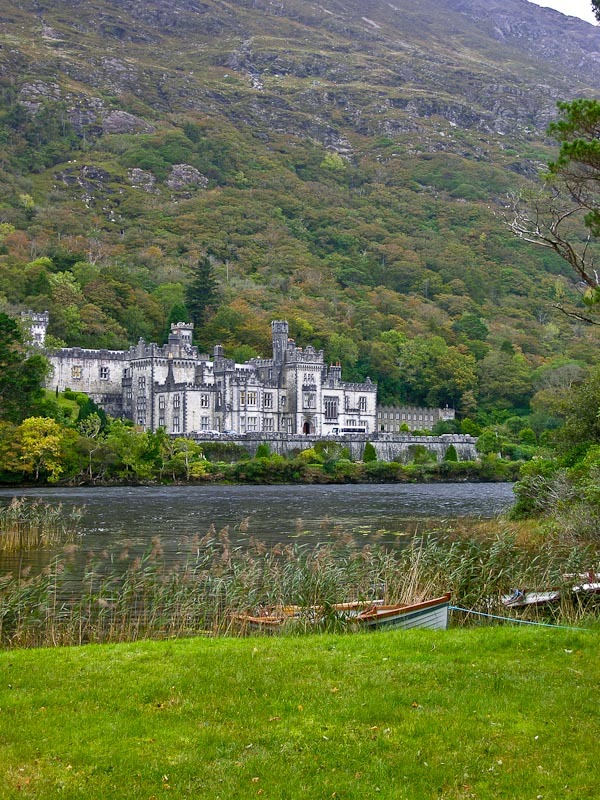 We didn’t actually intend to go to Killarney, but traveling in Ireland is like that. You end up where you least expect. We were minding our business, wandering along the countryside of Cork with no intent on entering Co. Kerry. 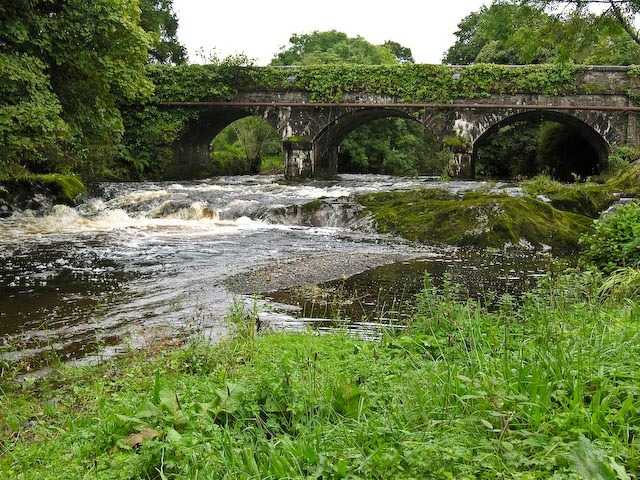 We stopped in Ballyvourney as there is a nice stone bridge across a large stream running through town. We crossed the bridge, turned around and found some parking. The road was fairly busy for its size and we watched our parts and the cars parts as we got out and headed towards a fence by the bridge. No sooner had we started taking pictures than a loud thump thump sounded behind us. Something clattered along and landed a few feet away. No sooner had we registered the presence of a still rolling hubcap than we heard more thumping and clunking sounds. A car was limping along across the road and pulled into a drive. It was listing hard to the right and both tires were flat. We grabbed the hubcap and went to investigate. An American couple was out and examining the remains of two perfectly good tires. Not only were the tires shredded, but the wheels were severely dented as well. Pretty much a total loss. Evidently the husband had grown tired of driving and in spite of the fact he was the covered driver and his wife didn’t see well, he’d had her drive while he took a nap. She did fine for a while, but as she entered the town she followed the road and was driving in the parking lane. Unfortunately the parking lane ended with a high curb and she ran over that with both tires. Her husband was rudely awakened and none to pleased with the outcome. Of course the spare didn’t fit the car, not that it made a difference with two dead tires. The town had only petrol and no garage. The nearest garage was in Killarney. 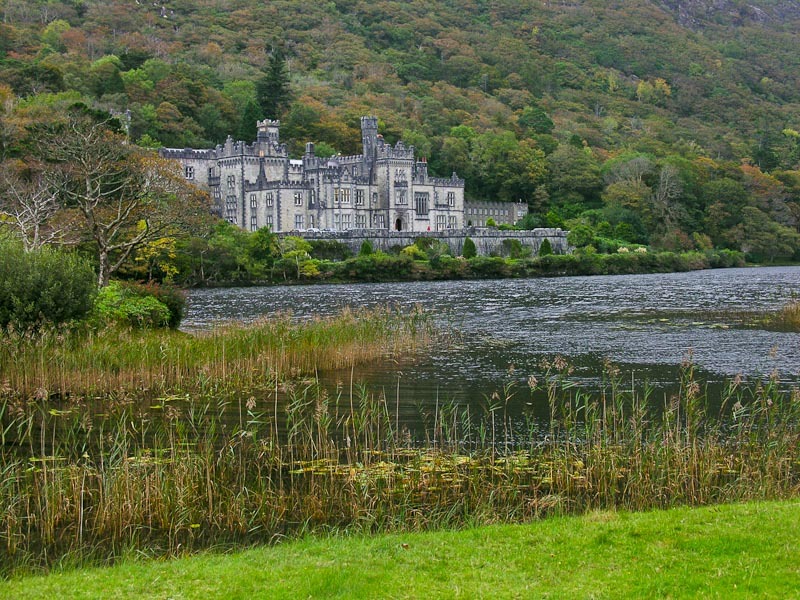 We offered to take the wife into Killarney while the husband stayed to guard his golf clubs. 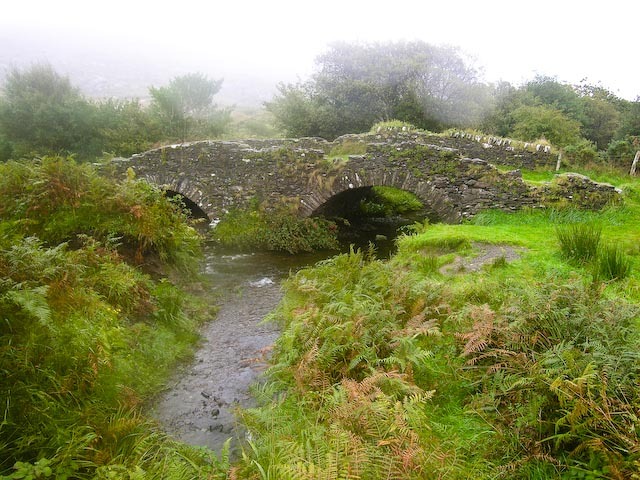 Thus we found ourselves going into Co. Kerry, a good distance from our cottage. We arrived in Killarney, found a garage and got her sorted out. The owner was in a good humor (saw the Euro signs) and chuckled at the mishap. One got the feeling that it wasn’t the first time. He found two new wheels and set about finding tires. She arranged to have them do the work and we left her happier but several hundreds of Euros lighter. We stopped to wish the husband well and told him his wife would be along eventually with the garage owner and tires. The owner of the drive and house he was parked in had come home and they were in conversation. He thanked us a bit more cordially this time and went back to his chat. The moral of this story is don’t drive in Ballyvourney if you can’t see well, and stay out of the parking lanes or else your car is due to be retired! More lovely vistas ensued on the return journey. 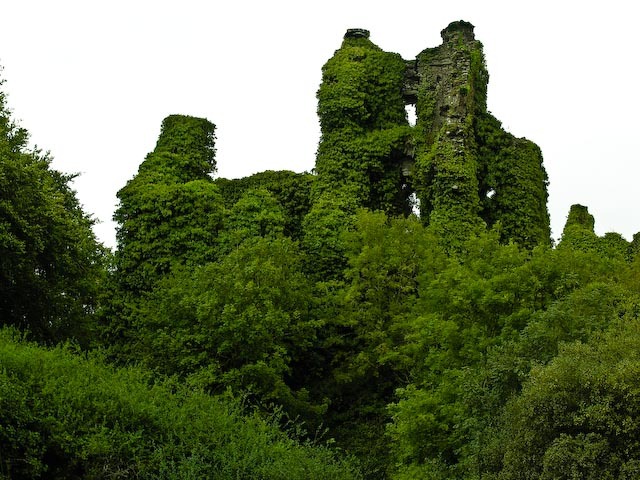 On the return we stumbled across a ruined castle so overgrown with ivy it was all but invisible. It was situated next to some class of a stone or gravel quarry. The growth was so heavy, very little of the castle was visible except the outline. As we drove away a herd of sheep caught our eye. We pulled off the road to take a look. As we were taking pictures they began to slowly move in our direction. They seemed to be moving with purpose. Visions of carnivorous sheep began to dance in our heads as they continued to approach. Possibly they thought we were going to feed them, but rather than risk being the feed and starring in some low budget horror flick like "Murdered by Mutton" or "Rammed by Ewe", we beat a hasty retreat. As most of our day was taken up by the unexpected trek to Killarney, we headed for home and a quiet dinner at the stable. 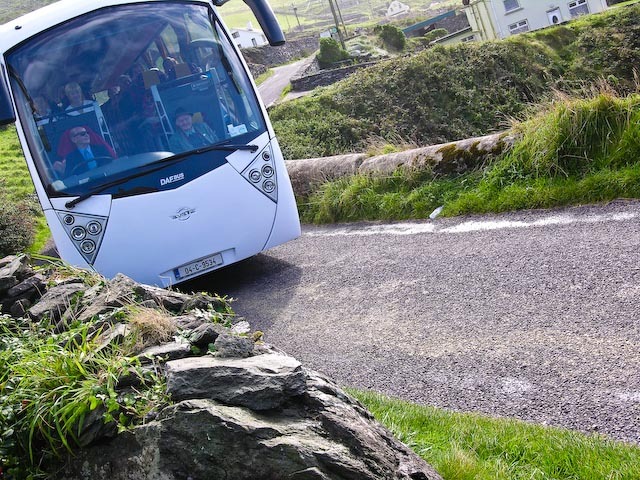 Up early this morning as we were off on an expedition to Mizen Head via a winding route. 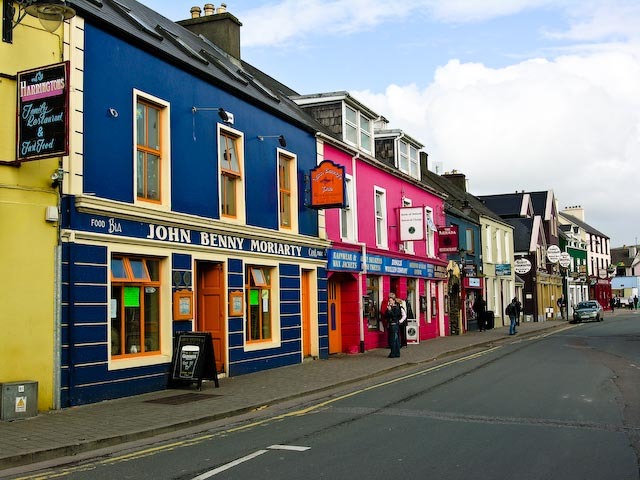 We passed through Clonakilty on the N71 on our way towards Skibbereen. The day was bright with clear skies and a few puffy clouds. We passed many cows and only had to stop to visit with a few. A field of donkeys caused another stop, and so did a ice cream break. We ran into a local gentleman indulging as well. "Better than a pint on a hot day," was his opinion. Eventually we rolled onward. The sun was shining, and we had nothing but time. We didn’t really intend to go to Baltimore. 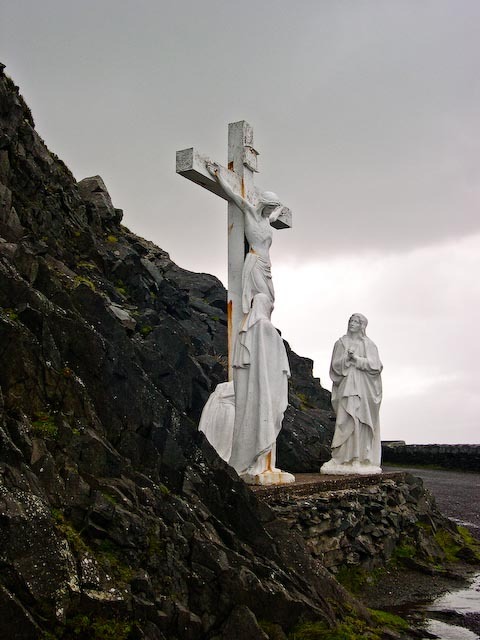 It was just on the way to Mizen Head. Not directly, we did have to detour, but what a detour. This should be a primary destination, not an afterthought. My wife saw the signs and said she’d heard it was a pretty place. It wasn’t far out of the way, so off we went. The town of Baltimore is a bit upscale and has some interesting history. The town was attacked by Algerian pirates in June of 1631. Two inhabitants were killed in the attack, and around a hundred people were captured and taken away as slaves. 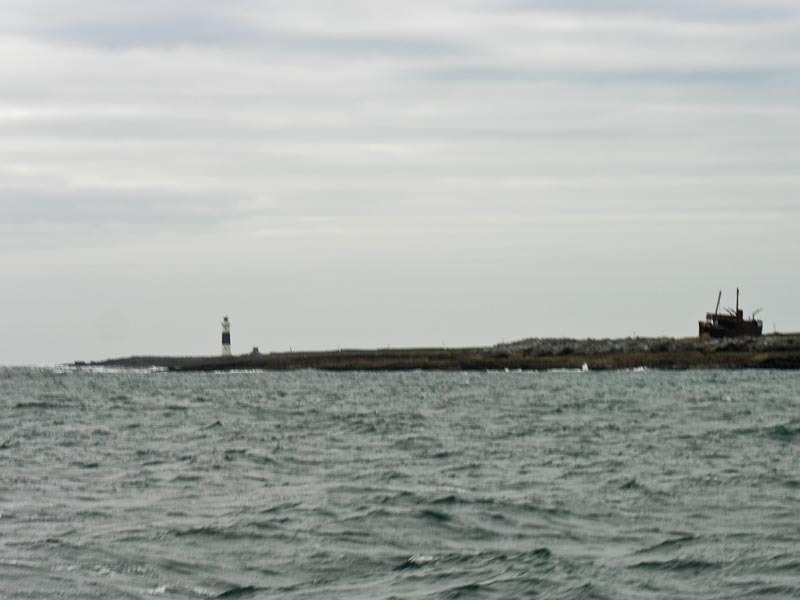 As the pirates had an Irish pilot from Dungarvan to guide them and those kidnapped were English settlers, some question as to the real motive exists. 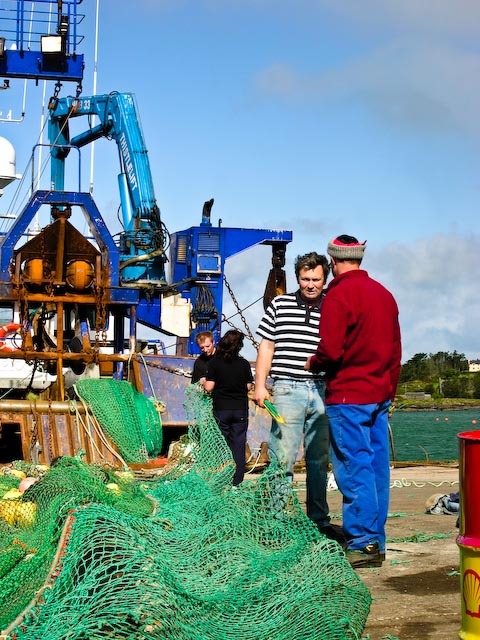 There is still a strong link to the sea with a vital fishing and boat tour industry. The houses are neat and well kept, and the town is a major summer destination. The view along the top down into the harbor is very nice. 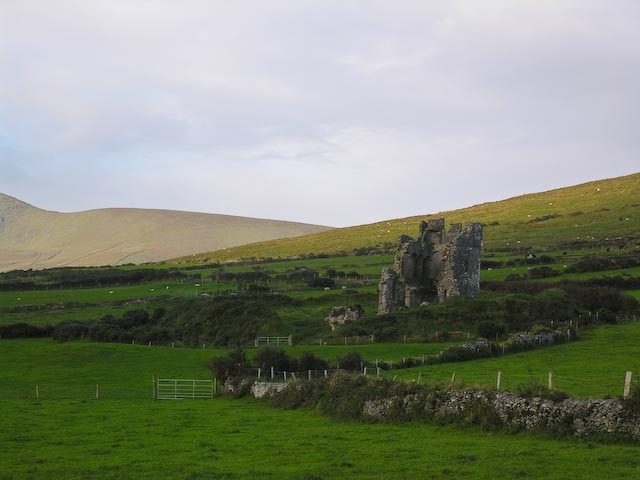 O'Driscoll Castle or Dun na Sead looms over the town. We parked along the narrow road and walked to a restaurant for a pint or pot of tea respectively. (we also had to use the restroom). Public restrooms are not common but pubs are. It seemed counterproductive to go into a pub and buy a pint or tea to use the restroom. I suppose you could dash in and out, we did occasionally, but felt it a bit gauche and we’d have missed some great chats with the barkeepers. The view from the restaurant showed the harbor below with fishing boats readying for a day on the water. After we finished, we walked down to the quayside. 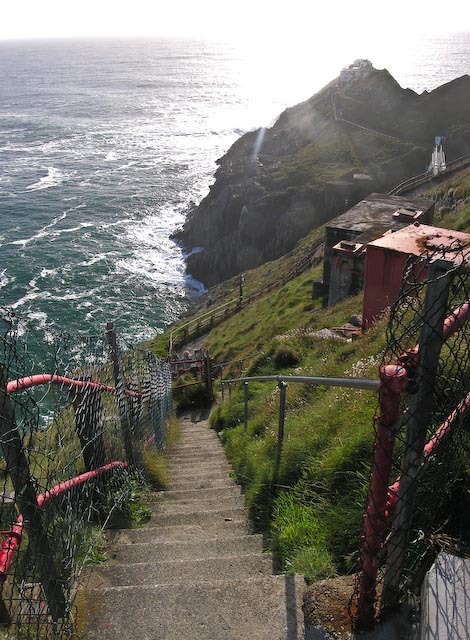 It is a steep walk down with a gift shop and various shacks to charter tour boats and fishing trips. I wandered further out onto the docks and watched the fisherman prepping the nets and cleaning the boat. They’d either been out all night or were getting ready to go out. The air smelled of oil, diesel and fish with a lot of salt air to dilute it. The seabirds circled around looking for snacks. 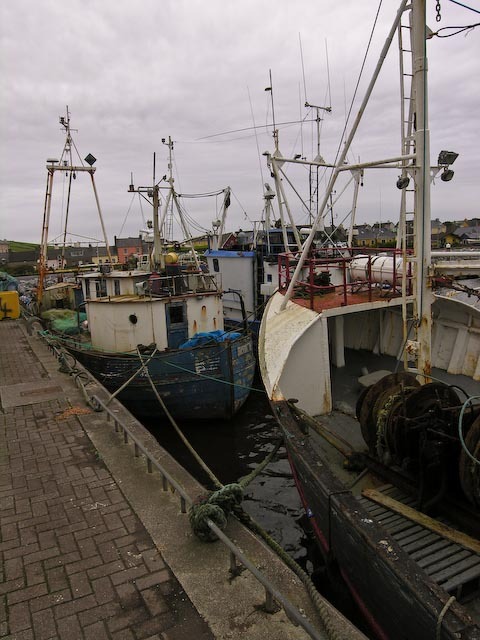 Three large boats were idling alongside the dock while the nets were being hung out. The gift shop proved to be a little funky place with a variety of hand made items and art from the area. The prices were reasonable and we picked up a few small items. We didn’t stay long, but this would be a good spot to while away a week. 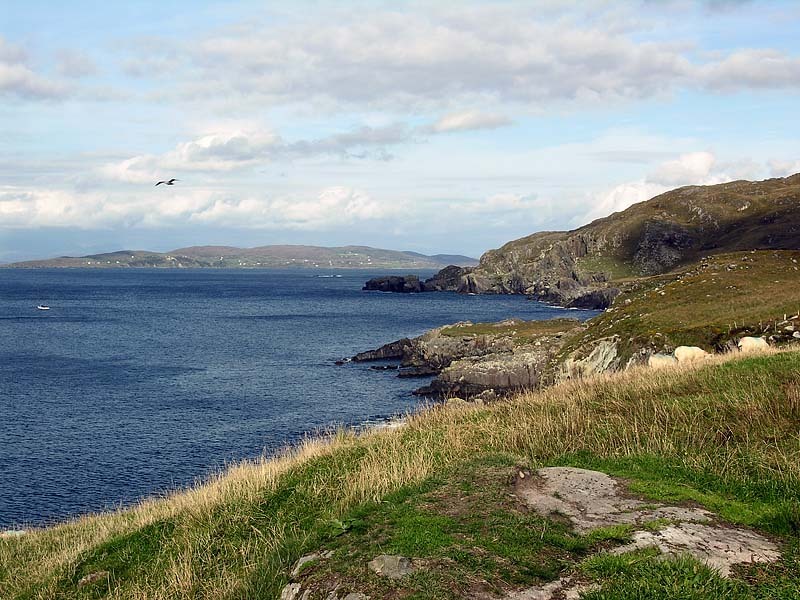 There were several good boat tours to the islands of Sherkin and Cape Clear. We drove up and further west to Schull. Schull is an interesting small town with winding roads, built on a hill with many small houses and shops. We stopped there on the way back for dinner at the Black Sheep Inn. We drove through the town slowly as the streets are narrow and crowded. We saw some interesting art in front of a house, but on closer inspection, not so good. 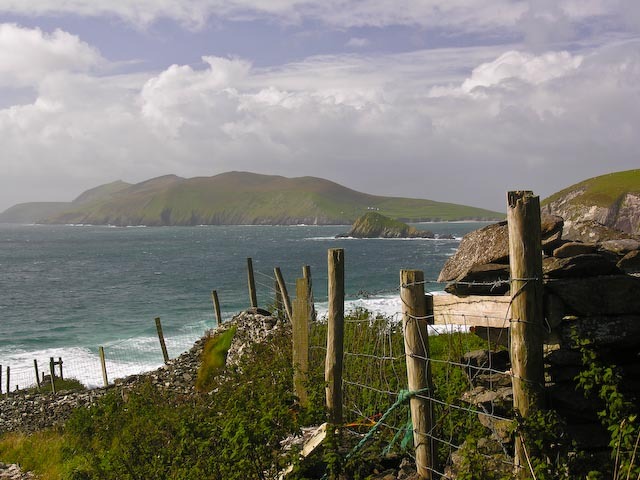 Onward towards Mizen Head. The road is winding and narrow with very little traffic in early Autumn. Vegetation is sparse in some spots and lush in others, and the road is dotted with small farms and ruined remnants of small houses. 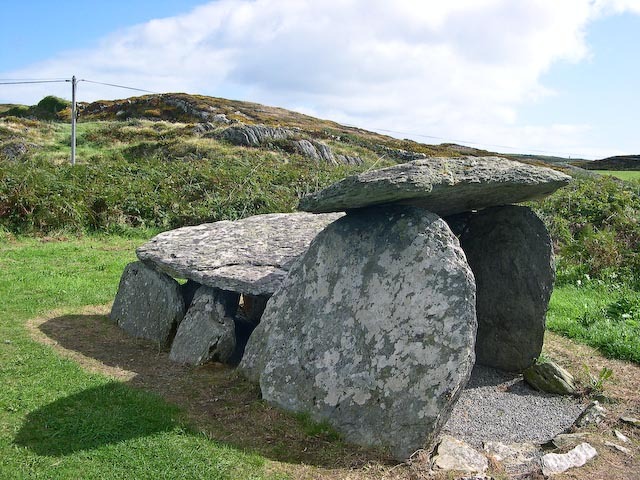 We saw a sign off the road and swung into the car park to find a sign for a wedge tomb and sure enough there it was. We stretched our legs a bit and admired the scenery. Karen found a few geodes down along the shore. All around the heather was in bloom and the yellow gorse flowers provided intense contrast to the purples. The road was dotted with small cottages and farms. Some were ruined shells with cows wandering around the walls. In the distance of the image at the right you can see a lighthouse far offshore. We finally came out along a high lookout over a bay. There isn’t a lot of room to pull off the road, but the view is well worth it. We took several photos including a nice panorama of the view from sandy beach to ocean. 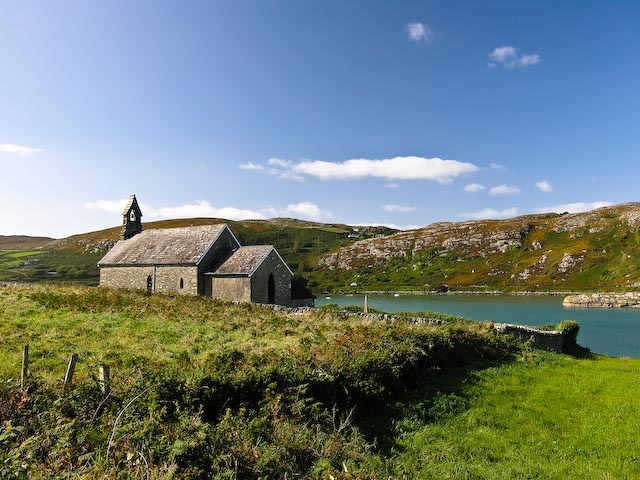 Along the road was a picturesque stone church alongside an inlet from the bay. Further down the road a stone tower stood watch over the water. We stopped for lunch at a small cafe for Irish sandwiches and a cold drink. There was an interesting gift shop attached with decent prices as we were pretty far from anything. A pair of donkeys provided some comic relief nearby. We were told to look, but not touch as they had a tendency to bite. 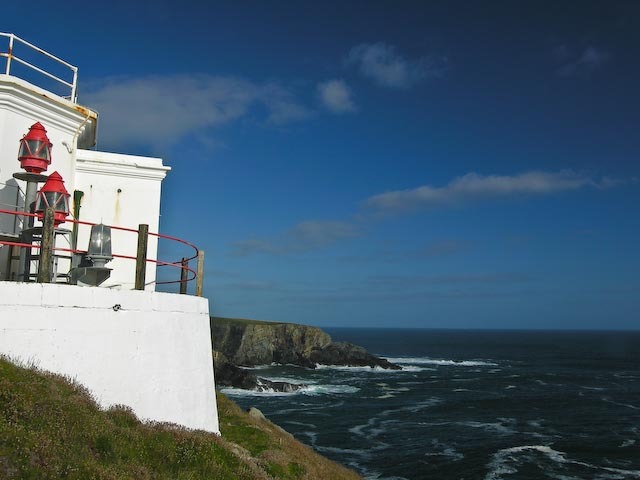 Traveling further along led to the end of the road and the Mizen Head Visitor Center and Signal Station. 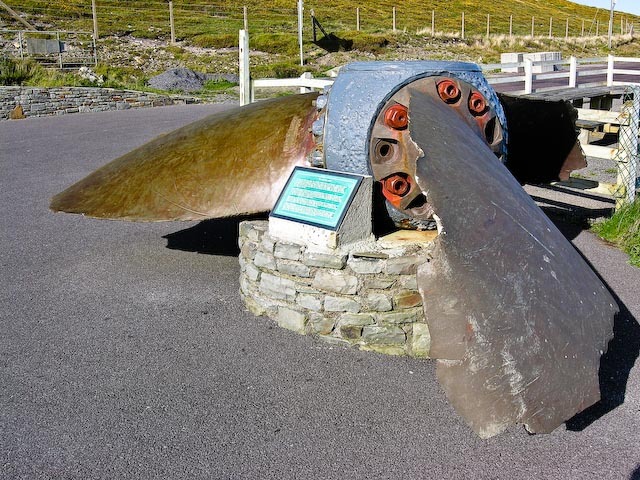 In the car park is a large propeller from the SS Irada that sunk off of Mizen Head in 1908 during the building of the Mizen Head bridge. The lighthouse keeper and builders help haul the survivors up the cliffs to safety. 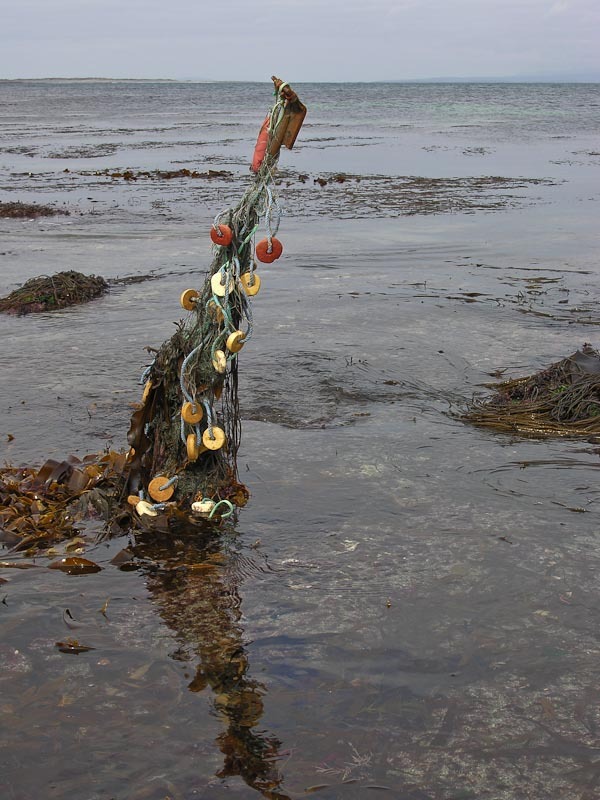 The propeller was salvaged in 1994 and installed in memory of the multiple wrecked ships in the area. The plaque explains the history. There are good views from the car park for the less adventurous who don’t wish to walk out to the Signal Station. The view immediately to the sea from the propeller is spectacular. 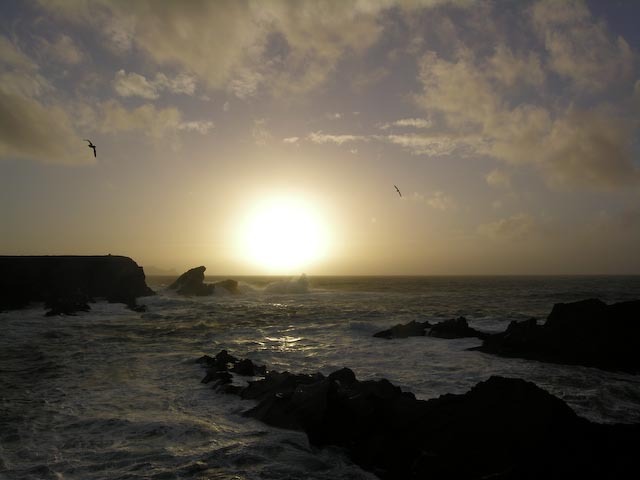 The waves crash into the rocks below and shoot high into the air. 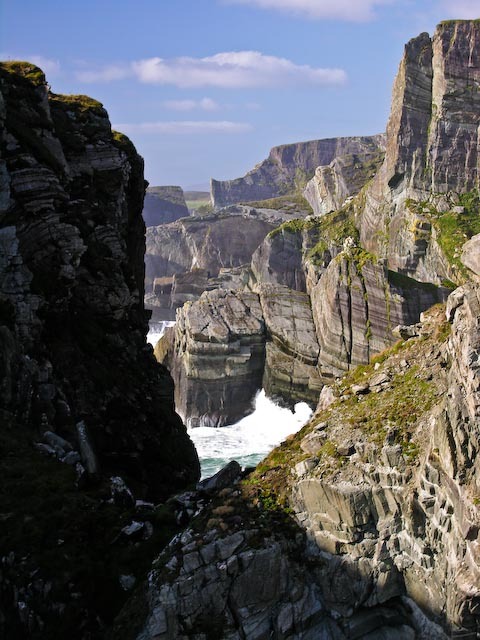 The Mizen Head Visitor Center is small but interesting to walk through. 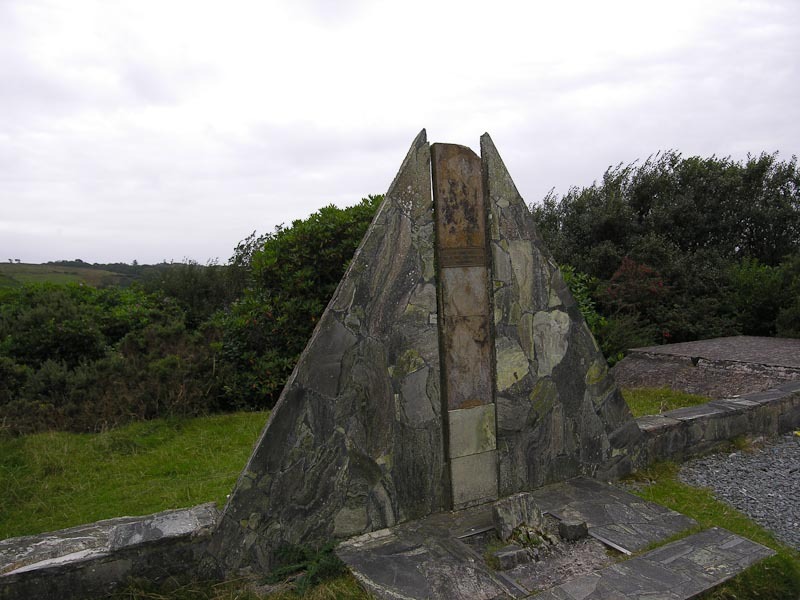 It contains the history, wildlife information, models of the lighthouse and other information and displays related to the Signal Station. At the time there was no charge for admission. It has a small café with tea, coffee, drinks and snacks, a shop with various tourist items, and restrooms! Very important as there is little else in the area other than nature. You can purchase tickets to the Signal Station at the Visitor Center. The tickets are 6 Euro for adults and 18 Euro for a family. Make sure to look at the brochure to get a feel for the trek out to the Signal Station. It is not appropriate for small children or people who don’t like some walking and climbing. It is also not a good place for people who don’t like heights. A ticket permits you to walk down the walkway to the Signal Station. It is a good distance away and a good ways down. You can see the bridge crossing over a deep chasm between the rock outcropping. First though you must navigate a series of stairs (99 to be exact though it feels like a lot more). They claim this is a 10 minute walk and it probably is for a spry person going down. I’d be willing to bet it is twice that coming back up. Watch your step as the stairs are narrow and you’ll be looking at the view instead of where your stepping. 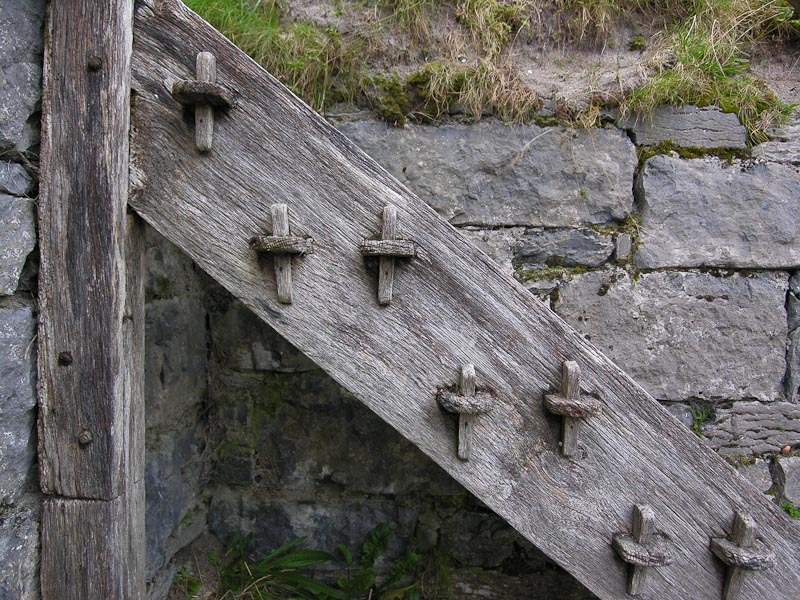 The stair could be wet in some conditions and the wind varies, but can be quite strong. Take time along the way to stop and view the cliffs and ocean. The ocean pounds into the rocks below creating spectacular jets of spray. If you’re lucky, sail boat may be offshore creating a picturesque scene against the sky and water. 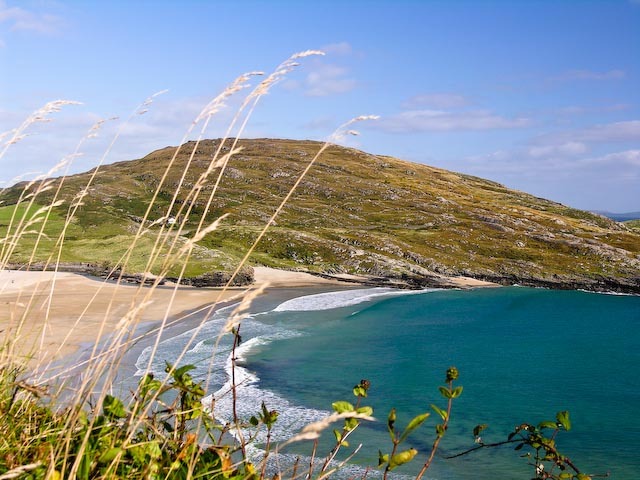 There are also dolphins, whales and basking sharks occasionally visible in the water below. Depending on the weather conditions, you’d probably have to have a pretty sharp eye to spot them. A variety of seabirds circle above, be careful when looking up. Approaching the bridge you can see open ocean to the right, a deep drop into churning water below and rock walls narrowing to a rock wall to the right. The view to the right between the rocks let you view down the coastline to cliffs, pounding waves, white spray and green hillsides. If you don’t like heights, don’t look down as you cross the bridge. The metal grate is open and you can see water and rocks far below. The best view is to the right and it changes as you walk along the bridge. It is worth walking slowly and viewing the changing vista. It may be difficult to take pictures as the wind is quite fierce and the bridge can vibrate. I had difficulty in getting high enough shutter speeds to make up for the movement. After crossing the bridge, the path curves up and around to the Signal Station. The wind picks up considerably and anything that isn’t firmly attached is going airborne! There was a retired gentleman there to check my ticket. I can’t conceive of anyone getting out here any other way, but there you have it. I’d like the job when I retire. The walk would keep you fit! He also provided answers to questions and a wealth of knowledge of the area. The first building is the Signal House. It contains signal flags, their history and usage and a repeating video. Most of the radio equipment and other instruments are intact and labeled with their function. In the next building there is a recreation of the keeper’s bedroom and kitchen. There is a passageway that simulates being underwater with scenes, wrecks and critters. It is a bit cheesy, but well intended. The actual main room of the lighthouse had interesting displays of bird eggs, maps and other relics. Now the real adventure! Walking back out and alongside the building takes you out to a narrow walkway. One the right is railing and beyond a sheer drop down into frothing surf as it crashes along a narrow channel back into the rock. The water looks like whipped cream and is constantly white and foamy. Out here the wind is intense and the spray is heavy in the air. The entire area is surrounded by railing and a narrow walkway goes out to a small viewpoint. Only one or two people can be out here at one time and they’d better be close friends! If you’re going to be taking pictures you’ll need a cloth to keep the lens clear of spray. The sun was intense and cast a lot of light off the water. The water below is mostly white foam with large green waves surging in to dash against the rocks. Depending on how crowded it is, you can spend a few minutes or a half hour here before the wind batters you into submission. Brace yourself for the trek back. The walk isn’t bad until you cross the bridge and come to the infamous 99 steps. These seem to multiply on the way up into 199 steps. If you’re out of shape, the spectacular view gives you an excuse to stop often. After the steps the trail switches back and forth still rising until you reach the Visitor Center. My wife had elected to stay with her mom at the Visitor Center, partially out of concern for her and partially out of concern about the height of the bridge. I tried to tell her what she’d missed, but it was difficult to convey the scope of the wildness of the view and surrounds to someone who hasn’t been there. The pictures just scratch the surface of the intense elements and power of the sea. This is a must see for the adventurous traveler in the area. I’d recommend driving from Cork for the opportunity! We wandered into Schull later in the evening. We were tired, battered by wind and spray, and looking for some food and drink. 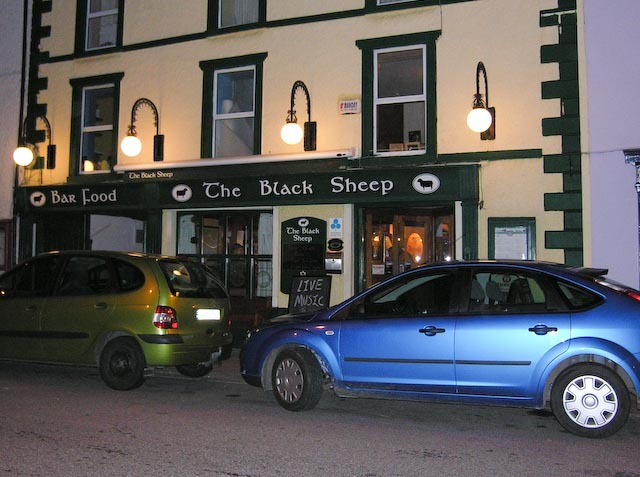 We spotted the Black Sheep Bar in the town center. How could you not try a place with a name like that. We entered somewhat bedraggled from the elements, but felt right at home. 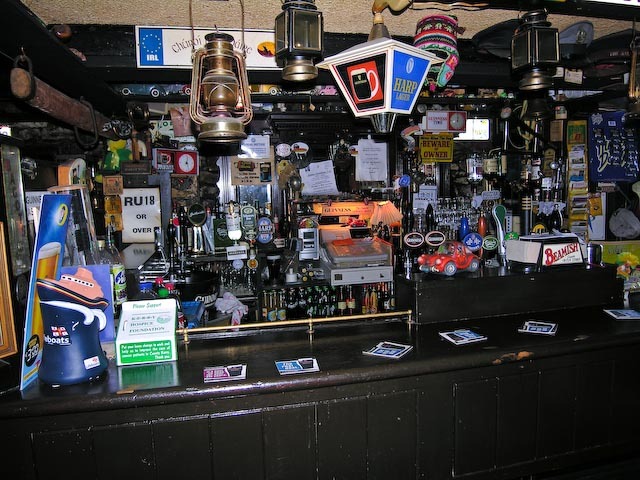 The interior is more a pub than restaurant. The inside is warm and comfortable, with a variety of tables and booths. It was fairly crowded as we entered, but we secured a table in the upper section against the wall. One side had chair seating and the other a padded bench running the length of the wall, shared by other tables. We got situated, grabbed menus, and ordered the usual pints for my wife and I and a whisky for mom. The menu was the usually pub fair with some interesting additions. Chicken pot pie looked good as did the fish and chips. They looked less greasy, with less batter than the usual gloppy mess one sees in pubs. The food proved good with substantial quantity. The pints were good, and we ordered another round while we relaxed. Subsequent conversation was struck up with the adjoining table. It turned out our neighbor was a real neighbor. He was a local that had moved to the Seattle, WA area, and was down on a fishing trip to the area. We chatted about the Pacific NW, Schull, and his landscaping business. He was killing time before meeting his wife and son for dinner. You never know who you’ll run into in an Irish pub. Make it a point to chat with your neighbors! We arrived back in Shannonvale well after dark. A little windblown, sunburned and ready for bed regardless of mattress quality. Leaving Co. Cork we made our way up to Co. Kerry. We passed through Killarney without stopping (as usual) and detoured a bit around to miss the ever present traffic and mass of tourists and buses. Finally we made it to Dingle and after a short break for bio purposes and a brief bit off grocery shopping, we were off for Slea Head and Ballyferriter. 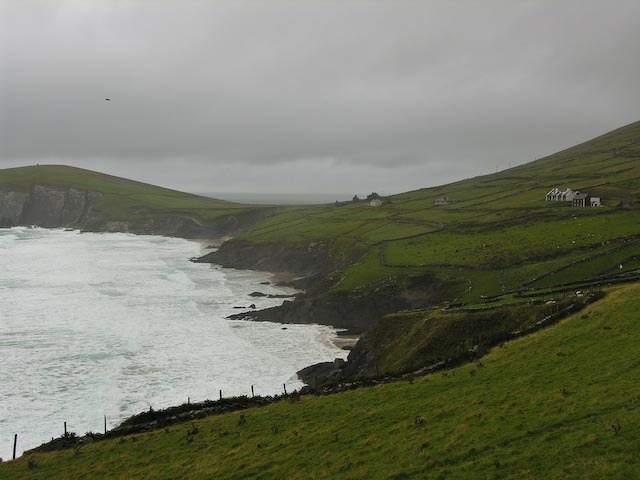 The weather was overcast and stormy, but the view from the viewpoint near Dunquin was spectacular. 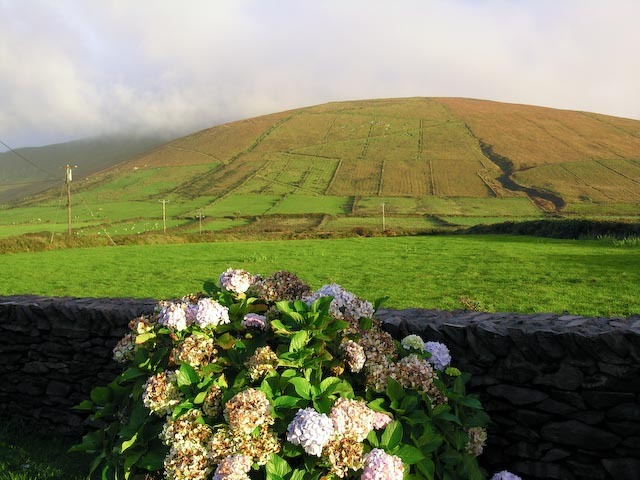 We went up to Suantra Cottages in Ballyferriter on the Dingle Peninsula. 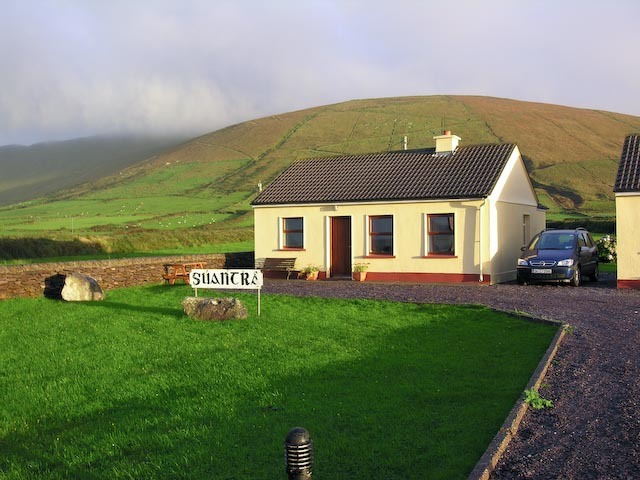 These small, sturdy cottages are the perfect haven on the Dingle peninsula. The wind and rain can really pound out in this area of the peninsula as there is little to break the wind except the next cottage over. The walls are of concrete block and the windows are strong and keep out the wind. There are three good size bedrooms with comfortable beds. Each room has closet and dressers and plenty of room to spread out. The bathroom has a good sized shower/bath and is quite large for an Irish bathroom. There is a back door out to a small backyard area with a clothes line and laundry shed. In the laundry shed a small and well aged washer and dryer struggle to keep up the demands on their meager resources. These are coin operated and should only be used as a last resort to the laundry in Dingle. There is a good sized kitchen area with dishes, pots, pans and all classes of knives and utensils. A small refrigerator performs admirably in keeping your foodstuffs cold. There is a kitchen table that holds six comfortably and is also perfect for planning your next excursion into the great outdoors. A bookshelf holds a selection of garage sale bestsellers and magazines to read in front of the fire. 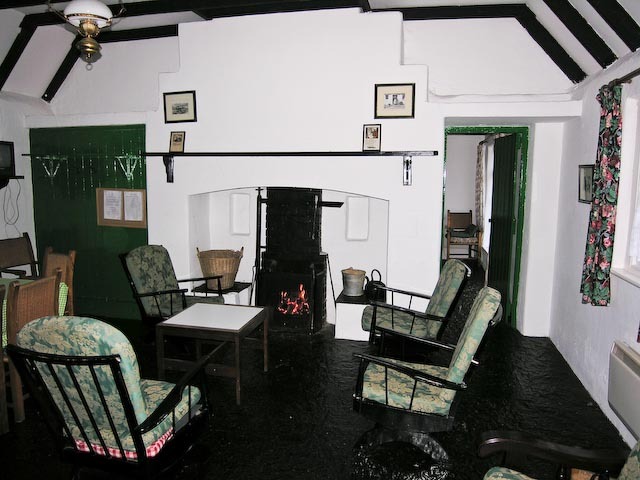 The living room has two couches and a couple large, comfortable chairs for lounging with a hot whisky before the peat fire. Peat can be purchased in any store in town, but will probably be provided in a large basket next to the fireplace. There is a small TV, but the reception is poor although the local stations can be interesting to watch. We loved the Irish language soap operas. In the front is a graveled car park, you can pull up right next to the door for quick unloading during storms. A optimistic picnic table or two is out front in the grassy area. We did use it one night when we returned from the pub to look at the stars. The sky was perfectly clear and midnight blue and covered with bright stars. There is no way to describe it unless you’ve been in a place with no artificial light around and no pollution. The view out to Clougher Head and across the bay to Ballydavid is beautiful no matter the weather. We were often treated to rainbows over the waves. 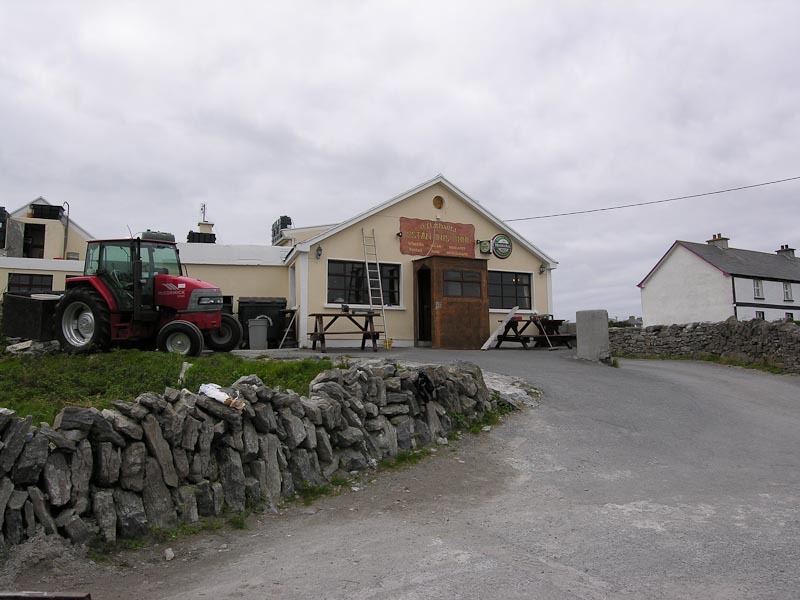 The cottages are a short distance from Ballyferriter and several good pubs. If you want groceries, the Black Cat Shop down the road has a small selection. 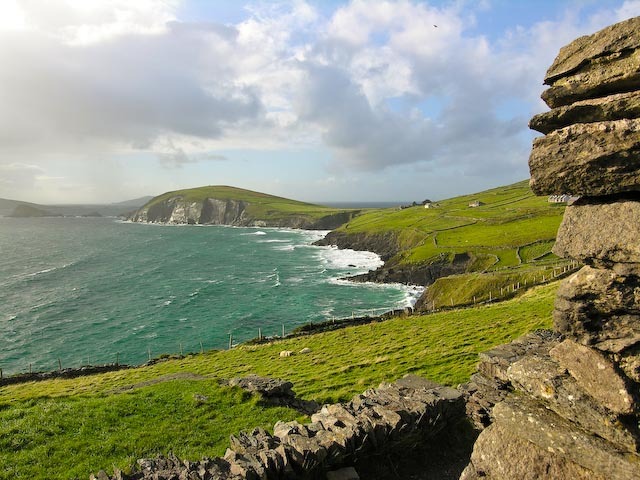 For more items take a 20 minute drive into Dingle. The area is strewn with walking trails, ruins and sites of interest. Directly out from the cottage and slightly to the left is a road that leads to the shore, my wife found a number of fossils in the rocks. 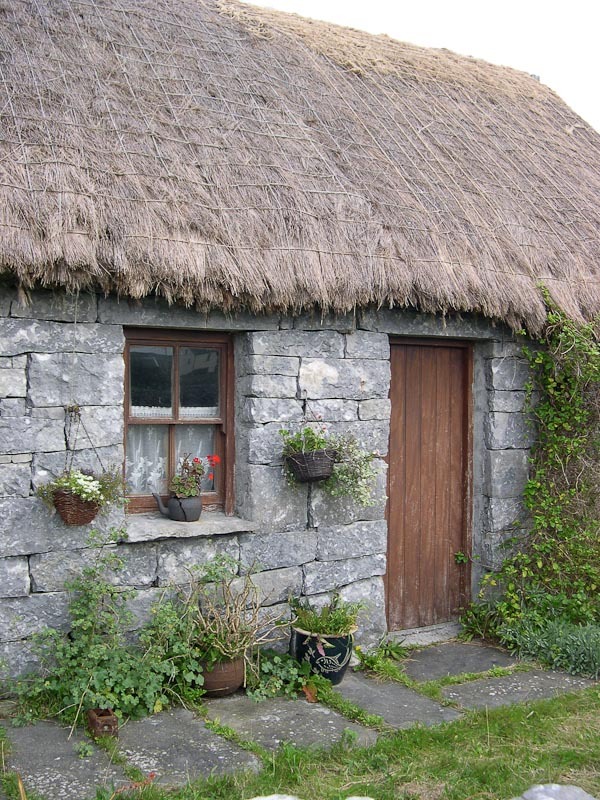 Find a good map and use the cottage as a central point to make day trips. Karen and I arose early and went for a walk to stretch the legs after a day of driving. 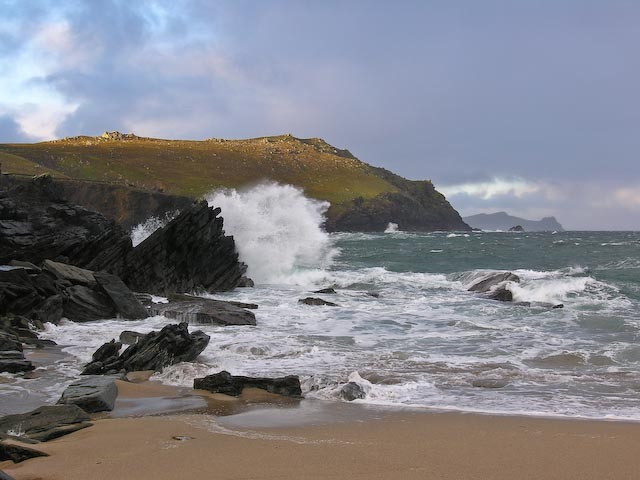 The weather was still soft and we were showered lightly as we walked along the road towards Clougher Strand. A small car park littered with broken bottles and other detritus looked discouraging, but we tromped on. Once past the car park, the sand sloped down to the water. The sand was clean and bright after a night of rain and high tides. 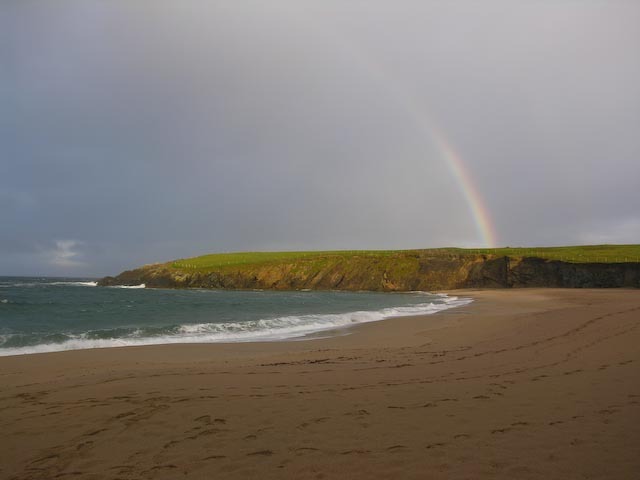 As we walked onto the beach, the sun broke through and a rainbow appeared to the North. Shirley wanted to attend Mass so we dropped her off at the church in Ballyferriter and then took a quick turn around the area before returning to pick her up. We made a brief trip by the Gallarus Oratory on the back side to scout out parking for a return trip. We drove out towards Ballydavid and found a pier with an interesting sign. A little further up the road we came across a Golden Retriever who had to get acquainted. After a bit of petting, we had to tell him goodbye although it appeared he would have been happy to accompany us on our travels. After picking up Shirley we returned to the cottage so she could change into tromping attire. 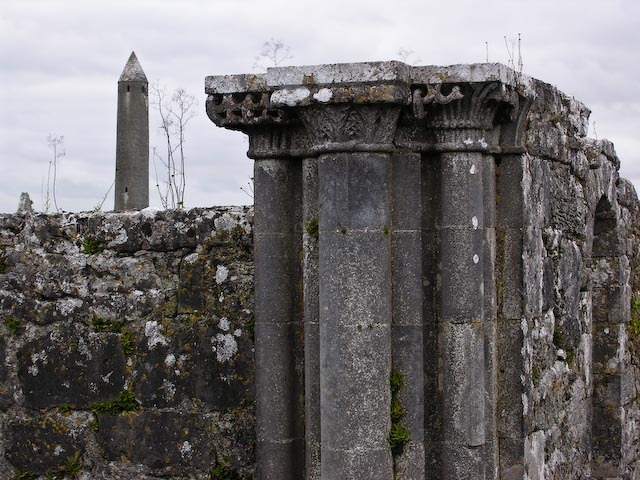 Suitably clothed, we piled into the car and headed out for Kilmalkedar Monastic site. The weather continued to improve with high white clouds and blue sky. Kilmalkedar boasts a nice ruined church with fine carved details. 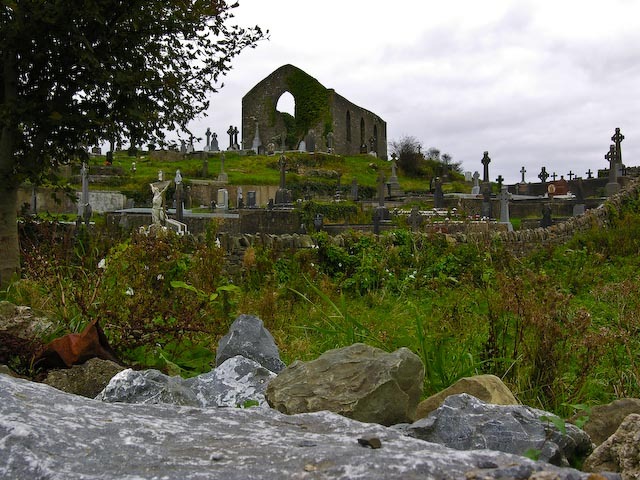 Numerous fine headstones dot the yard and several fine stones including the alphabet stone, an ogham stone and a sundial stone along with an ancient stone cross can be found. 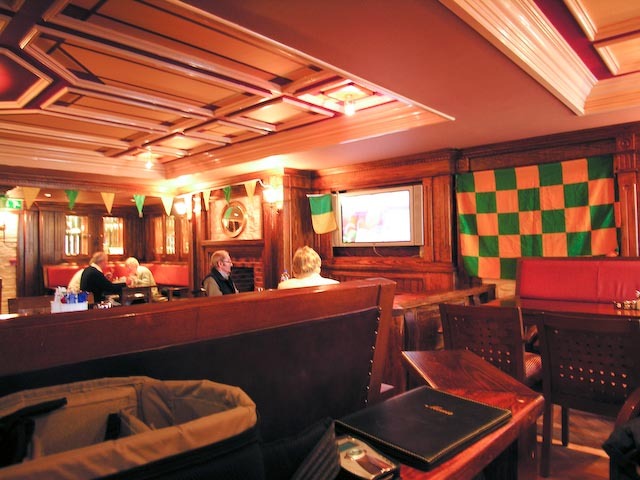 It all started with the All-Ireland Gaelic football match which we watched on a Sunday at the hotel bar in Ballyferriter. We’d stopped in earlier in the day for a quick pint and chatted with the Polish bartender. We thought that experiencing Gaelic football in a Gaelic speaking area would be a fun experience, and it was. We arrived early to secure a good seat and found one just to the right of the large screen television, but back far enough to see well. We ordered pints and throughout the match a few more pints and lunch. I opted for a beef and kidney pie while the ladies settled for more standard fare. The pie was large, tasted delicious and even had a decorative chunk of black pudding on top for decoration. As the match progressed, my insides began to express disquiet. The disquiet was compounded by Kerry losing to Tyrone, but it was a great match and very entertaining to watch the crowd as well as the game. I skipped dinner that evening as the internal distress continued. It reached a climax in the early hours of the morning with a total systems purge in the early hours. In the morning it was obvious that I had food poisoning. It was all I could do to stand up for frequent trips to the bathroom. I can’t say for sure, but I blame it on the black pudding atop the pie. Note for the record, this didn't prevent me from eating black pudding for the duration of the trip. The ladies took off and left me to sleep and visit the bathroom at alternating intervals. By mid afternoon I felt better, and by late afternoon I needed to walk around in the fresh air. The weather had cleared and the sun was shining through the clouds. Perfect for taking pictures! I gathered my camera equipment and put on outdoor clothing and boots. Imagine my distress when I tried the front door and realized I’d been locked in. Not only abandoned by the ladies, but locked in to boot. The door lock was unable to be opened from the inside. Not exactly good in case of fire, but it being a concrete block building and usually raining, that probably wasn’t a concern. The back door was sealed with tape to keep out the wind and appeared to be nailed shut as well. I set about examining the windows and found that the back bedroom window had no screen and was large enough to permit me to escape. I wrote a note explaining my situation. I think it read something like “Gone out for a walk, please don’t lock me in next time”. I had to drop the camera bag out the window first and then squeeze through the narrow opening and fall/hop out onto the grass. I shut the window behind me and ventured out into the wind and sun. I had in mind to visit a spot that we’d gone to last year. Just down the road a few yards from the Suantra Cottages was a dirt road leading North towards the bay. It was a fairly easy walk, and wasn’t overly taxing on my delicate constitution. 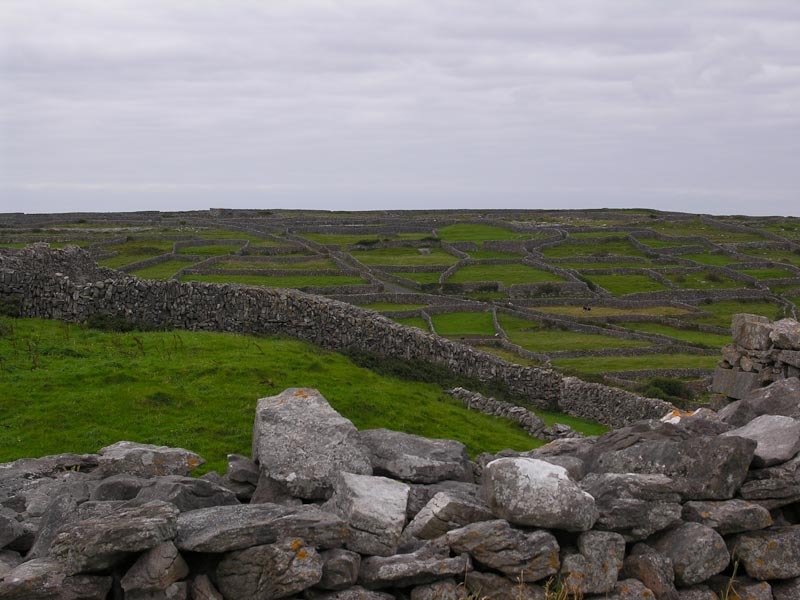 The road passed between fields and jogged to the right sharply and ended in a large stone fenced area. The water was clearly visible and the sound of the waves crashing on the rocks was very loud. Seabirds wheeled overhead adding their voices to the sea and wind. I walked out carefully as I remembered large sink holes from the prior excursion. Abruptly the large hole appeared underfoot about four feet in diameter. It dropped down about 30 feet into water below. Evidently the sea had eroded the rock and penetrated about 50 feet inland. If one had gone down the hole, there would be little chance of surviving the fall let alone the watery end awaiting. I tried not to think about other holes, yet unopened but waiting as I walked out towards the edge. 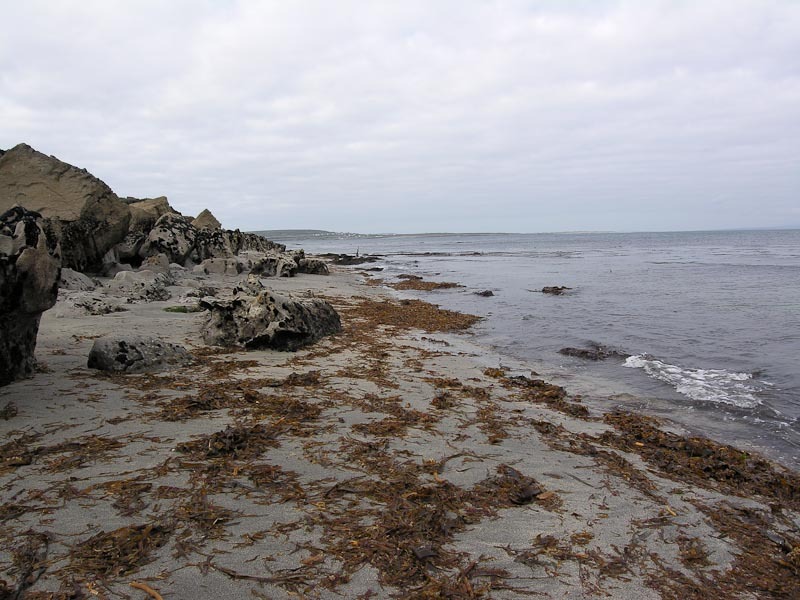 The ground dropped away abruptly below to a rocky beach with larger rocks offshore. 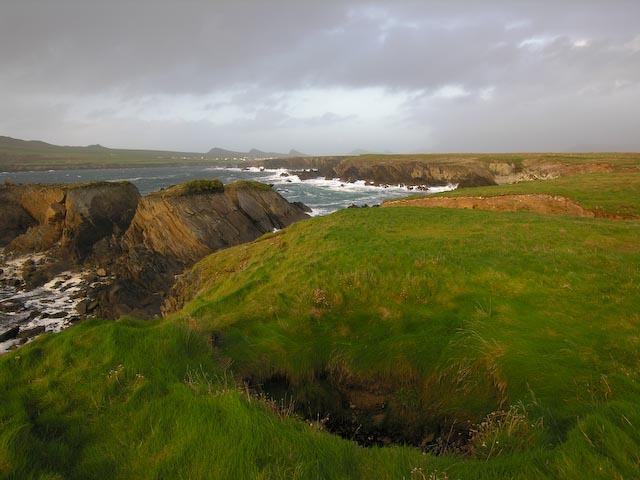 Sybil Head was visible in the distance ahead, and to the right Clougher Head enclosed the bay. The waves crashed in hard on the rocks, shooting high into the air. The sun sank lower and shone between clouds, creating a red and gold light. 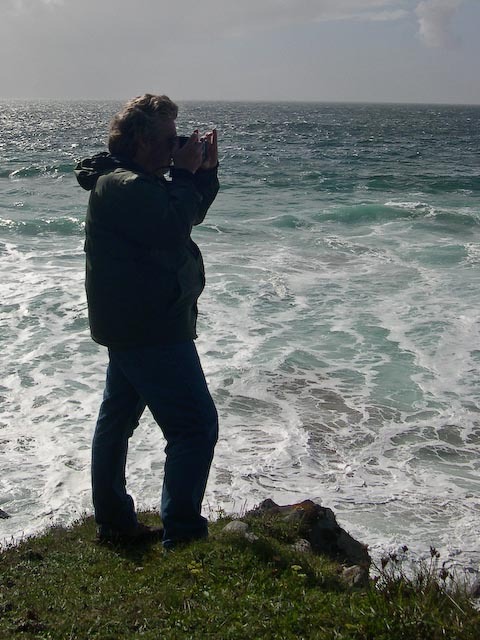 I wandered along the shoreline taking pictures of the waves, rock and cliffs. Eventually my wife wandered down figuring that’s where I had gone. She wandered further West and down onto a rocky beach. She started digging amongst the soft rock and found several fossils of shells and sea plants. Further excavations revealed more and she began filling her pockets with interesting bits of rock, shells and wood. 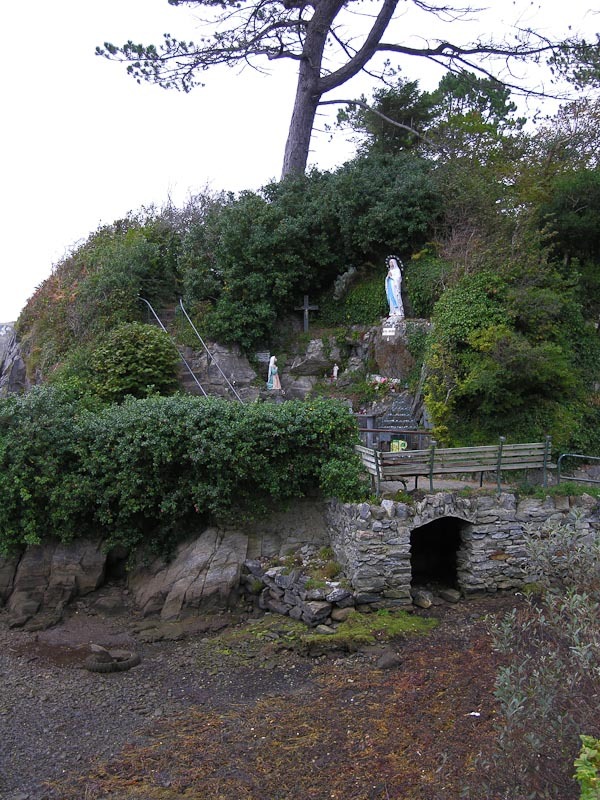 In an earlier excursion on the Beara Peninsula she had found several geodes along the rocky shoreline. I tried to find something interesting, but she seemed to have the knack, so I returned to the camera. We continued our excavations and picture taking until the sun sank to low to see well. We trekked back to the road and walked back to the cottages. Examination of the bits collected by my wife and the photos proved it a successful venture and one to be repeated next time we return to the Suantra Cottages. 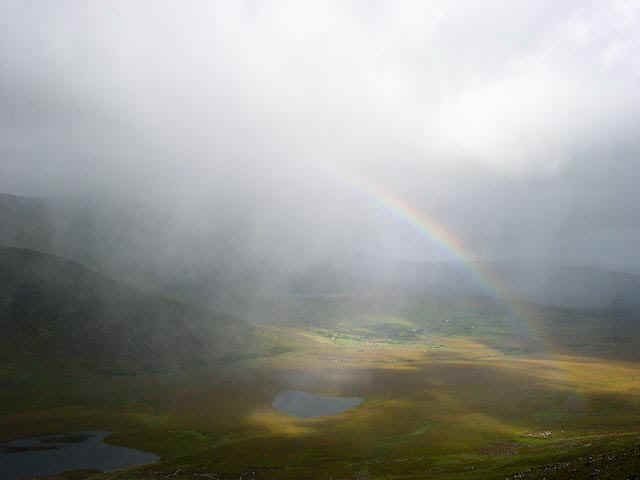 We awoke to rainbows and sunshine, but the promise of more rain not far off. 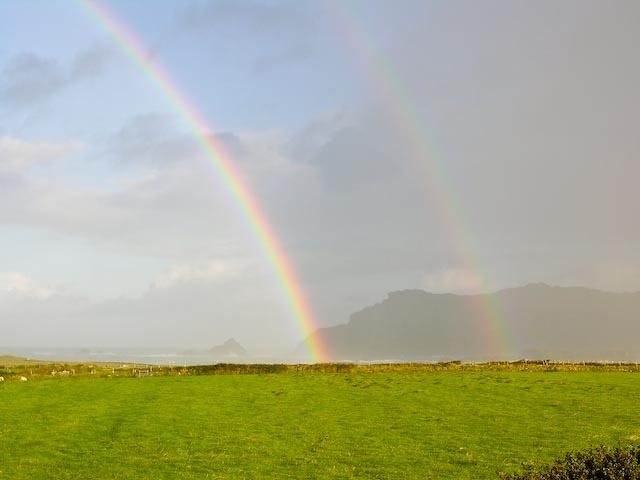 The double rainbow directly in front of the cottage remained for over a half an hour. 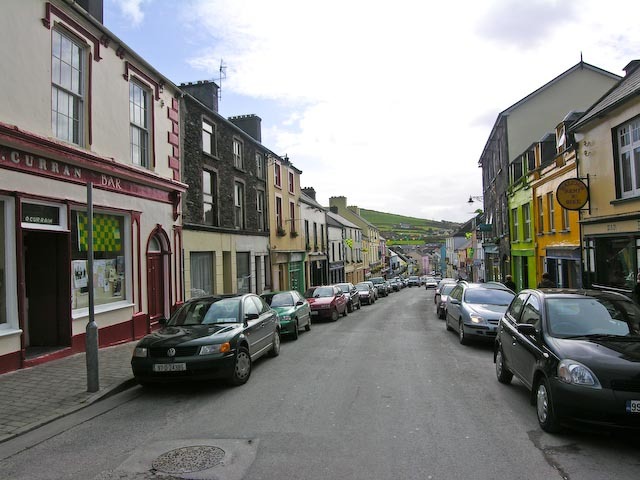 We decided to go into Dingle for some shopping and groceries and then just hang out in the area and be flexible with the weather conditions. A leisurely breakfast with muesli and yogurt for Karen and Shirley with eggs and puddings for me. Sausages for all of course. 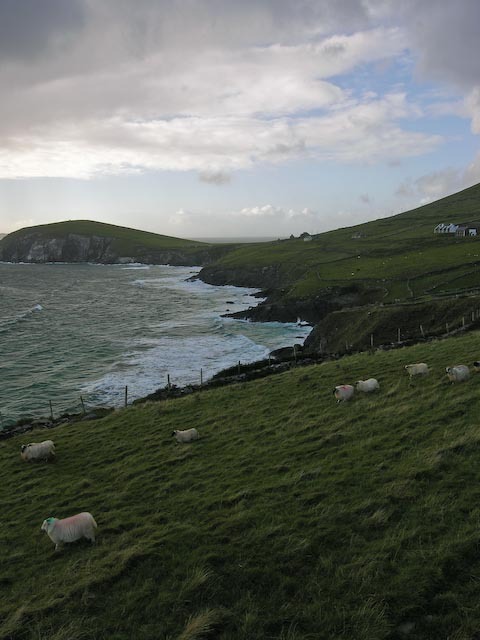 We took the back route into Dingle instead of the longer route around Slea Head and through Dunquin. This took us by Rahinnane Castle sitting in the middle of a field. 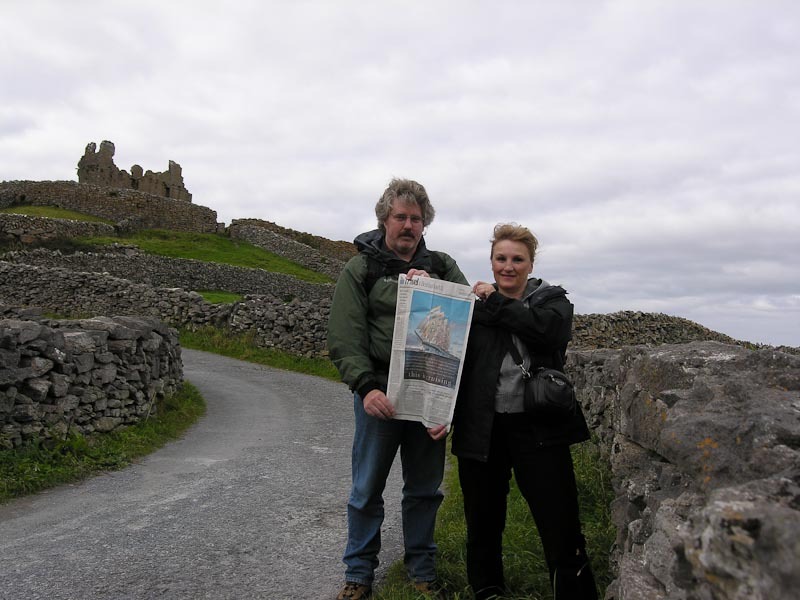 We'd visited the castle in 2004 and it was a long tromp across a wet field, a a few Euro as well. It wasn't on the agenda for the day, but it gave me a good opportunity to try out the 10x telephoto on the Nikon 8800. One of the few times I used it on the trip. I made far more use of its counterpart the Nikon 8400 for wide angle and landscape photos. About 95% by my calculations. I've since upgraded to the Nikon D80, but kept the Nikon 8400 as a pocket camera and sold the 8800. I've purchased a Nikkor 18-200 VR lens that give a good range of telephoto to wide angle and am looking forward to getting a Sigma 10-20mm f/4.0-5.6 wide angle as well. I find that most of the Irish scenery I like to photograph is best served by wide angle views. Enough about that until 2007. 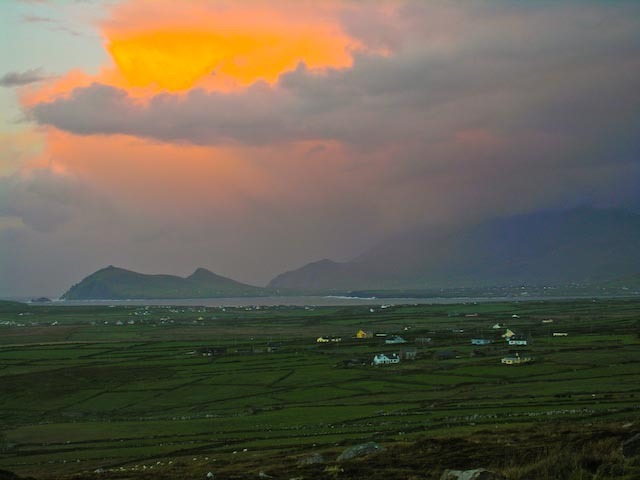 The sky was a bit washed out for good photographs so I packed it in and we headed for Dingle. In Dingle we did a quick bit of shopping and enjoyed wandering through the market looking at unfamiliar and familiar labels and products. Sometimes the characters in the store are equally interesting. Leaving Dingle we again took the fast route as Shirley was tired. We dropped her off at the cottage for a rest and grabbed some extra layers of clothing and took off for Dunquin. Karen had a favorite picture we'd seen in magazines and on the wall in the cottage that we wanted to duplicate. The weather was good and the sun shining. We knew precisely where to go, but not the exact angle for the best shot. We had to park above the spot in Dunquin and then walk back down the narrow road and stand on the edge of the road to position ourselves. Of course this involved dodging the occasional tour bus, but they and we took it as a challenge and managed to coexist. Below is the picture we we took and next to it a photo of the picture on the wall of the cottage. Exact duplication wasn't possible with time and environmental changes, but we did well we thought. We'll keep trying next time too. Since we were there, we decided to walk down the hill towards the water and explore the surrounding walls and structures. Some of the stone pilings look suspiciously like tombs or graves, but it is hard to tell amongst the tall grass and wind. 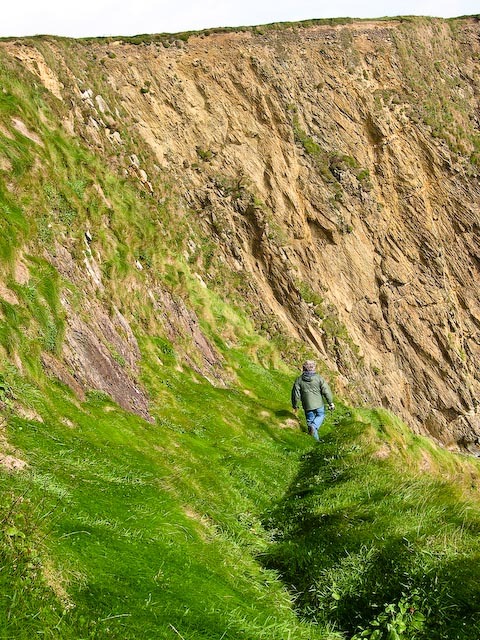 After more wandering and climbing we returned to the car and drove further up the road to the old path down to the Dunquin Pier. 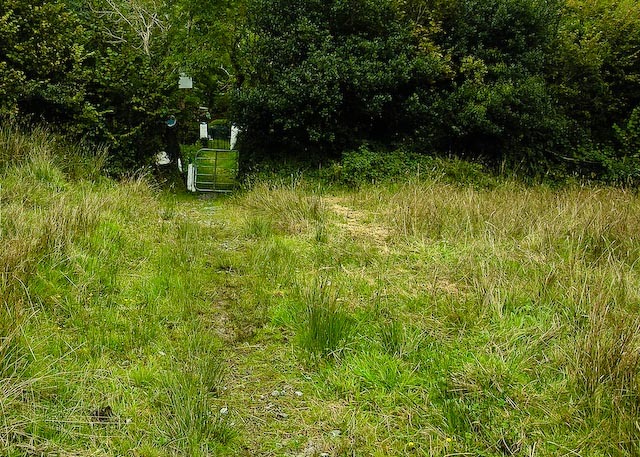 Only part of the route remained and was so overgrown with grass, walking was difficult. 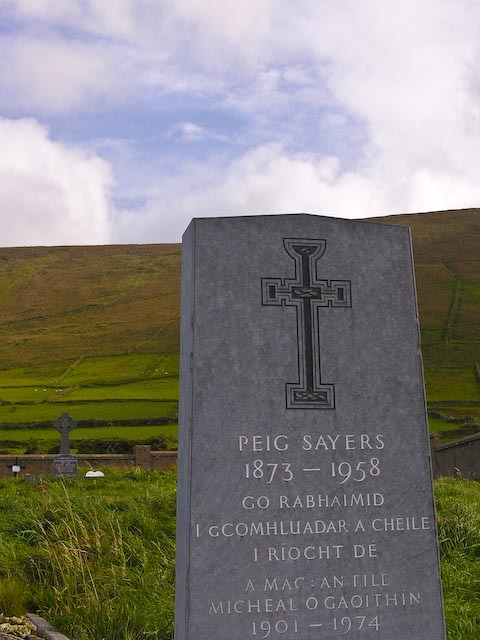 We also visited the graveyard above and saw Peig Sayers grave as well as her son and other people from the Blaskets. There is a small book area with all the books written by the Blasket Island writers . Make sure you pick up at least one to read while you are in the area, or get one here. We recommend Islandman , Peig and Twenty Years A-Growing as a good start. It was a bit past lunchtime and a bit of food was in order. We visited the nearby cafe for a bit of seafood soup and to view a lobster plate that Karen had seen on the wall in a prior visit. The seafood soup was good and probably tasted better because of the salt air and view. We polished it off quickly along with the muffins served alongside. 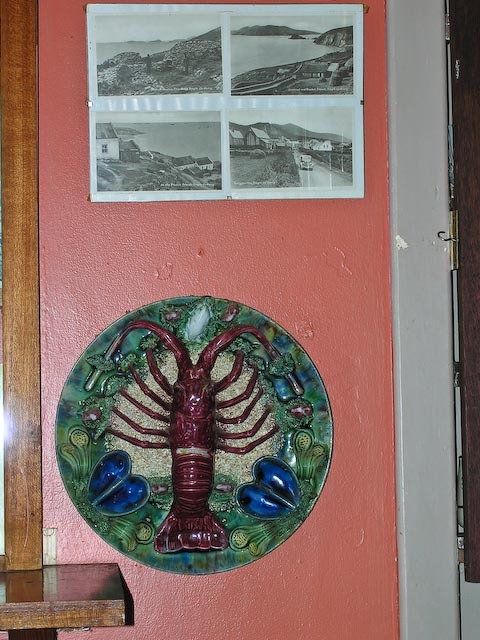 While Karen chatted with the proprietor, I took a few photos of the lobster plate and looked at the Blasket books and memorabilia on the walls. The place is worth a visit for the decor alone. We drove around the long way back to the cottages which involved some narrow roads that were more cowpath than road. The car survived the ruts and bumps, and we didn't scare any cows to death. 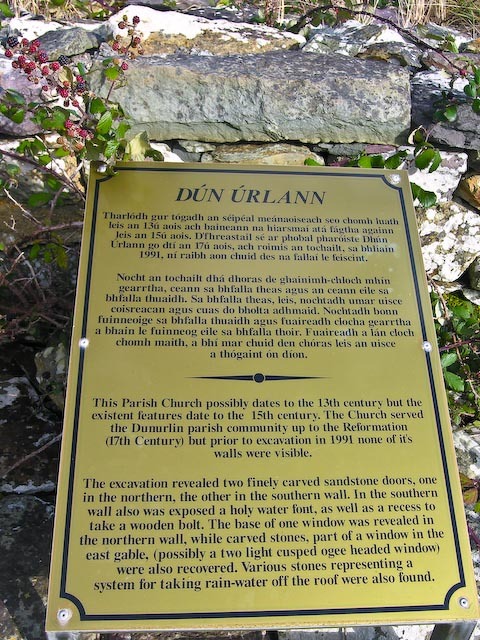 Along the way we found Dún Urlann, a parish church from somewhere in the 13th to 15th century. 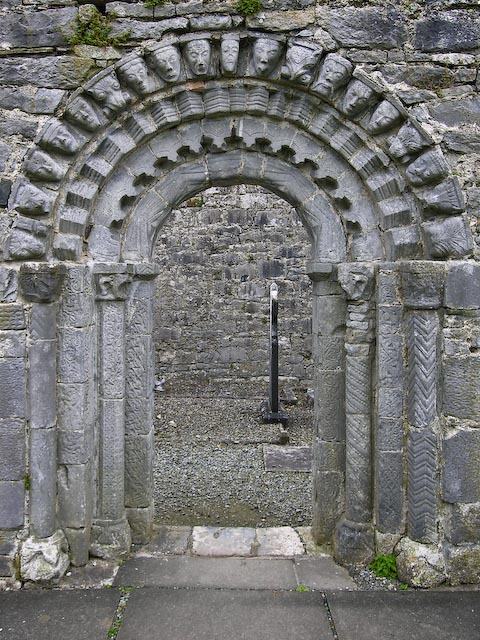 It had been excavated and many of the roofing stones and partial walls remained as well as two nicely carved doorways. There were also early versions of rain gutters, something I would imagine to be very helpful in this area. The sun was sinking lower in the sky and the light was perfect for photographing the ruins. I dropped Karen back at the cottage to check on Shirley and begin dinner while I took a quick run back to Clougher Head in case the sunset materialized into something special. It never really did, but I took a picture of a crow supervising my efforts and a nice picture of Ballyferriter with lights coming on in the houses as the sun set. A fine dinner of pork chops and potatoes was waiting and an evening of cribbage, a turf fire and reading wrapped up the day. 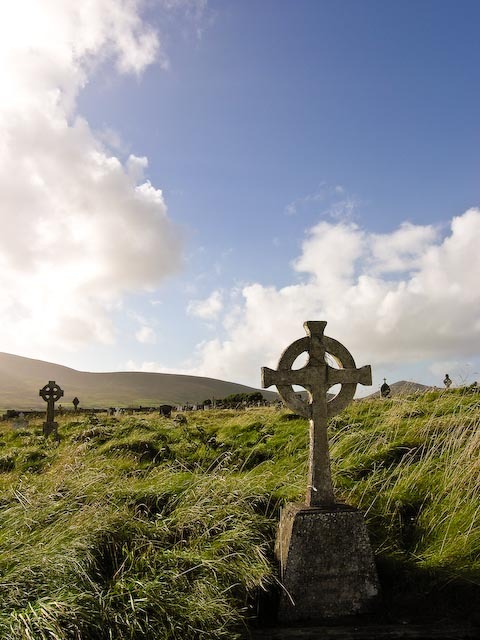 Raheenyhooig Burial Ground lies on the other side of Dingle bay from Dingle town. 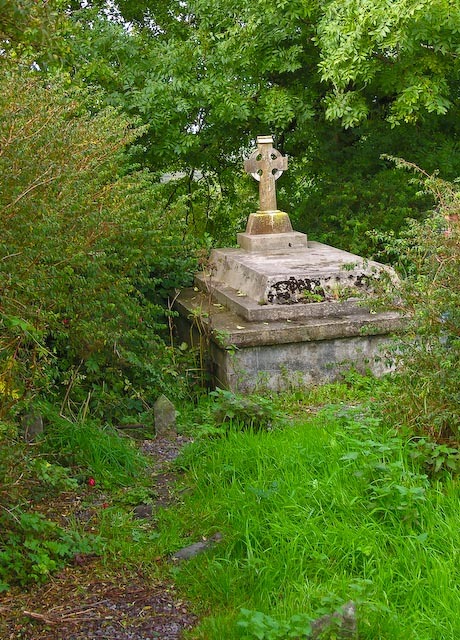 The old graveyard at Raheenyhooig serves the detached portion of the parish on the Burnham Peninsula . 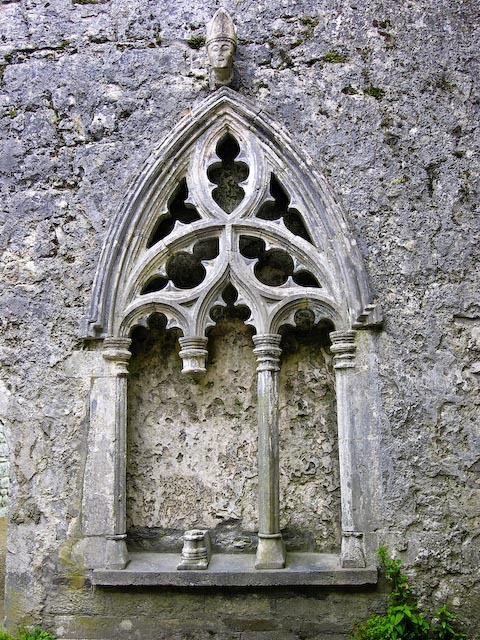 This is most notable for containing the family vault of the Mullins family, Barons Ventry. It is on the same road as Holden Leathergoods and the Eask tower. 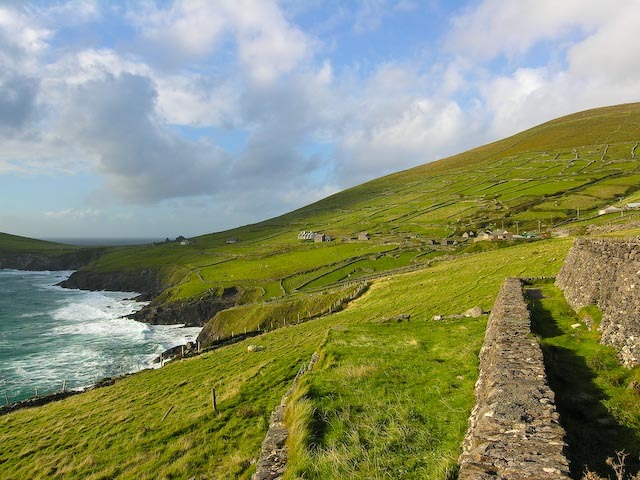 The best way to get there (probably the only way) is to leave Dingle traveling North to Ventry/Slea Head. Coming out of town there is a roundabout, take the first left going across the bridge. 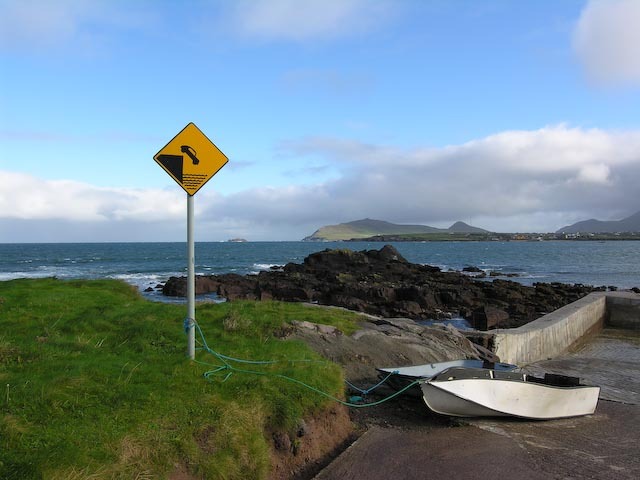 Immediately after the bridge go straight and follow the signs towards Ventry along the Slea Head road. Keep an eye out for signs on the left for the leather shop and Colaiste Ide (an all girls Irish school). Turn left on the road and travel along about a mile watching for the entrance (shown in images) on the right/West side of the road. The other side of the road is a home and driveway as I recall, try not to block road traffic or the driveway when you park. The entrance to the grounds is over the steps to the right of the gate. The gate was locked when we were there, so the less spry might have a difficult time with the stairs up and over the wall. Once inside the grounds are fairly accessible. 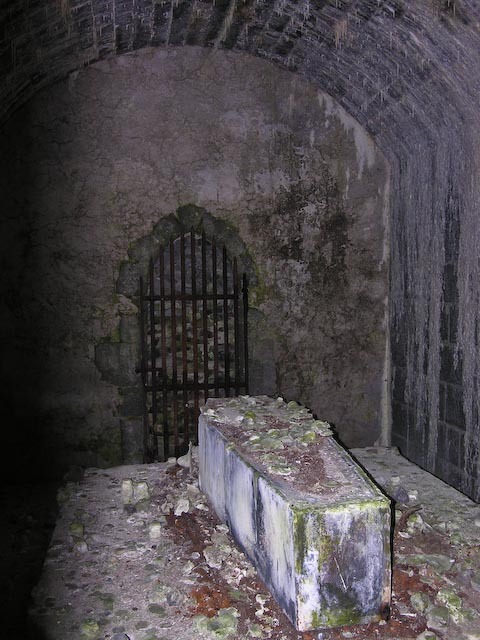 The large crypts or vaults are to the left of the gate and a roadway takes you around and up to that area. The view from just below is nice as shown in one of the images. The rest of the burial ground is fairly standard with a few interesting graves in amongst the trees in the central area. The grounds are fairly well kept, but the grass is long in some areas and can make walking difficult. 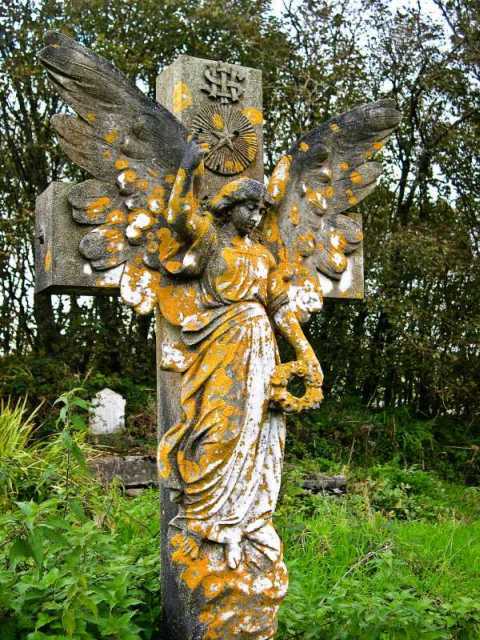 There are some nice crosses and sculptured headstones, especially the angel with the orange lichen on it. Watch where you are walking as many of the graves are placed closely together. Try to avoid walking over the graves if at all possible. 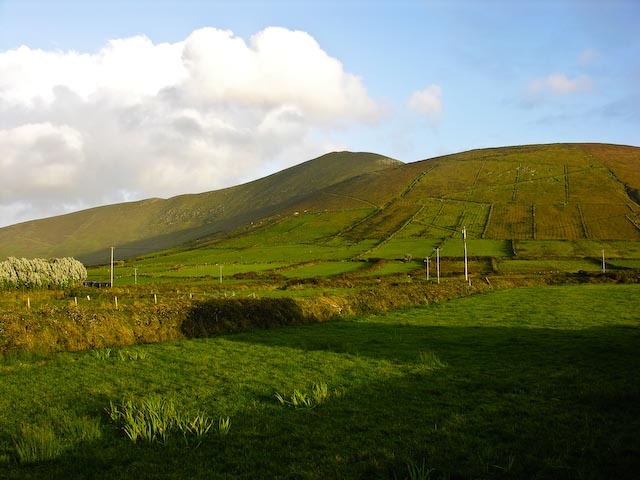 The view from the more central southern portion affords a good view of Dingle bay and the hills and town on the other side. We found late afternoon an hour or so before sunset an ideal time to visit as the light was very dramatic. Eask Tower is visible to the South through the trees. By standing along the West side of the burial ground, you can see the tower quite well. 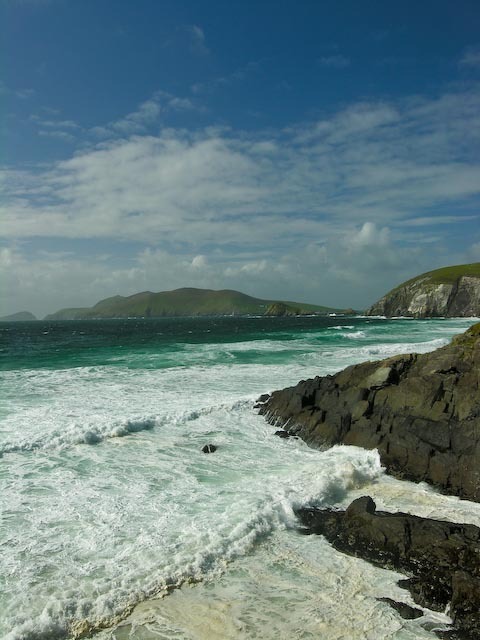 We woke up and said, hey, let's go around the Ring of Kerry. OK we discussed it the evening before. The morning looked good so we thought we'd risk it. The weather held for a good portion of the morning and then deteriorated into a downpour by afternoon. Doggedly we persevered. Not that there was much other option when you're half way around the Ring except to keep going. The drive from the cottage in Ballyferriter was uneventful. Inch Strand was windy and cloudy, but a nice view down the beach none the less. We knew we were getting somewhere when we hit Killorglin. We didn't stop, but did wave at the Puck Statue as we passed. 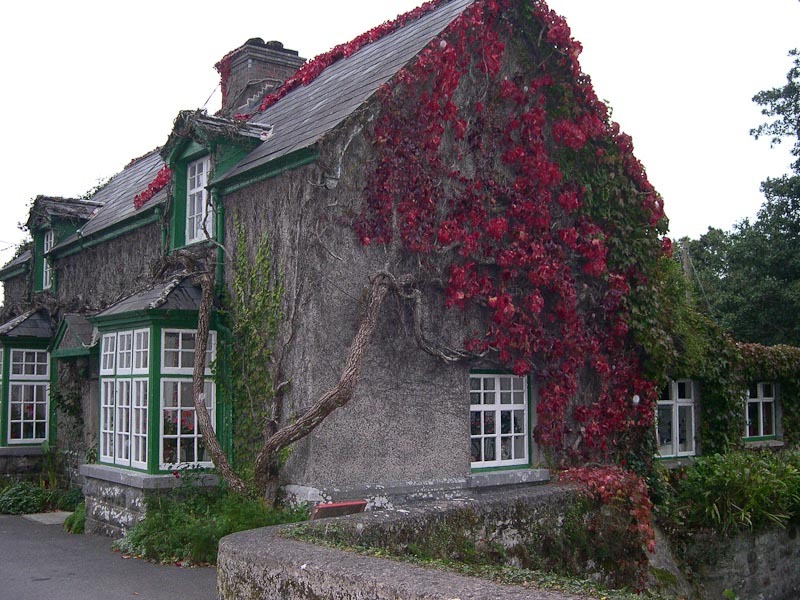 Our first stop, mostly for bio purposes was the Red Fox Inn and the Kerry Bog Village. The best Irish coffee in Ireland is a big boast, and one that is tempting to take up. Just not a 9 AM. 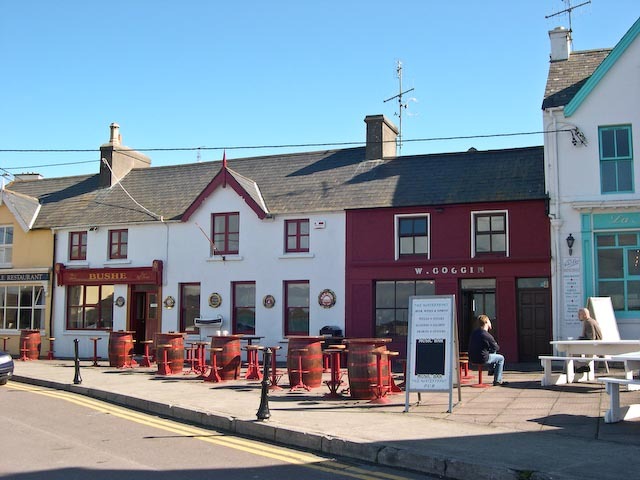 The Red Fox Inn lies alongside the doubtfully authentic Kerry Bog Village and has ample parking in front for several tour buses. We stopped both for the sign, and because we needed to use some more personal facilities. Where there is alcohol, there is sure to be a restroom, I always say. We parked in front, took a quick look at the Bog Village and made for the restrooms. We passed a couple of large tables setup with glasses and pitchers of something or other. After a short but relieving break, we returned to the main area. The wife and mother-in-law went in search of a cuppa tay while I examined the aforementioned tables. It appeared to be all the makings of Irish coffee. There were pitchers of steaming coffee, bottles of Ireland’s finest and pitchers of cream. What I did fail to notice was any method of preservation for the dairy product. It sat, white, frothy, and happy, in clear plastic pitchers. Now, I don’t know about you, but I prefer my dairy product cold and untainted by bacteria. It would seem that storing it next to hot coffee could have bad consequences, especially later in the day. All this being what it was, I took a pass on the best Irish coffee in Ireland and headed for the gift shop. The gift shop was a step above the usual Irish gewgaws. There were the usual tin whistles, shamrocks, stuffed sheep, and other nonsense. They did have a good book section with both cookbooks and books unique to the area. Nothing I couldn’t live without, though, so I went in search of the ladies, and after the tea was finished and another trip to the restrooms, we left without sampling the best Irish coffee in Ireland.Two things about the Kerry Bog Village: it seems to be under-populated with tourists and overpopulated with turf and bog ponies. Mind you, there is nothing wrong with either turf or bog ponies. One smells great and keeps you warm, and the other doesn't smell great. Bog ponies used to be common, but are now are rarity in Ireland. They are small, about the size of a Shetland pony, but a unique breed. These folks are doing a good thing by bringing them back. Now, back to the Bog Village. We didn’t actually go in, as it didn’t appear to be open for business. There was no one at the ticket booth, and most of the entrance seemed to be blocked by a largish pile of turf. Not that turf is an effective barrier. If it had, Ireland would be a much different place these days. 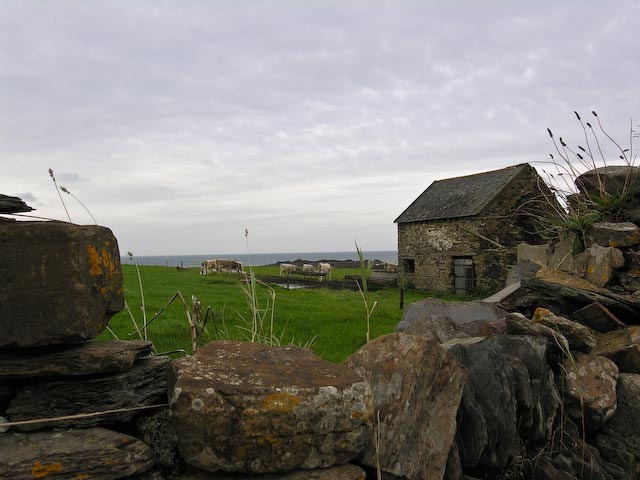 The village appears to consist of several cottages, a blacksmith forge, and some other outbuildings. There appeared to be some painting going on as well, something that is doubtful more bog villagers could afford. We all piled back in the car after stashing items from the gift shop in the back and off we went to Cahersiveen. 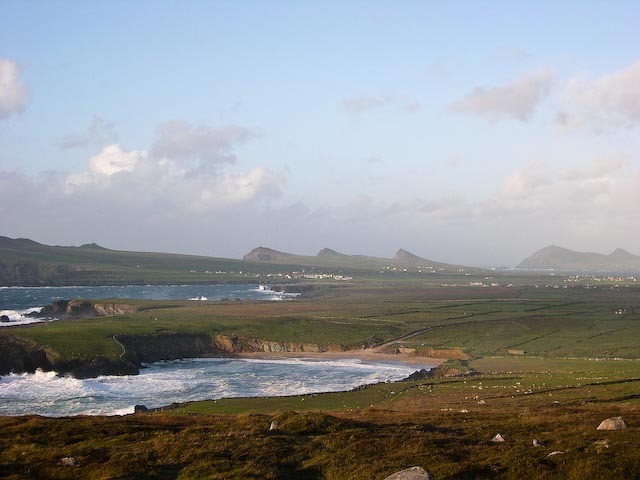 Cahersiveen lies at the foot of Beentee mountain, on the river Fertha overlooking Valentia Harbor. 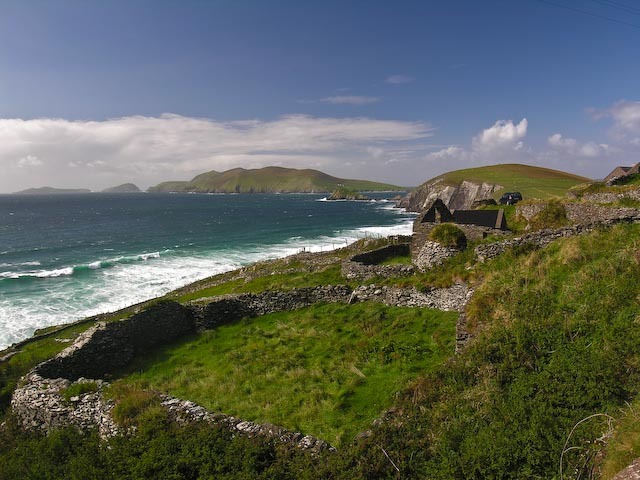 It would form a good base for an extended stay on the Ring of Kerry. 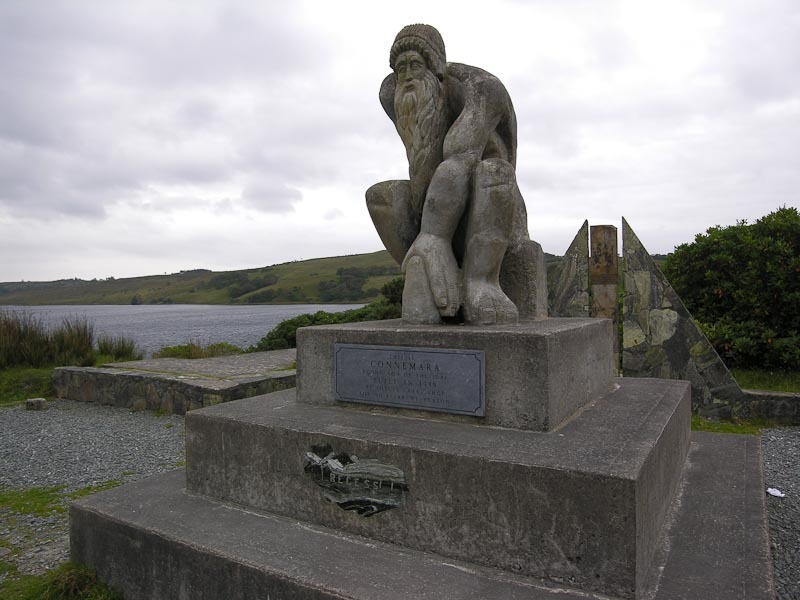 Irish patriot Daniel O' Connnell was born in Cahersiveen. 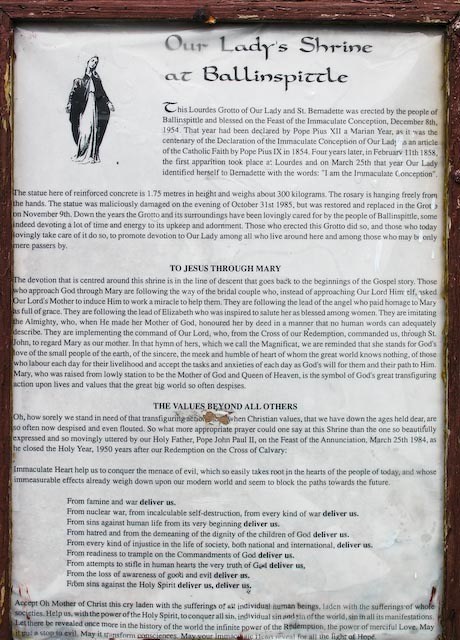 The only church in town is named after him, the only Irish church dedicated to a layperson. The heritage center is an out of commission Royal Irish Constabulary barracks and wasn’t open when we visited. Traditional fair days or market days are still held on the town square and streets. As you come into town, there is a small area that has a number of booths, and depending on what time of the year and day it is will depend on how well populated it might be. We found some interesting crafts, including handmade paper and candles. We made several purchases from the homemade jam and marmalade booth after sampling several types. We also purchased some excellent cheese made on the ring from one of the vendors. There were clothing vendors with wool clothing and sweaters that looked homemade versus the usual tourist stuff. The town is small and parking is dear; watch where you park and be sure to purchase a parking disc from nearby shops. 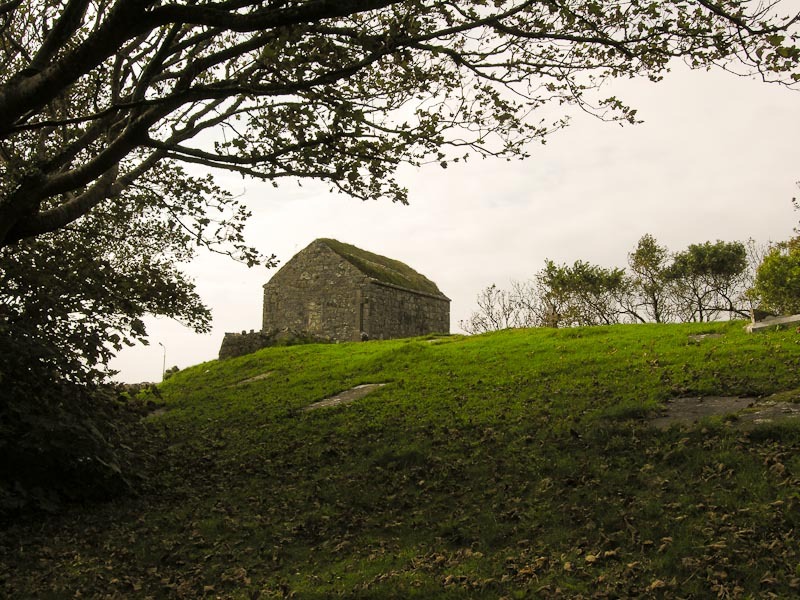 Outside Cahersiveen, down by the church and across a stone bride, lies Ballycarbery Castle and two large dry Stone forts Leacanabuaile and Cahergal which date to 800 AD. Ballycarbery Castle is easy to see just to the NW of the bridge. 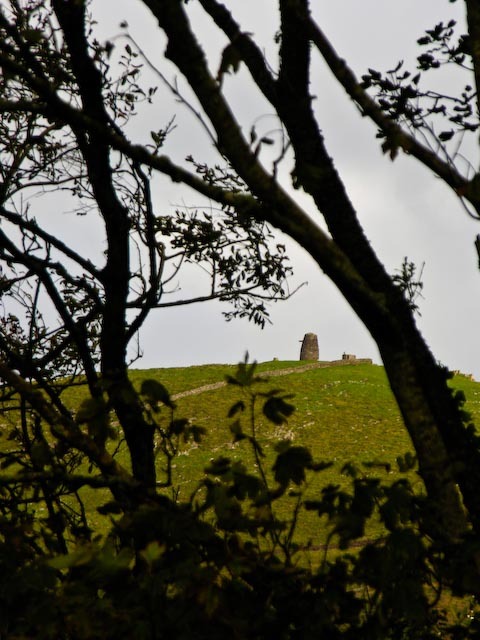 The stone forts lie to the NE, one being easy to find and the other lie just a short distance beyond. 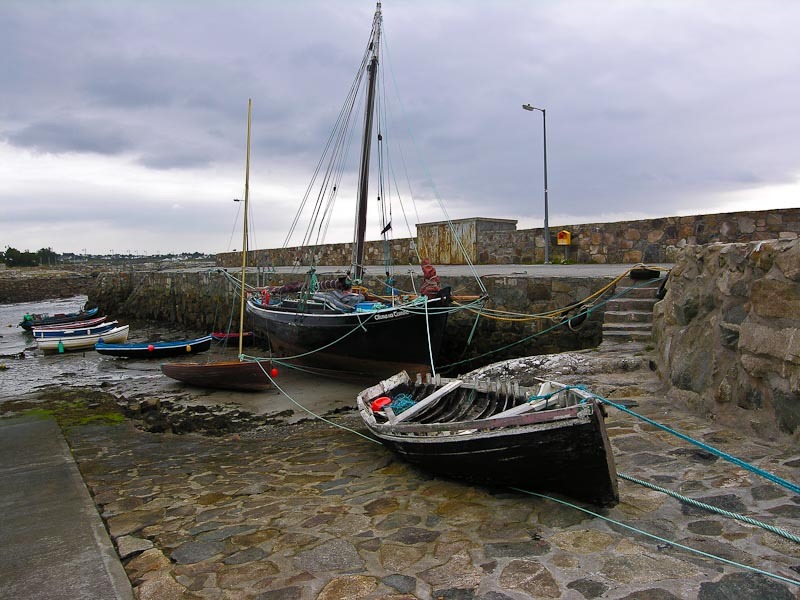 Cahersiveen also has a large yachting marina and harbor. The marina has 93 berths. 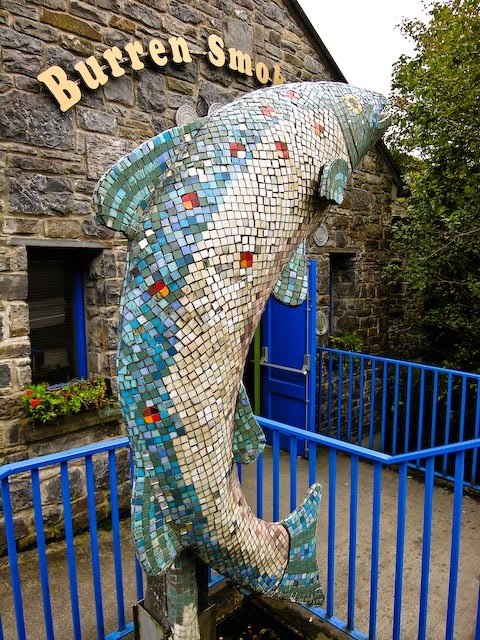 Cahersiveen has a reputation for some of the best deep-sea fishing in Europe. 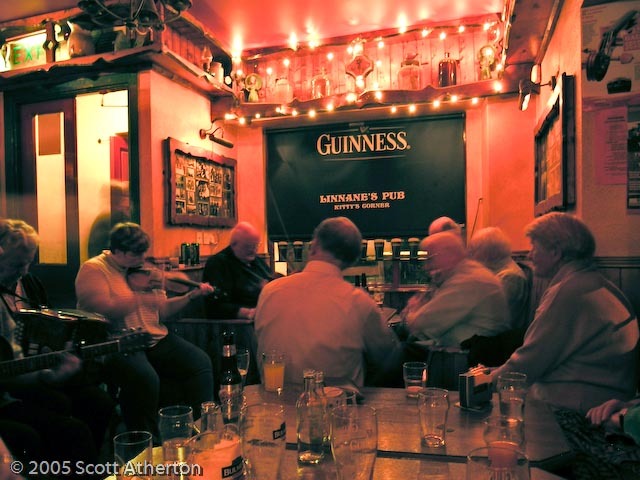 The town is a popular spot for traditional music sessions in any one of the local pubs. Traditional set dancing is also popular. 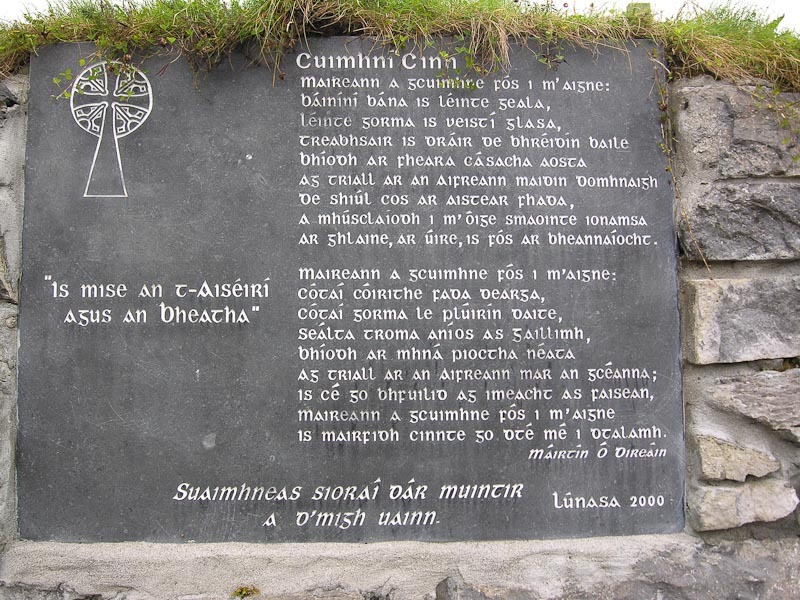 The Cahersiveen Celtic Music Festival is held on the August Bank Holiday weekend each year. You can see Cahergal or Cathair Geal (white or bright fort) from just about anywhere in the area. It's high—10-foot thick walls are hard to miss. 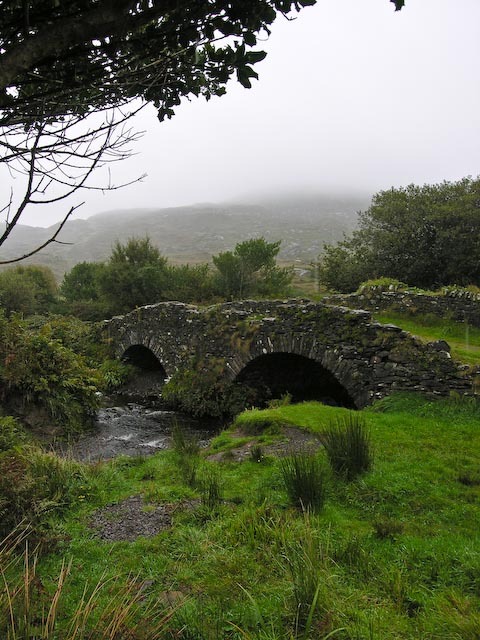 You can reach it by leaving Cahersiveen across the stone bridge by the church and heading NE along the road. You should see it easily ahead of you. There is a small car park and a poorly signed lane leading up to the fort. The first part of the walk is fairly easy, although rocky. Later it begins to climb sharply up to the top of the hill the fort sits on. The fort is surrounded by pastureland, and you have to pass through a gate to enter the lane to the fort. The fort itself is impressive. 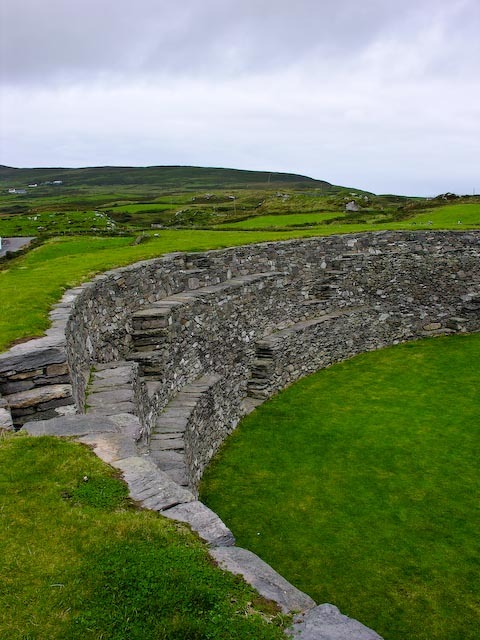 The curved wall is all of dry stone construction and is very rounded and smooth. A small entrance on the west side provides entrance. Try not to think about all those tons of stone above you as you stoop and walk through the wall to the interior. 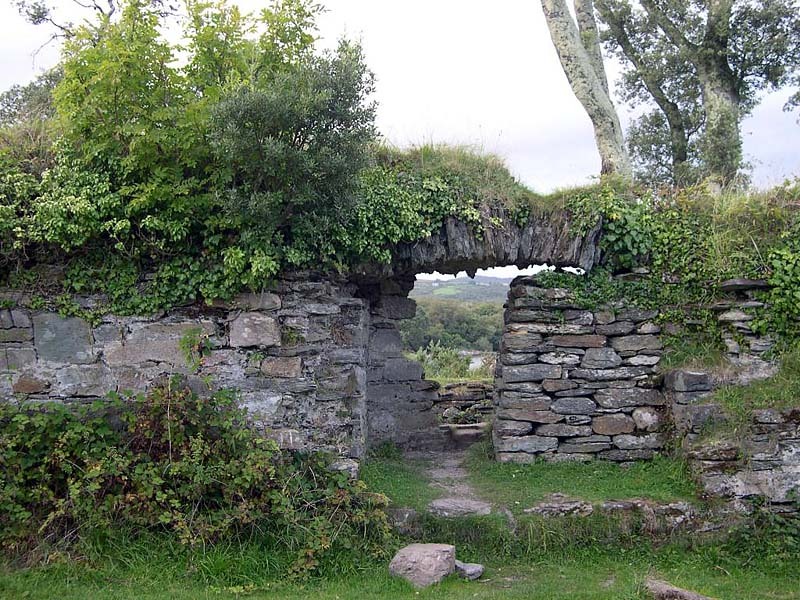 Inside there are terraced walkways up the walls to the top. There are the remains of single stone structure with rock steps jutting from the sides. The fort dates to between the 9th and 11th centuries. There are incredible view of the countryside around from the top of the wall. 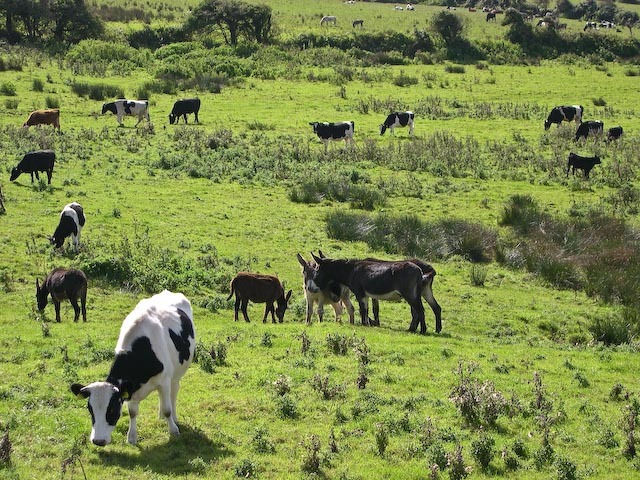 You can see all sorts of things from Ballycarberry Castle to cows at play (see middle photo). You can see Cahersiveen and Velentia harbor clearly as well. 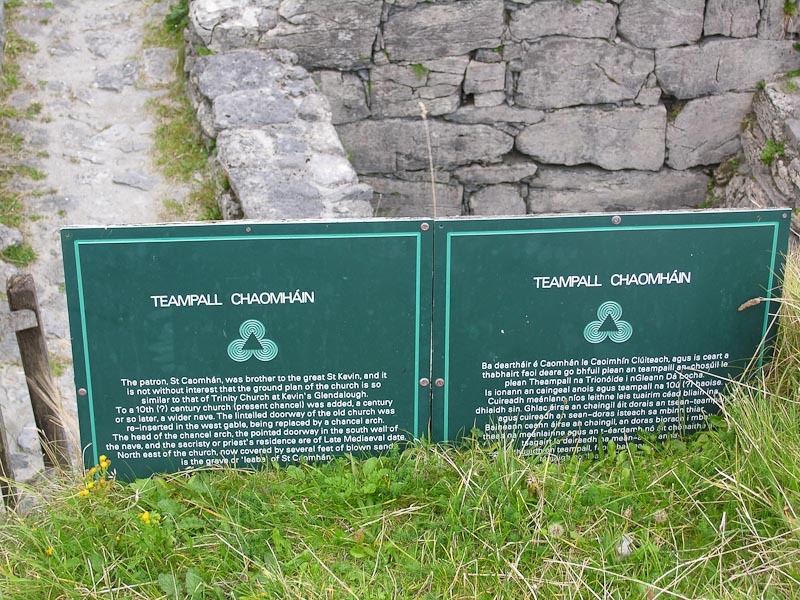 Prominently sited on top of a massive rock, 1,200 feet from Cahergal, Leacanabuaile Stone fort has a reconstructed dry-stone wall 10 feet thick but only 5 feet high. There were three beehive huts inside, but only one survives, with a square house built against it and on top of the ruins to two other houses. 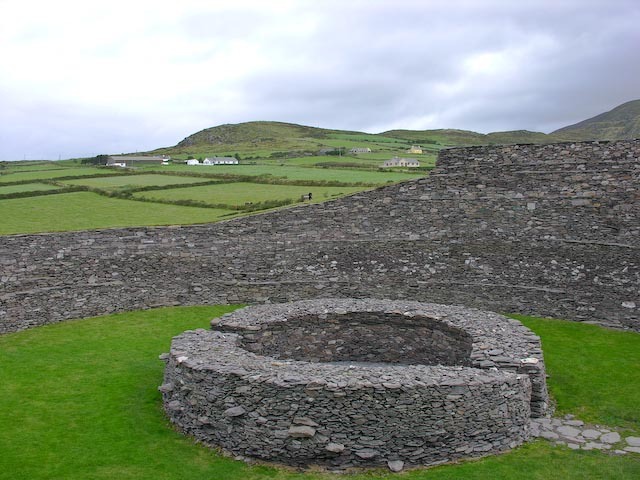 The round house abuts the wall of the fort, and from its doorway a hole in the floor leads into a souterrain. We were not able to visit this fort, but I understand it is well worth the trip. 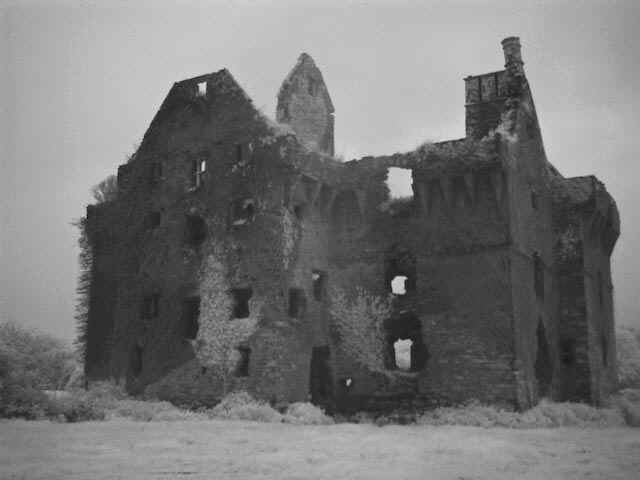 Ballycarberry Castle was the next stop. If you find the fort, you can see the castle and just head in that direction. It is fenced off, but we didn't let that stop us. 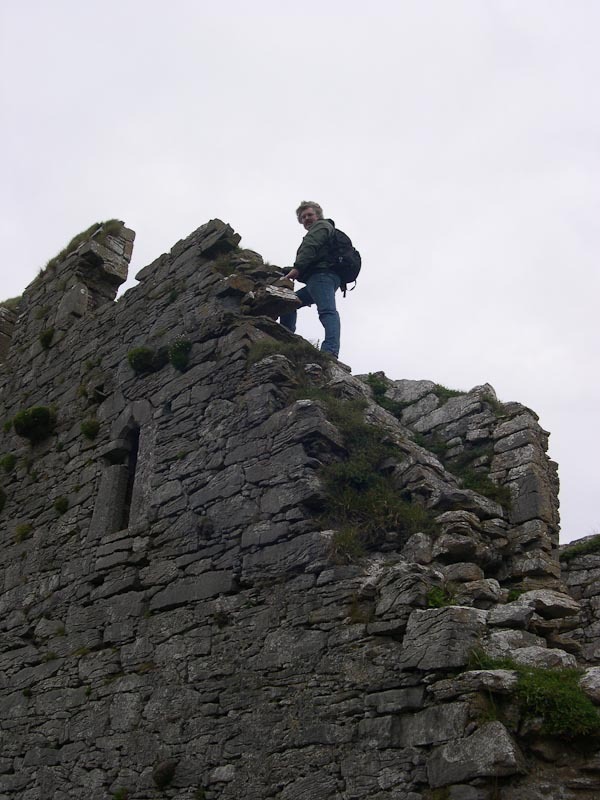 The castle is in pretty poor shape, so be careful when walking around or climbing as rocks could give way. Fortunately it held together for us and we spent a pleasant hour getting reacquainted. The ivy was growing as thickly on the walls and no major parts seemed to be missing. There isn’t much left of this 15th rectangular tower house castle but the walls, but you can climb around on and in it if you’re brave. Once you’ve hopped the barbed wire fence, ignore the warning signs and walked through the cow and sheep poo! It is well worth at least viewing from the car park area. Once you’re there, you probably won’t be able to resist a closer look. We couldn’t the two times we visited, even in the rain. 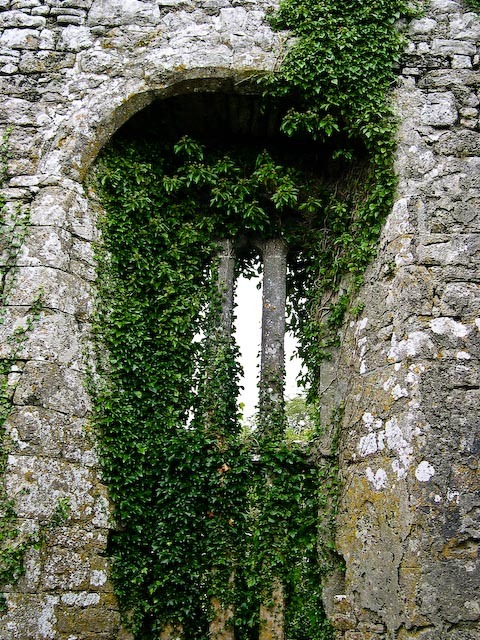 Much of the castle is covered in ivy, and there is a wonderful ivy covered wall on the north side. 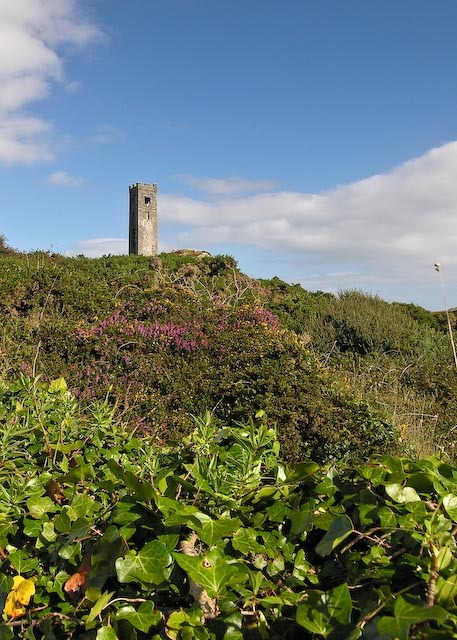 The castle overlooks Valentia Harbor and sits on top of a small hill, with a wonderful view of the surrounding countryside and Cahergal stone fort. A small river flows alongside the castle down to the harbor. 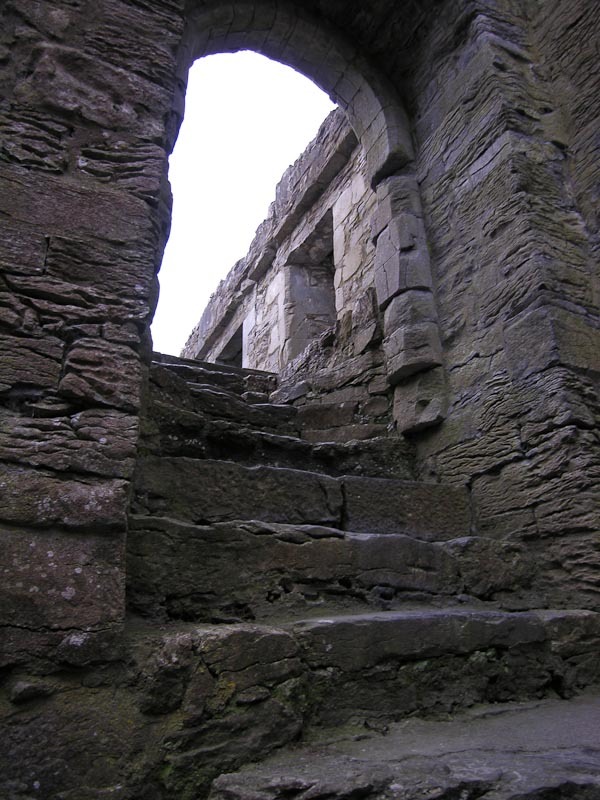 There are several stairways inside that lead up to small rooms and passageways. We didn’t feel that the ruins were unstable or particularly dangerous, but we may just be naive, your mileage may vary. Personally, I think the whole thing is held together by the ivy. 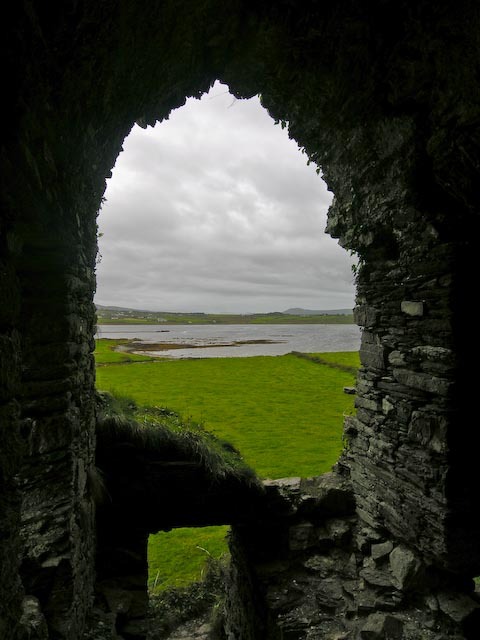 That being said, there are some great views for the brave from the upper areas of the castle, in particular, from the SW part overlooking Cahersiveen and Velentia harbor. 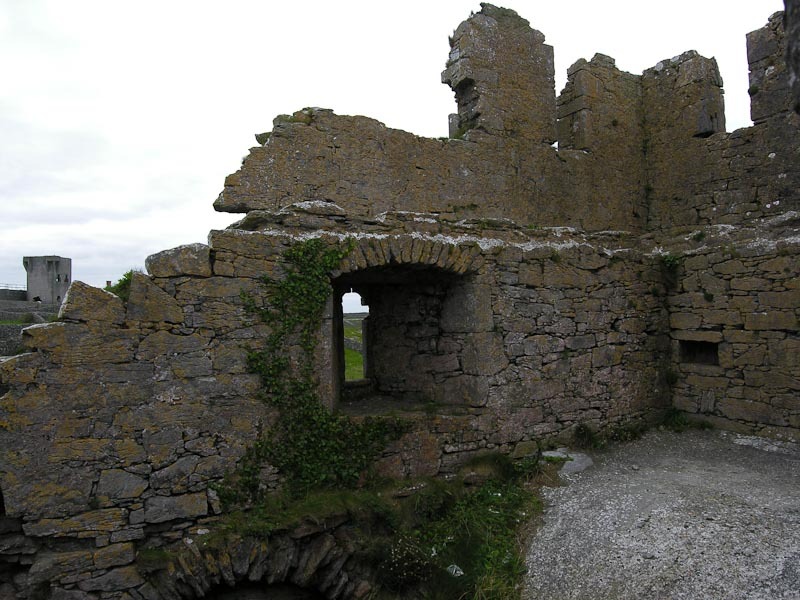 The property was originally the seat of the MacCarthy Mor family, but passed to the O'Connells in 1350, who were wardens for the MacCarthy Mors. 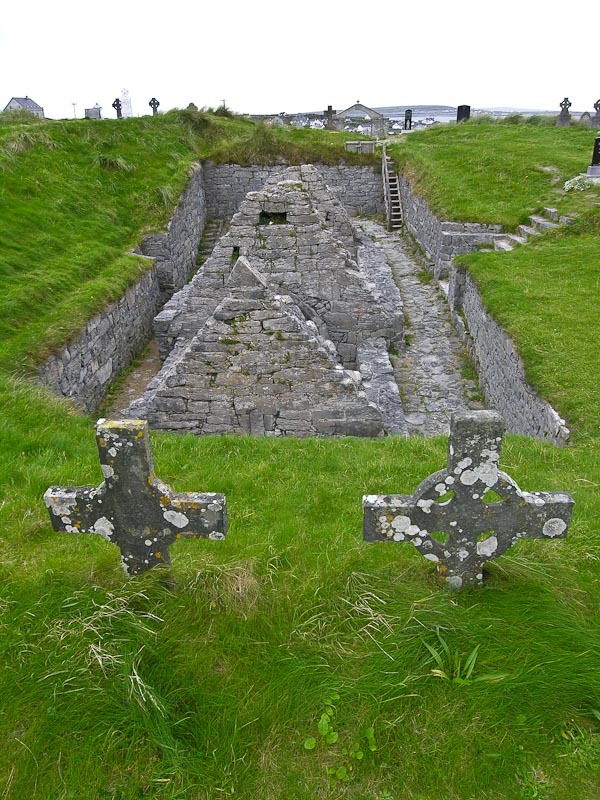 The story goes that the MacCarthys sent a messenger with a cradle to the O'Connells, as indicating that they should offer to foster a MacCarthy Mor child. The O'Connells responded by sending the cradle back with the head of the messenger inside. Evidently, the MacCarthy children had a reputation as little hellions?! Cromwell’s General Ludlow destroyed the castle in 1652 with cannons, as is true of most things in Ireland. Cromwell must have been a really unhappy character...perhaps he wore wool knickers? We couldn’t find any cannonballs lying about. Lohar stone fort takes some real dedication to find. We saw a small sign leading down off the main road. A narrow 1.5-lane road headed off into the misty rain. We didn’t have much else to do, and as I was driving, I took the road less traveled. As we traveled, it became clear why. 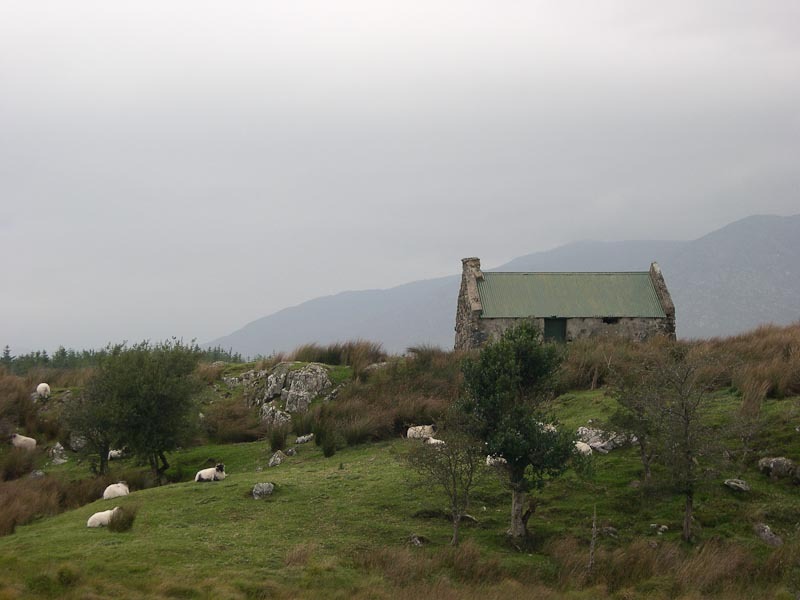 Small farmhouses both populated and abandoned appeared at irregular intervals. Most were abandoned and some just stonewalls. The road was rutted and full of potholes, but not impassible. We went for several miles with no further sign of any antiquity. 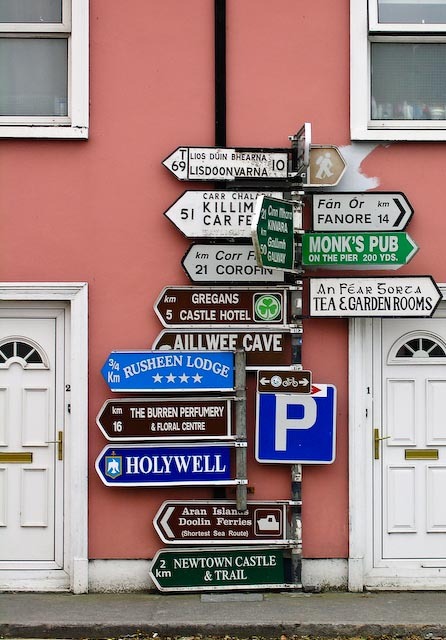 I figured that in typical Irish fashion, there would be a sign at the next turnoff or the fort would be visible from the road. The latter turned out to be the case. A small turnout in the road substituted as a car park. While the ladies whipped up a spot of lunch, declining to take the short walk to the fort, I loaded up and ventured forth. The wind whistled merrily around my waterproof jacket and hood looking for a way to drive the misty rain past the barrier. The stone fort is halfway down the hillside and lined with a cyclone fence all around. The entry is on the more SW side as I recall. 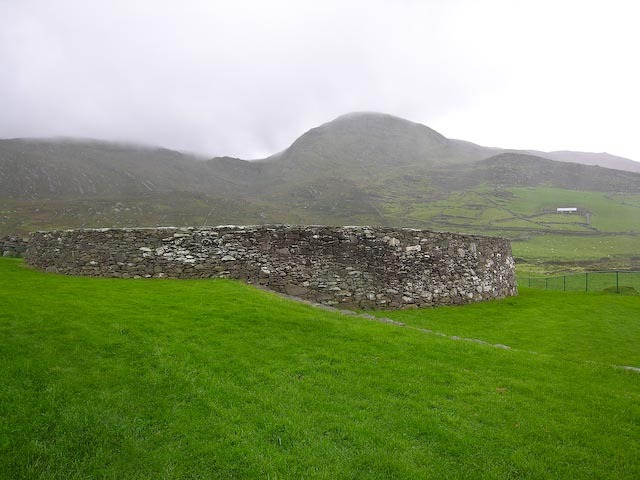 The walls are in fair condition, and it is somewhat smaller than Staigue or Cahergal. The view down the valley and up to the hills was incredible, even in the rain. On a sunny day, this one must be a real beauty. About this time the rain began in earnest, and I had to jog back to the car to keep from getting completely soaked. The ladies had finished making lunch and we munched on sandwiches with good strong Irish cheese and washed it down with Ireland’s best club soda. 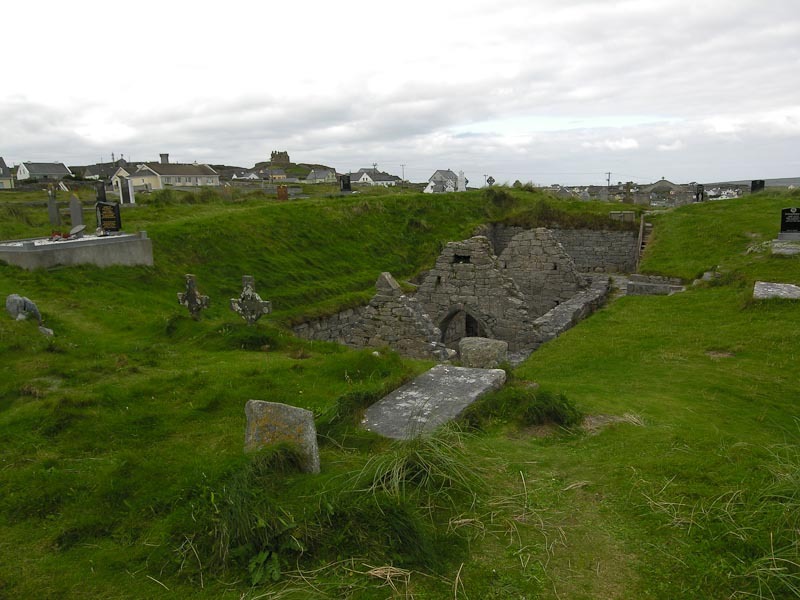 The fort dates to the 9th century AD and was probably just a small family holding with two huts inside and an underground passage beneath. Staigue Stone Fort stands at the head of the Staigue River Valley on a rise with a view over to Kenmare Bay if the weather permits. The fort is approximately 2,500 years old and is almost circular, with 13-foot thick walls and about 80 feet in diameter with a single south entrance. The fort is stone construction and is classified as a caher as opposed to a rath, which were usually wood. 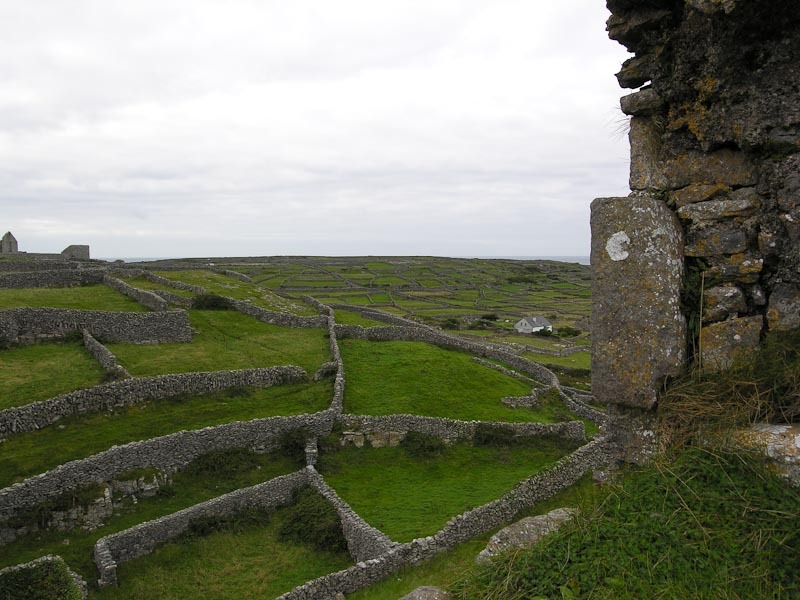 The fort consists of two drystone masonry faces filled with stone and other rubble. An internal terrace runs around the interior face this is accessed by integral interconnecting ramp-like steps that also extend up to the top of the wall. 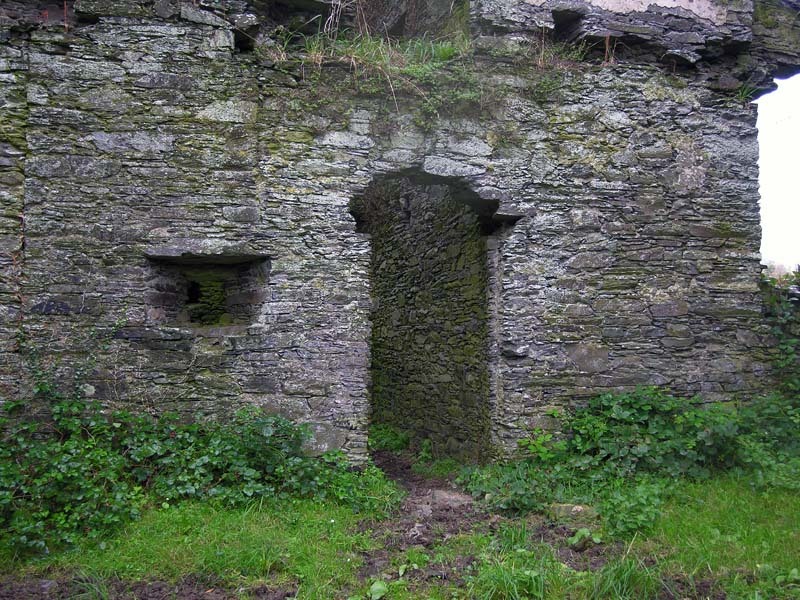 There are two small chambers in the the wall accessed through small lintelled openings. The fort was restored during the 19th century, so it may not be completely authentic in its current state. 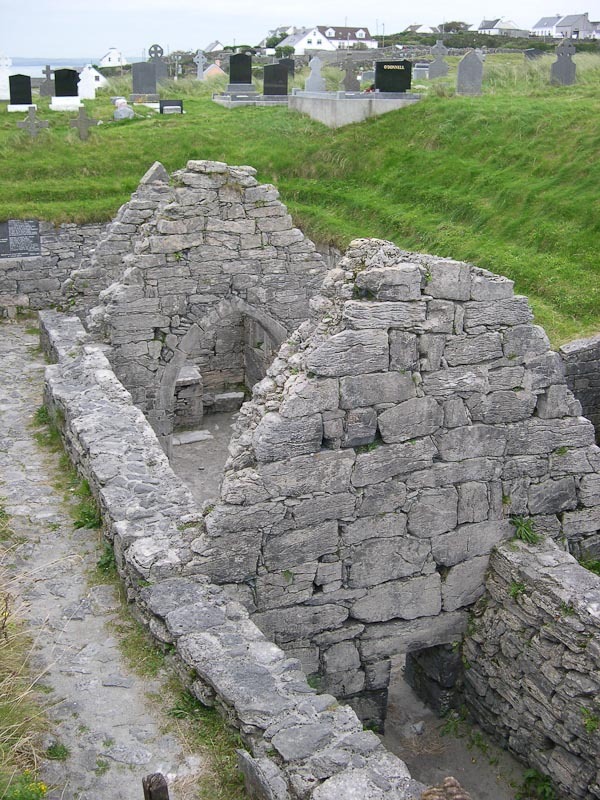 It was probably used more as a homestead for an extended family and would have contained domestic and farm buildings. 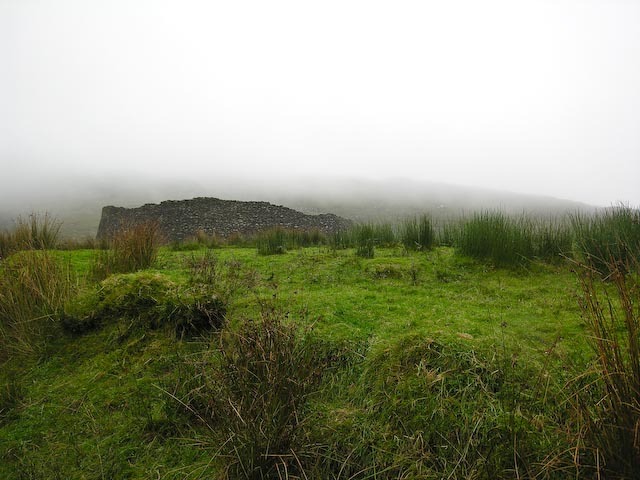 On the particular day we visited, the weather was extremely damp. A heavy mist hung over the entire valley and contributed to the atmosphere of antiquity. The ladies were reluctant to venture from the relatively comfortable confines of the car, so I set out on my own.<p>Through a One Euro gate (honor system), a small lane led up and around to the fort. 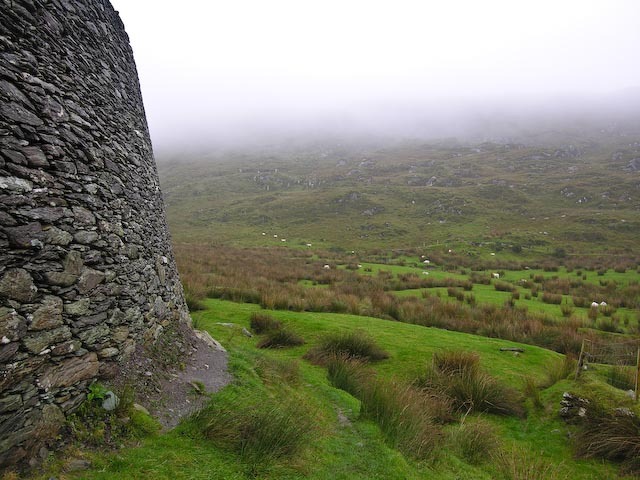 It sits on a hill and was wreathed in mist and rain. 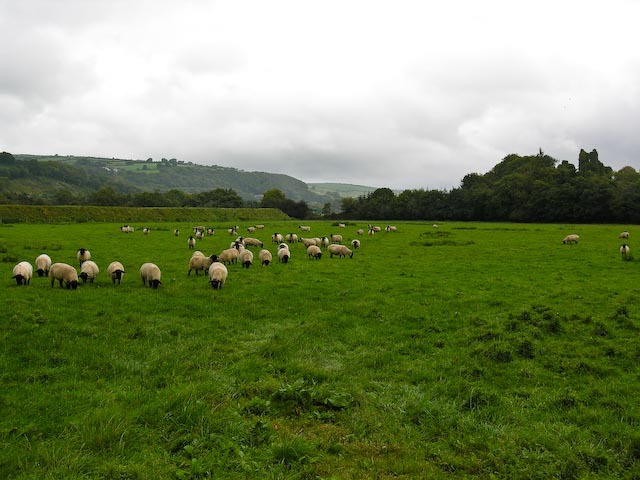 The grass was the greenest of green and offset by clumps of reddish bracken. I was alone (except for the sheep) as I entered the fort and walked around inside. 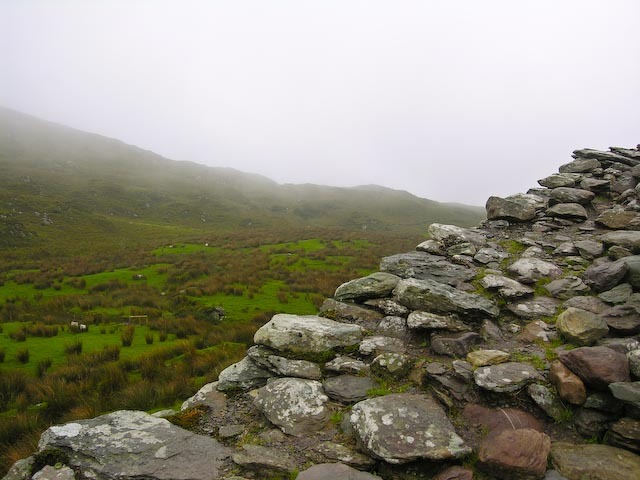 There isn’t much to see except for stonewalls, which you are not supposed to climb. I risked it and was rewarded with a damp view across the valley lined with rocks, sheep and low clouds of mist. 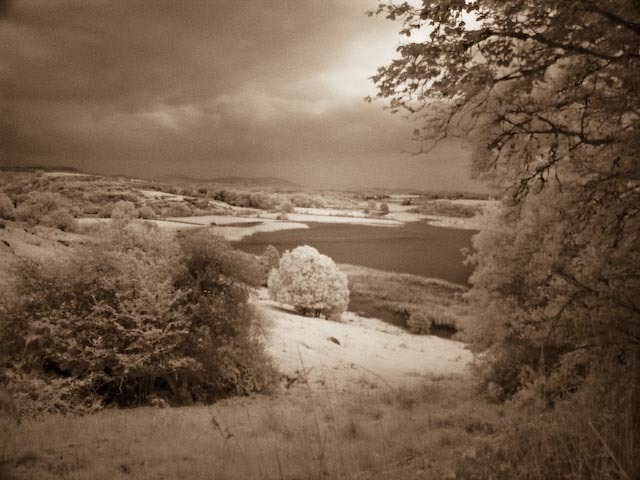 Typical Irish countryside; go figure. Not wanting to anger the Tuatha De Danann or the Garda, whomever might object most to my illicit wall climbing, I ventured back to the car. I paused along the way to snap pictures of the fort receding into the mist. I am sure it is a beautiful location and a stupendous view in nice weather and well worth a visit either way. On the way back to the main road we ran across a pretty little stone bridge. The rain had let up and we all got out to take a few pictures. Soon large drops began to fall so back into the car we went. A little waterlogged, we made our way to Staigue Stone Fort Cafe. 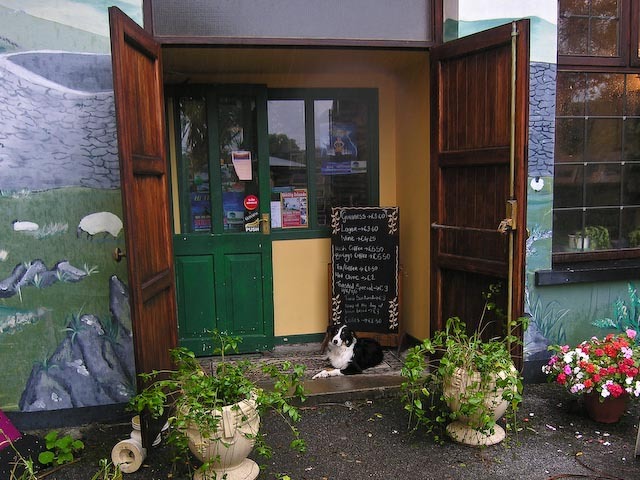 The standard Irish dog lay in the doorway waiting to greet us. Black and white and very happy to see us. Inside we waded through a forest of gift racks, tables and shelves to the snack area. We ordered an assortment of hot tea and hot chocolate and tried to shake off the cold and damp. We browsed through the gifts and found some good buys and a better than average assortment of touristy items. We chatted for awhile with the woman behind the counter while we sipped our drinks. We paid up for the drinks and gifts and headed back out into the misty, rainy day. 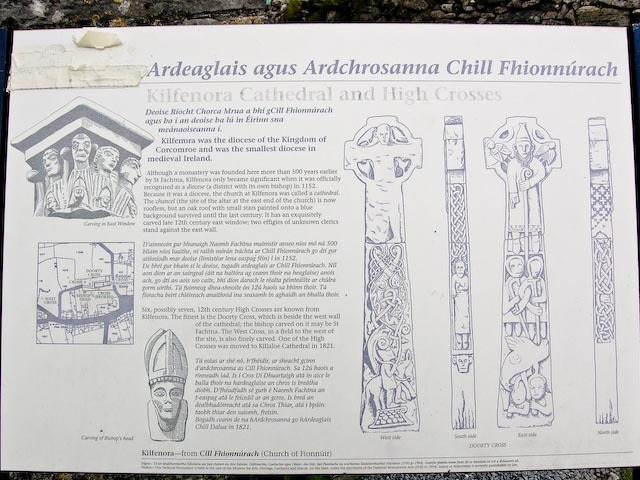 If you're in this area and headed for Staigue Stone Fort, pay them a visit. They made our damp day a bit more pleasant! The rest of the trip was uneventful and pretty much obscured by the rain, mist and windshield wipers. We did make a stop at Ladies View where there wasn't much of a view due to the mist. We spent a little time in the gift shop there. As usual they had some good deals and a wide assortment of gifts. 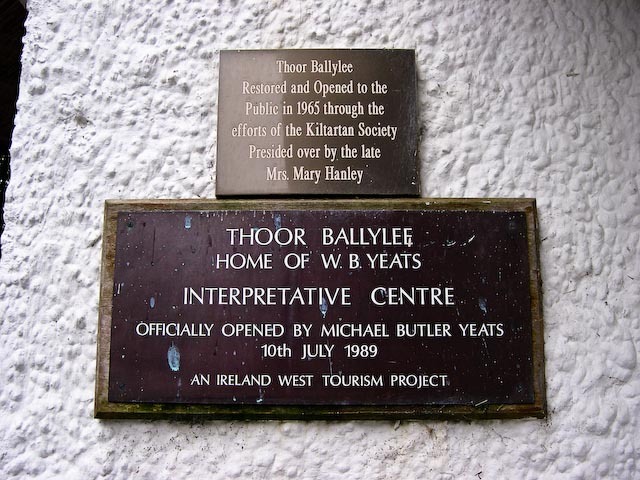 We arrived back in Ballyferriter in the late evening. We felt another day of local excursions calling us as the weather was still threatening and we'd done a long drive the day before. 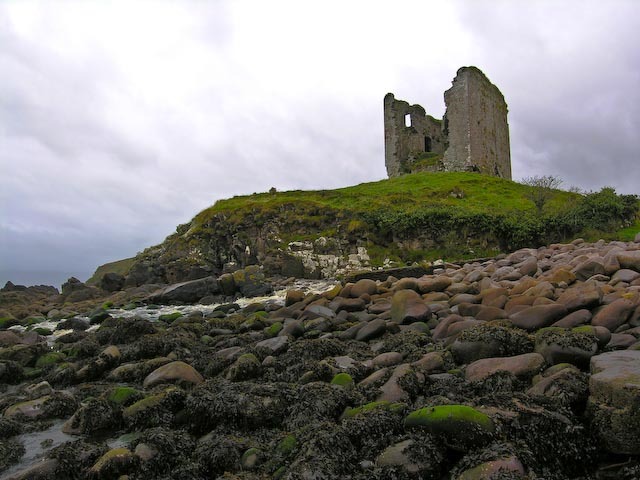 Minard Castle was our first destination after a good breakfast. 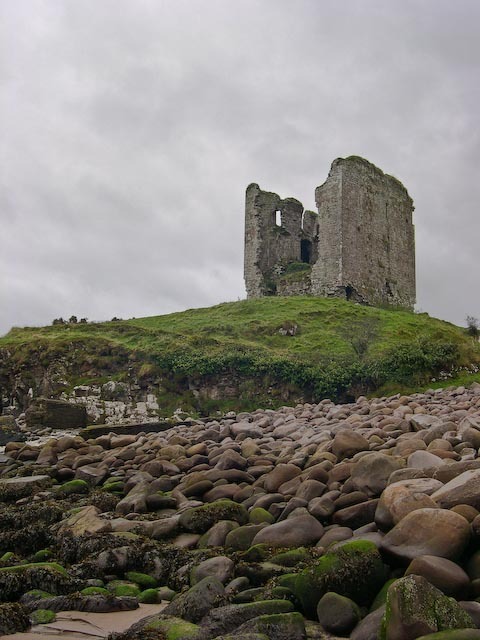 Minard Castle lies below Dingle town to the Southeast. It is a short and scenic drive. The castle lies above a bay with scenic cliffs surrounding it. 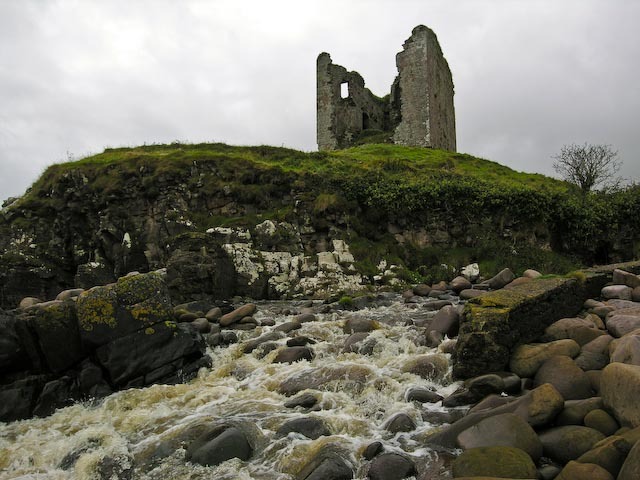 Minard Castle is located 5km southwest of Annascaul village. 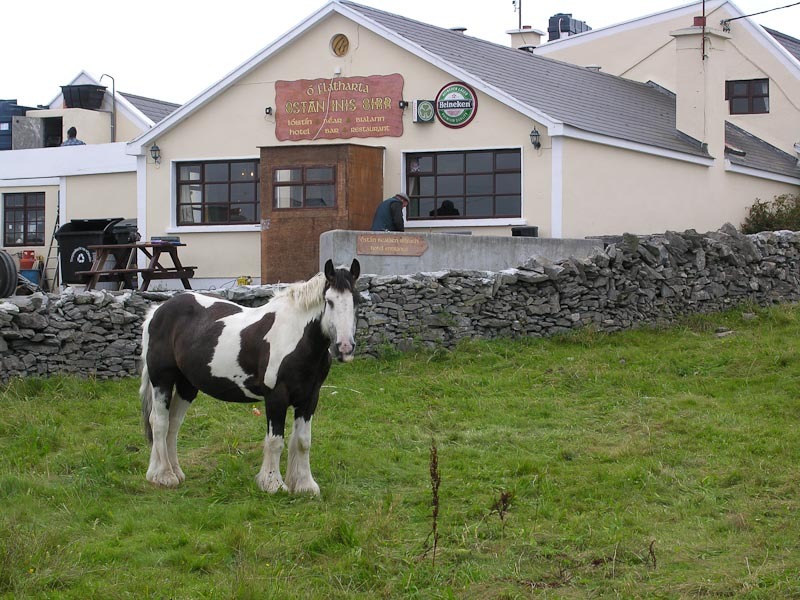 Travelling from Killarney, at Lispole, turn left after O’Sullivans Pub (if it is still there). A short drive down the road takes you to a small bridge. As you cross over there is parking along the roadside. To the West is a sand and rock beach with the castle on a hill above. Not much is left of the castle but the walls. 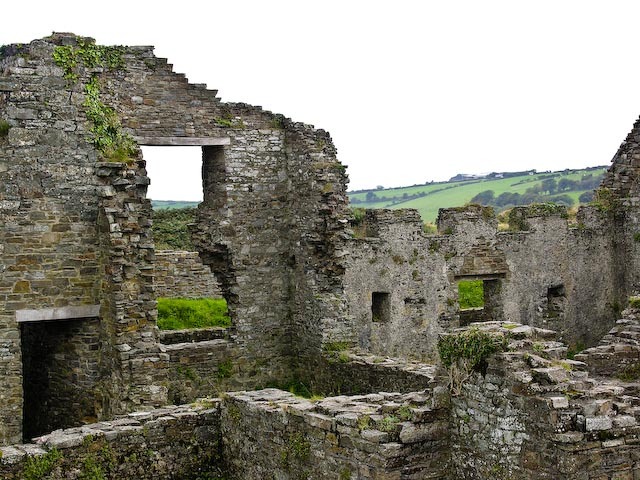 In 1650, the castle was destroyed by Cromwellian forces under Sadler and LeHunt, who set off explosive charges under its four corners killing all the occupants. The castle is not accessible and this time they mean it. It is not safe to enter or climb as the structure is very unstable. A small stream runs down along the hill and into the sea. The castle is picturesque from every angle. In particular walk down along the rocks and take pictures back up towards the castle. 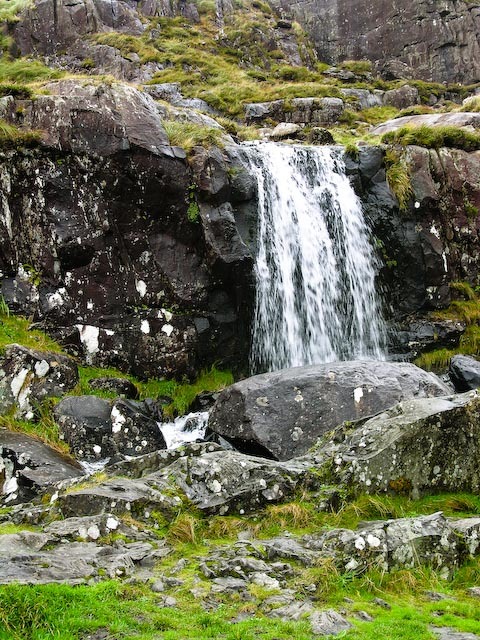 Be careful walking along the rocks as they are round, slippery and tend to roll underfoot. It would be easy to sprain or break and ankle. Keep your camera in a bag until you reach a spot you wish to take pictures from. While you’re walking on the rock, you’ll need both hands for stability. 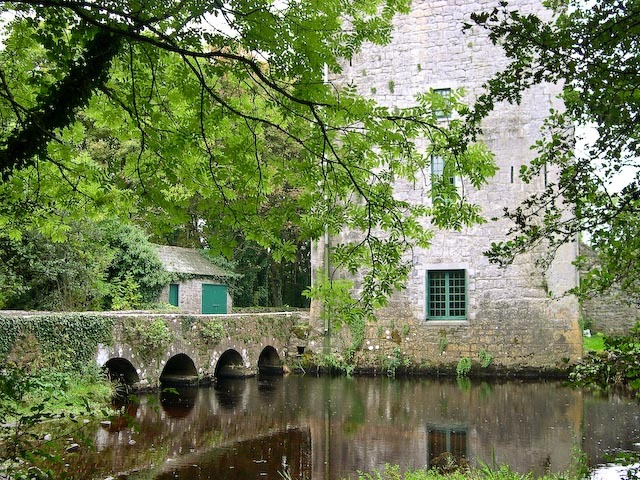 While there isn’t a lot to see except the castle, the area is very beautiful and well worth the short drive to see. While we were there a German TV crew was shooting something or other to the East of the castle. They had taken most of the parking and were extremely rude. At one point they were trying to get a large truck along the narrow road and were upset that people were blocking their progress. They were demanding people move their legally parked cars so they could park and or get by. I ignored them until I was done taking pictures. I would have probably stayed another hour had they not been so annoying. Hopefully you’ll not have to experience this. 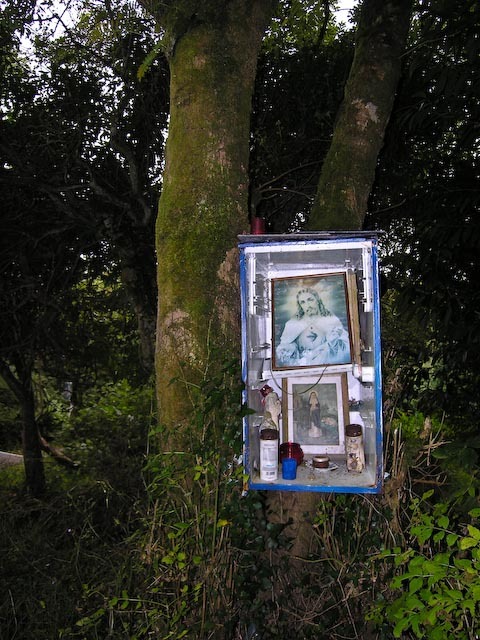 On the way back from Minard Castle we passed a small graveyard and shrine. 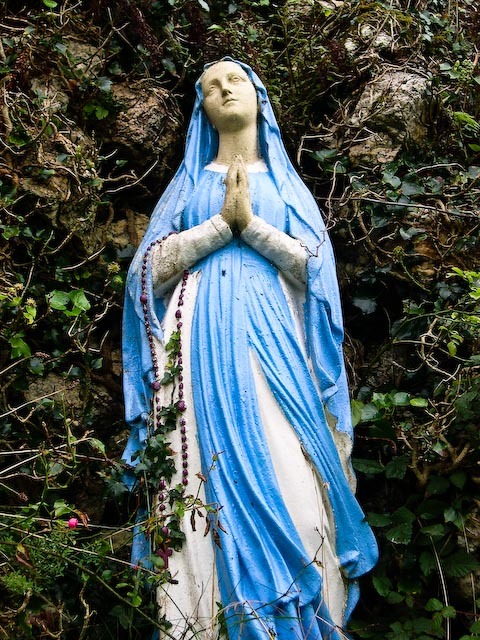 The statue of Mary was nicely set against stone and ivy and the metal entry gate was sufficiently rusted and dilapidated to be worth a stop. We took some pictures and made a quick exist when the rain started up again. 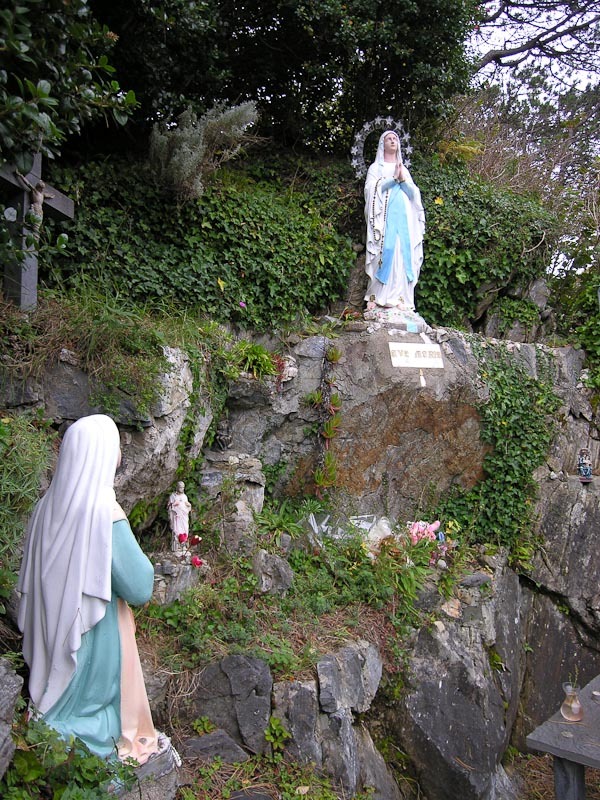 We may have mentioned that we make a habit of taking pictures of interesting Mary shrines and statues as Karen's mother Sue loved the Mary's of Ireland calendar we created of Mary statues from our 2002 trip. Back in Dingle we wandered through a few shops of the craft and clothing type. 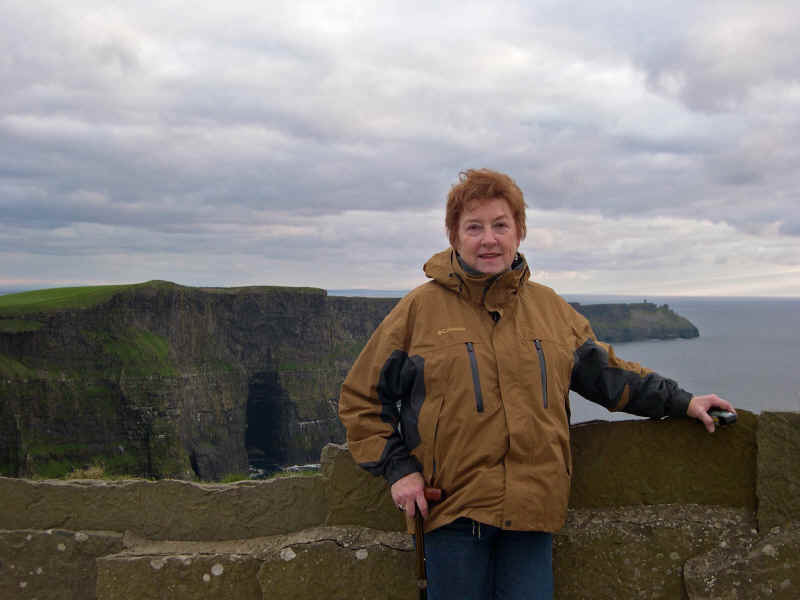 Shirley had a number of gifts in mind to purchase and we were always on the lookout for nice Irish specific items. A few Euros lighter, we moved into the main part of town facing the harbor. 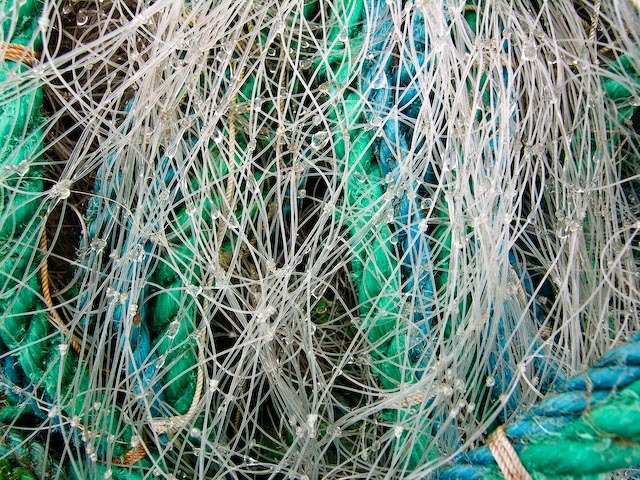 While the ladies wandered in and out of the shops, I walked among the nets, anchor chain, and other fishing detritus and towards the boats along the quayside. As usual, the sky was grey and bland and raindrops spattered on the dock. A strong fishy smell was all pervasive, I wonder what it would have been like when the boats were just in? Nothing to eventful was happening and the fishy smell was making me hungry. I went in search of the ladies and lunch. Once I tracked them down and pried them from the shop they were perusing we found a pub that looked promising. It had a good amount of locals, so we figured the food and prices were reasonable. A glance at the menu confirmed our hypothesis. The food was good and filling and we had an extra pint while we warmed up and relaxed. Soon it was back to the shopping. I couldn't escape this time as my input was needed and subsequently ignored. More purchases were made and more shops visited until we hit the Euro deficit, package capacity or lack of shops, whichever came first, I don't recall. We drove back towards Ballyferriter and took the long route as the weather was clearing. We made a stop at the Ventry graveyard. It was overgrown with long grass and the wind was blowing fiercely. We stuck it out for awhile, but succumbed to the elements. We drove back to the cottage and dropped Shirley off for a rest and hit the road again. We choose to go back to Dunquin and wandered around photographing the area as the light changed and clouds rolled in again. As we headed back to the cottage the light changed again on Clougher Head. We hopped out of the car at the turnout and took a few pictures towards Ballyferriter and to the South. Back at the cottage the light and shadows were very dramatic as I took the final shot from the backyard of the cottage. Another evening of home cooking and packing before our departure the next day for Co. Clare. We burned the remainder of the turf, gathered our scattered belongings (it is amazing how much you spread out in a week) and then off to bed. 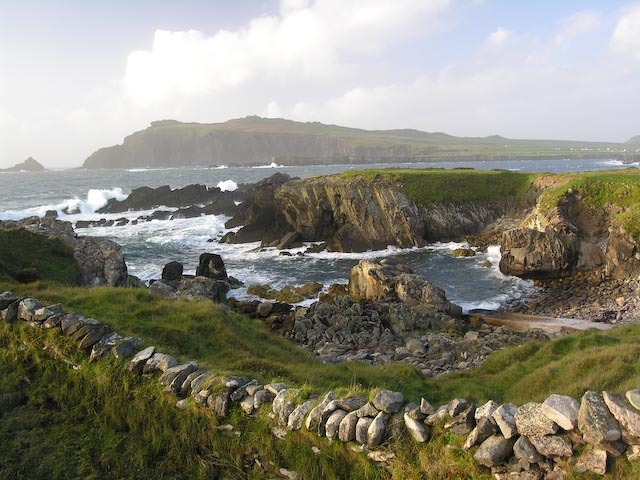 After breakfast, cleaning up the cottage, cleaning out the refrigerator and packing the car, we left Ballyferriter with great regret and headed into Dingle via the Slea Head drive route for a final look around and some shopping. The weather had improved considerably and the sun made frequent appearances as we walked along the brightly painted shops near the harbor. I wandered up and down the waterfront while the ladies made several visits to the open shop doorways. After a few minor purchases we headed out of town and through Connor Pass. The drive up through Connor Pass was interrupted often by road construction. The road is narrow with room for two cars side by side at best. Add a large dump truck into the mix and things get a bit wild. We survived the lengthy trip up. There wasn't much to see as the weather continued to worsen as we rose in elevation. 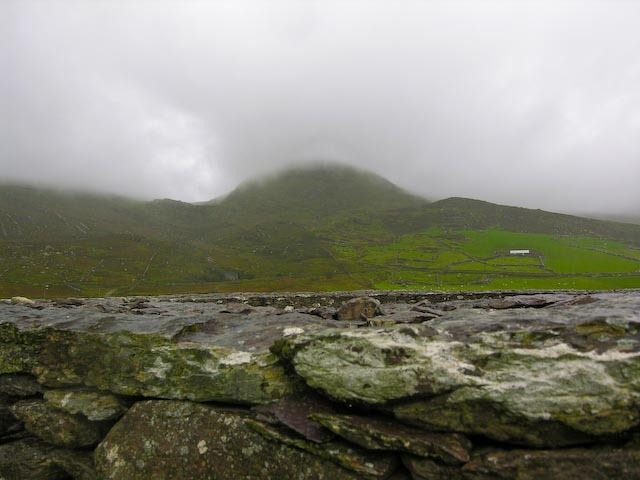 By the time we reached the summit of the pass, the wind was blowing hard and rain spattered intermittently. We were the only car in the car park. I dropped a camera in each pocket, zipped up my waterproof Columbia Sportswear jacket and pulled the hood up and tied it down. When I stepped out of the car, the wind just about knocked me off my feet. I had to lean into the wind to walk. Shifting clouds obscured some or all of the view and I only had time for a few pictures and a short video clip before I was battered into submission. Back in the car, I checked the video clip and could only hear the wind blowing against my coat but the view was nice. We headed down the other side, past a waterfall and through the swirling clouds towards Camp. We made our usual stop in Camp to visit to Mike O'Neil fine establishment, the Railway Tavern. We brought him a bottle of Rogue Dead Guy ale from Oregon and a matching pint glass and promised to send him an Oregon license plate for his wall. We hope to spend a night in Camp on the next trip and an evening at the Railway Tavern. We had a lunch appointment with our friend Julie in Limerick so we made a beeline for Limerick and made it just in time. The nice thing about Ireland is that you can get places quickly under most circumstances when you're going between larger cities. We spent a pleasant few hours with Julie over a carvery lunch (chips with everything including lasagna with cheddar cheese). We took a tour of her apartment and we were off again for Co. Clare and Corofin. We had a place reserved for the week but no clear idea of how to get there. 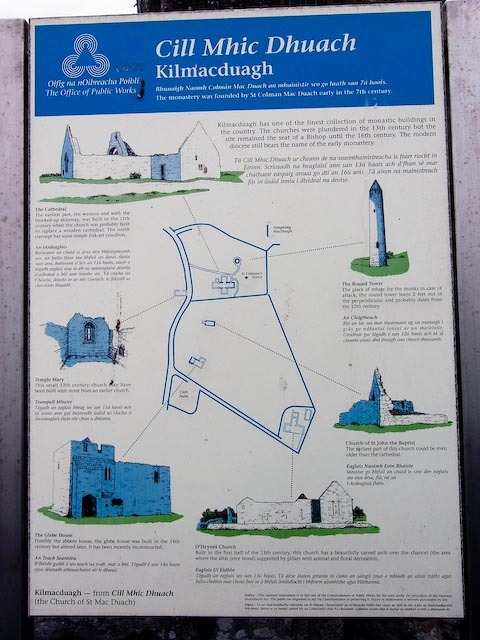 We found instructions in Corofin and went off on a winding drive along narrow lanes and through woods to the Corofin Lake Cottages above Corofin, Co. Clare. 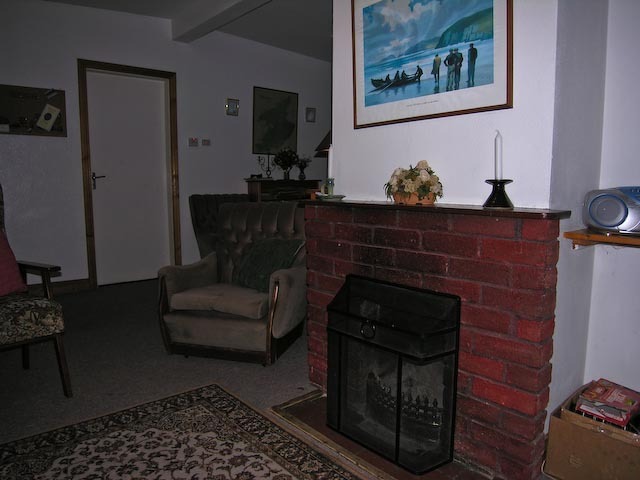 A delightfully picturesque and cold cottage with a faux stone floor. 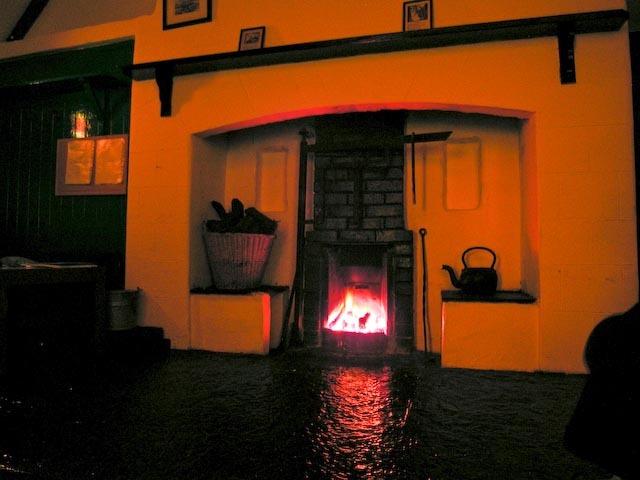 A peat fires was burning and helped to fight the damp. It took awhile, but we finally figured out how to operate the floor heating and the place became much nicer. There was a very nice kitchen with a full sized fridge, a dishwasher and laundry facilities. We had the choice of four bedrooms and an upstairs loft area. The main area was spacious with a full sized dining room table and lots of comfortable chairs and couches near the fireplace. We purchased a large bag of real peat (not compressed bricks) in town for less than 10 Euro and still had some left at the end of the week. I don't know if you're supposed to import it, but we packed it home. We didn't pretest the mattresses, unfortunately they were horrible. Little more than the springs covered with a sheet. I think they bent all the ends upward to poke into the sleeper. I seriously considered sleeping on the faux stone floor the last night. Nothing more enjoyable than driving all day followed by a relaxing evening on pointed metal skewers. We're considering bringing or purchasing a blow up airbed as we had several experiences with less than adequate mattresses in our excursions. 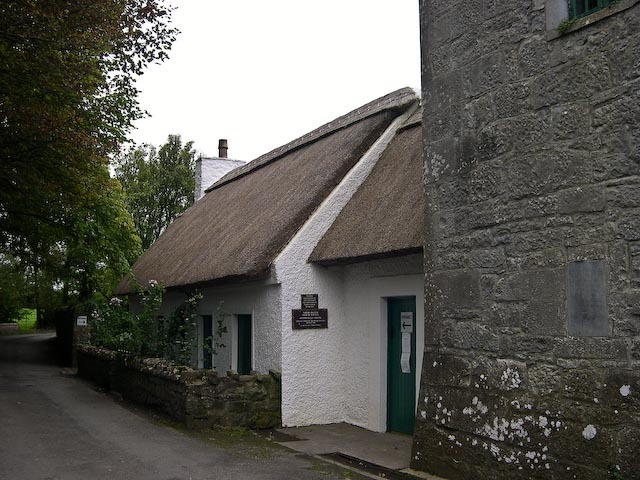 We made many day trips including Doolin, a boat ride to Inis Oirr, Gort, Ennis, a Lough Derg drive, Spiddal and up to Clifden in Connemara and back through Cong. 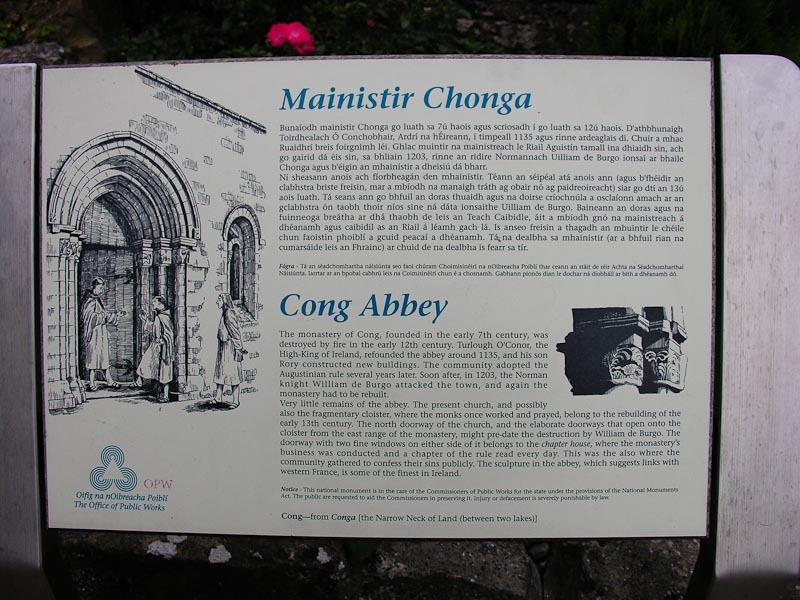 We liked Cong Abbey, but were not impressed much with the Quiet Man stuff. 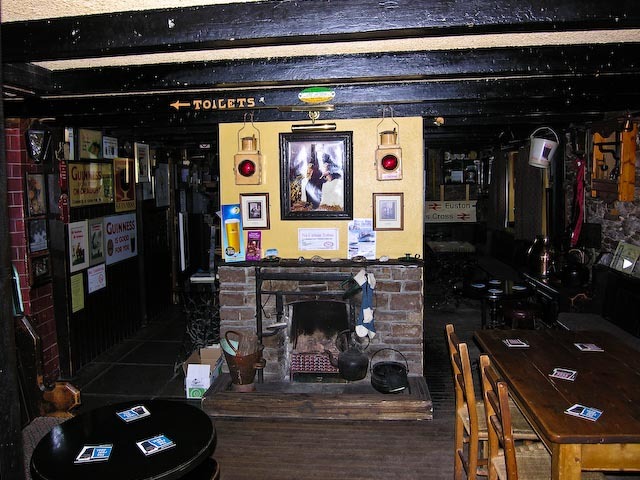 We made several night trips to Kilfenora for the music at Linnane's Pub. The owner Gerard's mother led the Kilfenora Ceili Band for many years, and some of the members played a session while we were there. Gerard was the consummate Irish bartender, the Guinness and food was excellent and the craic was mighty. We also tried Vaughan's Pub for the set dancing, but were not very impressed with the pub or the dancing, perhaps it was an off night. 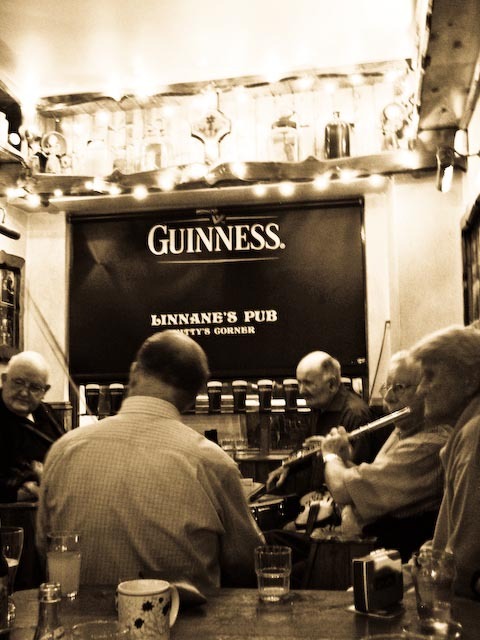 We had a quick pint and returned to Linnane's. We took a walk on Sunday morning up the road from our cottage. The road was narrow with some great views down the hill to the lake below. Along the way we encountered many cows. The ones below were skeptical, but finally came over to visit when bribed with tufts of grass from our side of the fence. Up close the cows were coated in poo and covered with flies. Make you wonder about what beef is marinated in for the years before you eat it! We went for a long drive as the weather was overcast with intermittent rain. 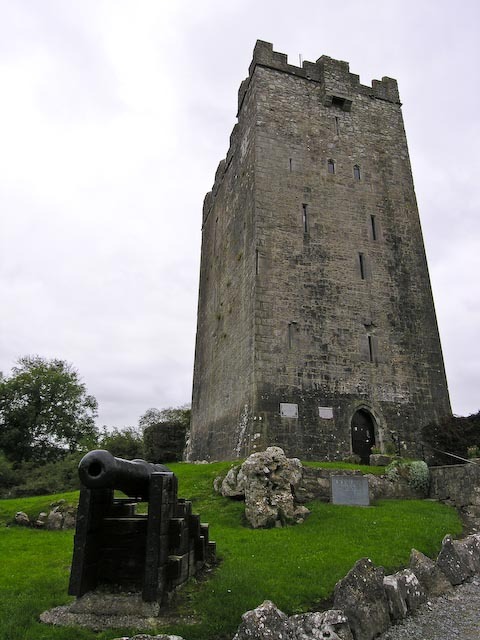 We hit more of the major towns in the immediate area of Clare. 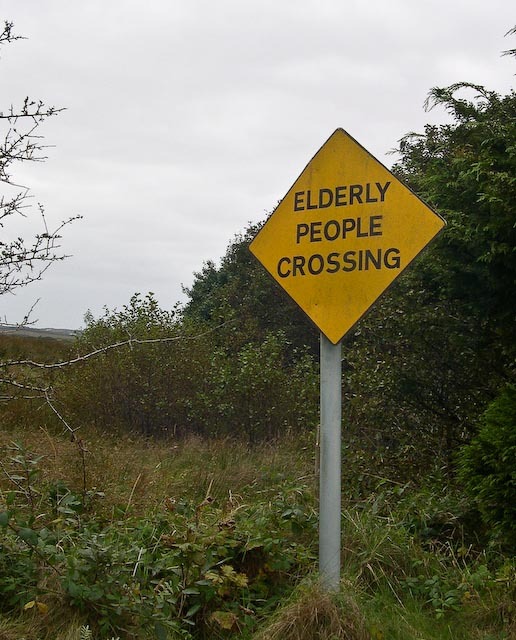 Along the way we were warned about Old People Crossing just outside of Lisdoonvarna. We didn't see any. Lisdoonvarna was pretty quiet on a Sunday morning. We stopped at a store for some water and snacks. Apparently once the Matchmaking Festival is over, things quiet down considerably. 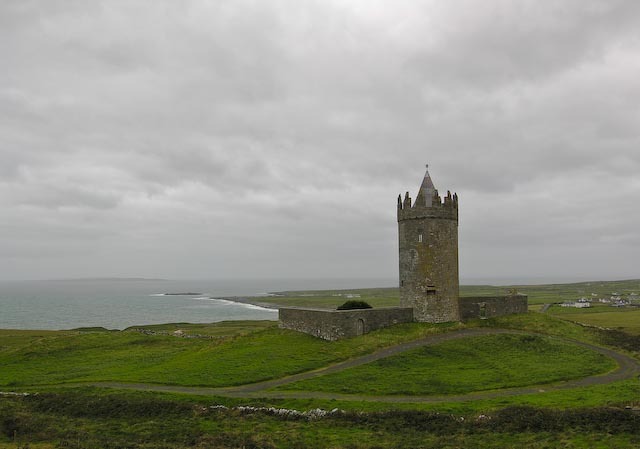 After Lisdoonvarna we headed out for Doolin. Again, not much happening and most of the shops and pubs were closed. 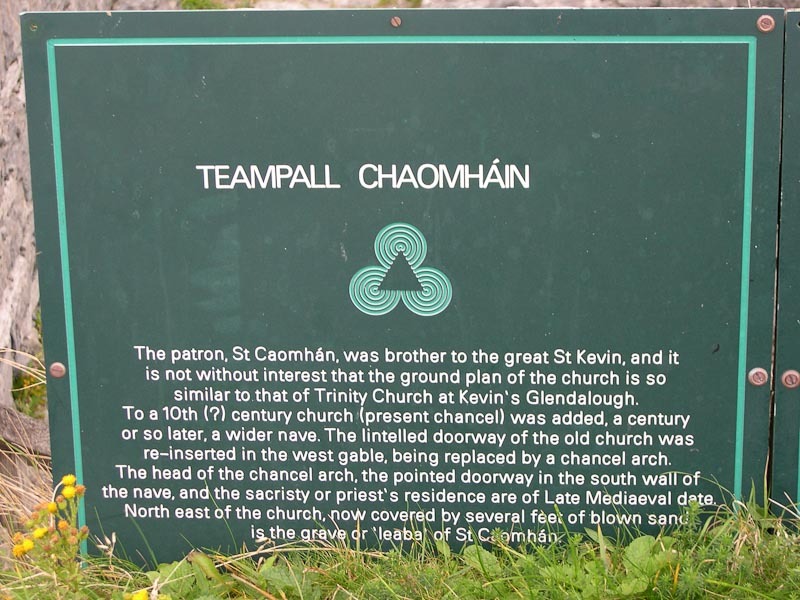 We took a big loop around and came back to Kilfenora and walked around town and then to Cathedral. It was open and we wandered through and took a few pictures in the rain. Back at the cottage we made some dinner and hung out in front of the fireplace with books and plotted the coming week's activities. 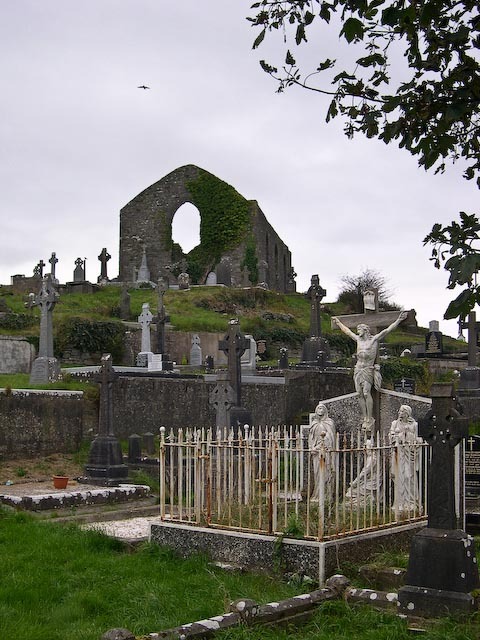 Another day on the road wandering took us to the Old Ennistymon graveyard. The graveyard is above the town and to the South. 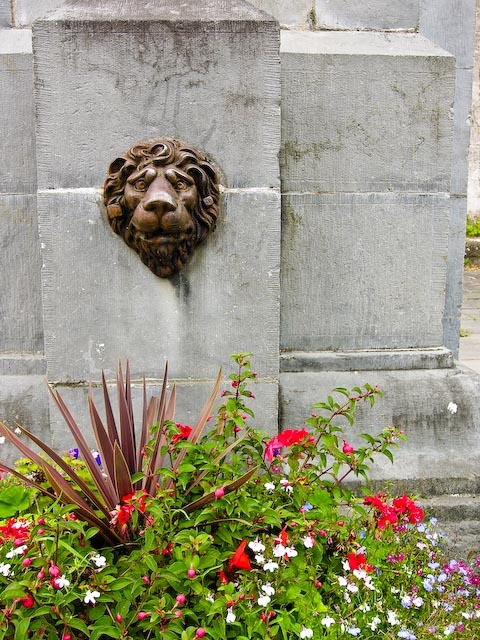 It is quite a large graveyard with a number of interesting headstones and crypts. We spent a good deal of time wandering around and taking pictures. Shirley went back to the car early as it was still chilly and we eventually finished our wandering and returned to the car as well. 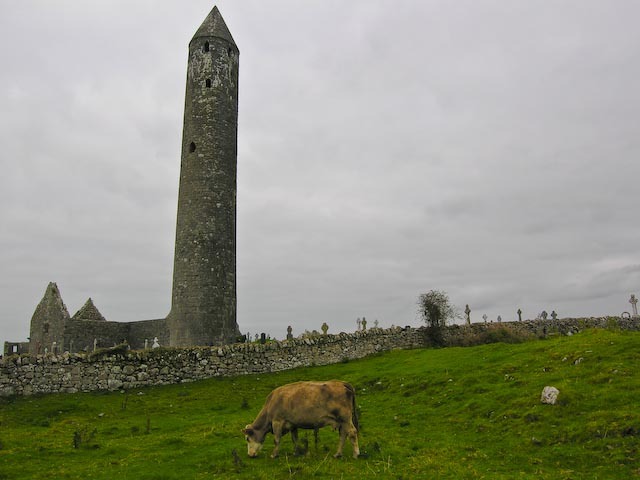 The day was still young and we headed off for Co. Galway to see the Kilmacduagh Monastic Complex. 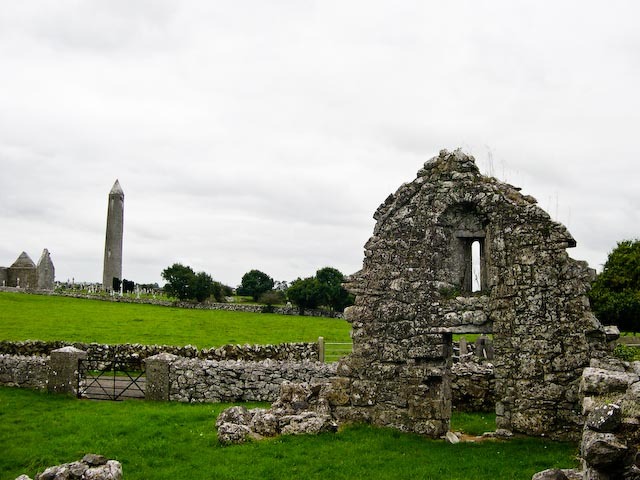 We'd visited Kilmacduagh on both previous trips and it remains one of our favorite places. 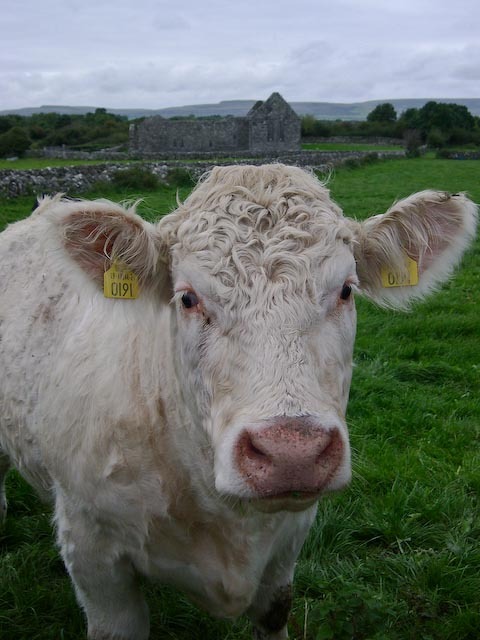 Its location right on the edge of the Burren affords some very scenic pictures and we are always amused by the inquisitive cows near the car park. The cows did not disappoint and stuck their heads over the stone walls, hoping for a handout. 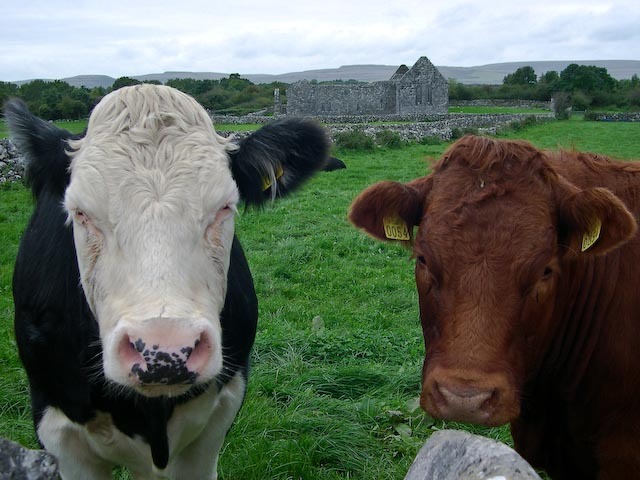 We petted some noses and offered handfuls of grass as they posed for us with the ruins and Burren in the background. Then it was off to tromp around the site. Shirley held up well with all the walking as the site is quite large (see the sign with map). The sky was overcast, so we didn't get some of the dramatic pictures obtained in 2007. We spent about two hours getting reacquainted with the site and apart from some grounds keeping, found little changed. The next stop was Dysert O' Dea which we'd not seen before. This took some finding as it is on a back road and not well signed. Probably the easiest thing is to find Dysert Castle and then work from there as it is a more visible landmark. 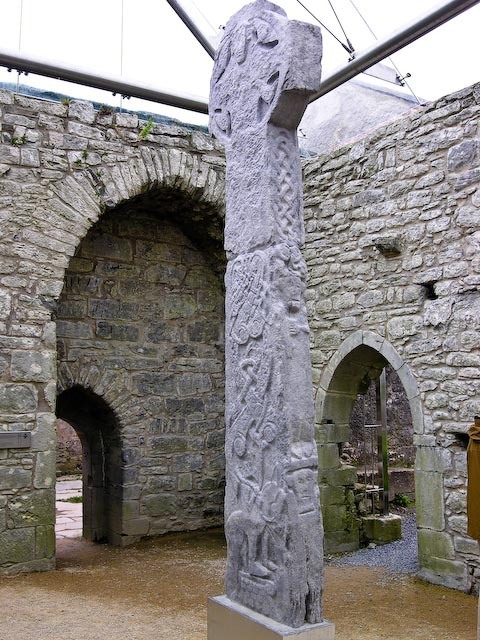 Dysert O' Dea has some fine high crosses and its most interesting feature is the faces carved over the church doorway. 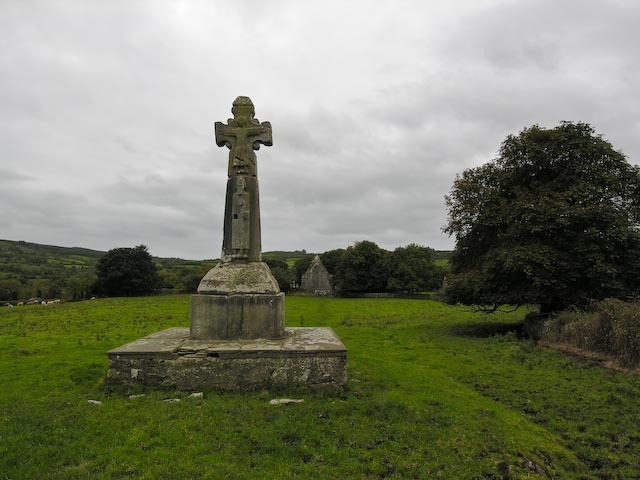 We visited the church first and then climbed over the wall to see the high cross in the field. 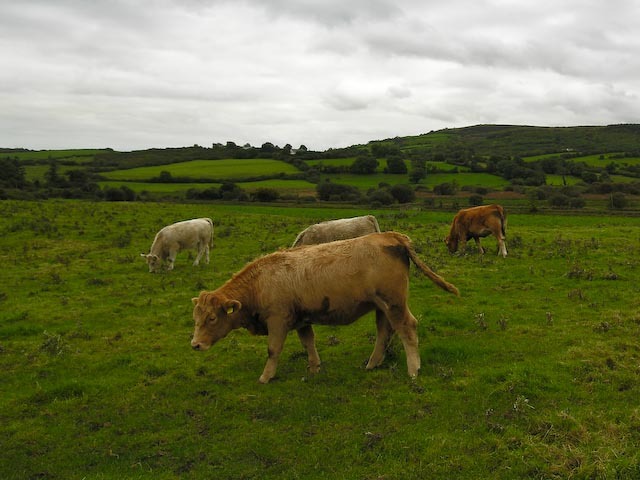 We braved the usual bovine crowds, these seemed less interested than the Kilmacduagh cows. 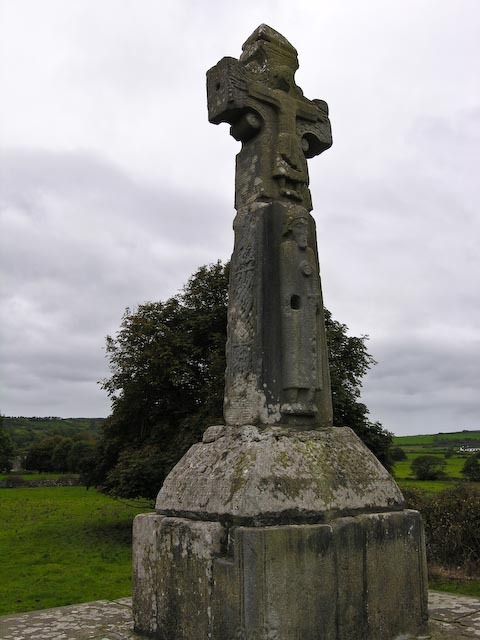 You can also access the high cross from the Castle side as it is just beyond the high cross. The castle was closed which was disappointing from a cultural as well as a biological standpoint. We were hoping for an open bathroom! We did some more driving and ended up in the Gort area. We paid a visit in town and stopped at the local sport shop where we acquired a hurley and sliotar. You never know when you'll need one. We determined that most of the sportswear was to expensive for our tastes, though we did want a Kerry, Clare and Cork jersey. We wandered out of town and found our way by design or accident, I don't remember which to Thoor Ballylee and Yeat's Tower. 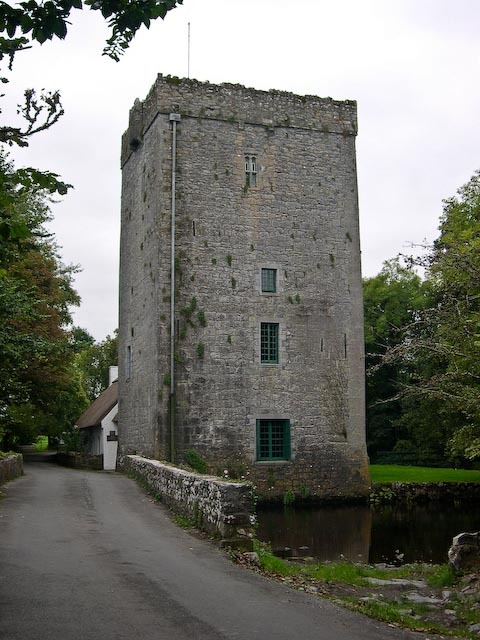 Thoor Ballylee is a castle that William Butler Yeats restored. There is a nice stone bridge along one side. Of course it was closed, but we wandered around the grounds and took pictures. We took the back roads to Corofin and called it a night. 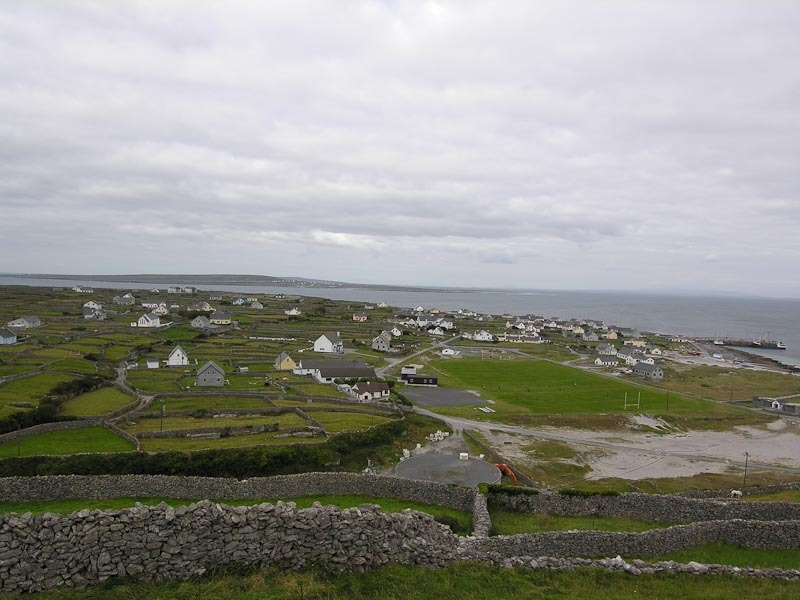 Our destination of the day was Inis Oirr. 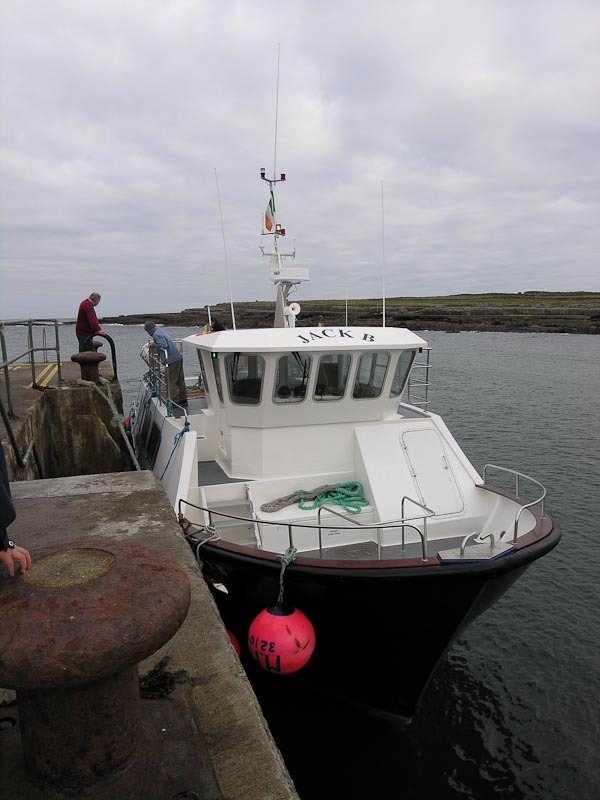 The boat left from Doolin and made a direct connection to the island and returned later in the day to pick us up. We got up early and arrived in plenty of time to buy a ticket and then board the medium sized boat. The boat got significantly smaller as we headed out to sea. The waves were quite large and rocked the boat. Some of the passengers sat inside while quite a number braved the elements and stayed outside. They were soon quite damp. This wouldn't be a good trip for someone nervous about boats or prone to seasickness. We arrived without incident on a solid concrete quay. It was nice to have unmoving ground underfoot. We set off walking in no particular direction as there were not any. No map or signs that had any relevance. It turned out we were going in the wrong direction to see much and what there was proved to be closed for the season. We wandered along the shore and then in the other direction. 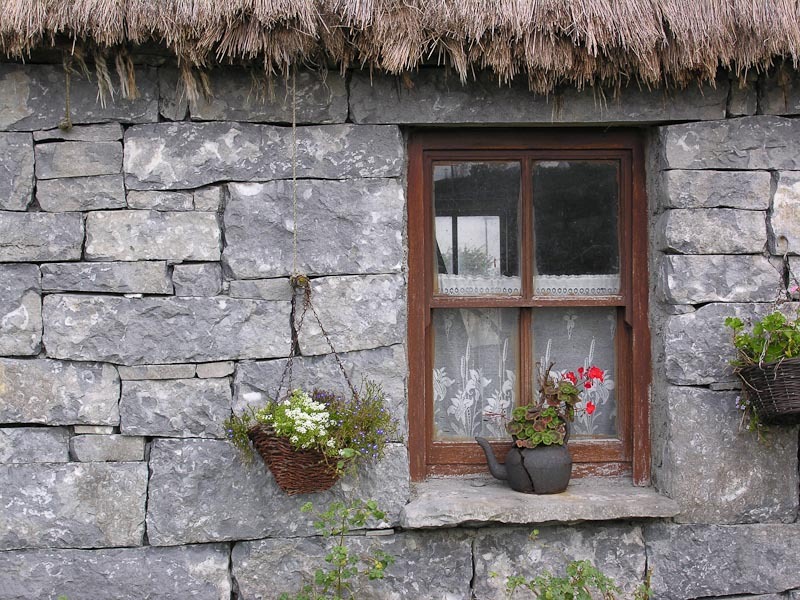 Along the way we spotted an nice thatched cottage with nice hanging pots and flowers on the window sill. We walked up the hill towards a castle. We passed a less reputable cottage that looked abandoned or at least poorly maintained. I don't imagine it takes long for the elements to weather anything quickly in this environment. The wind was blowing stiffly and the air was chilly. 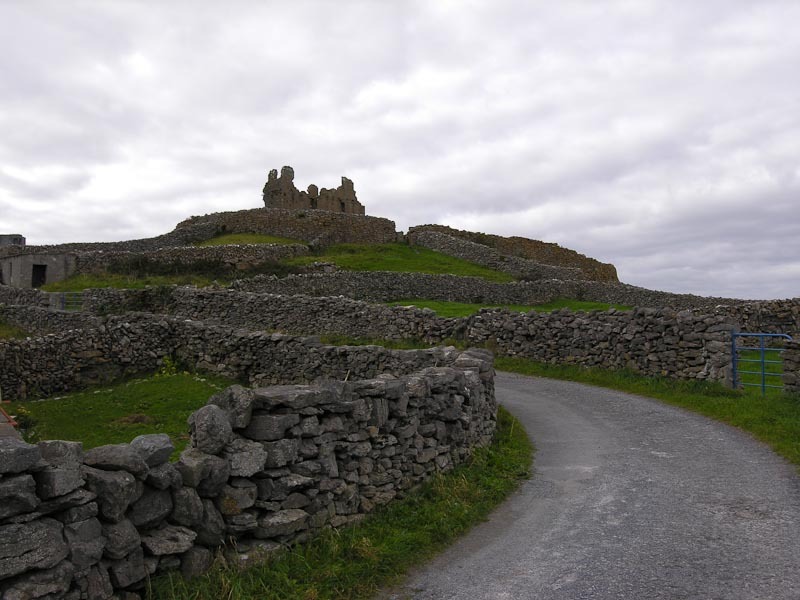 The road led up along stone walled lanes. We stopped to take a picture with a travel section from the local newspaper. We intended to submit it, but never got around to it. Eventually we arrived at the castle. The walls were battered, but there is an excellent view of the island and the town below. 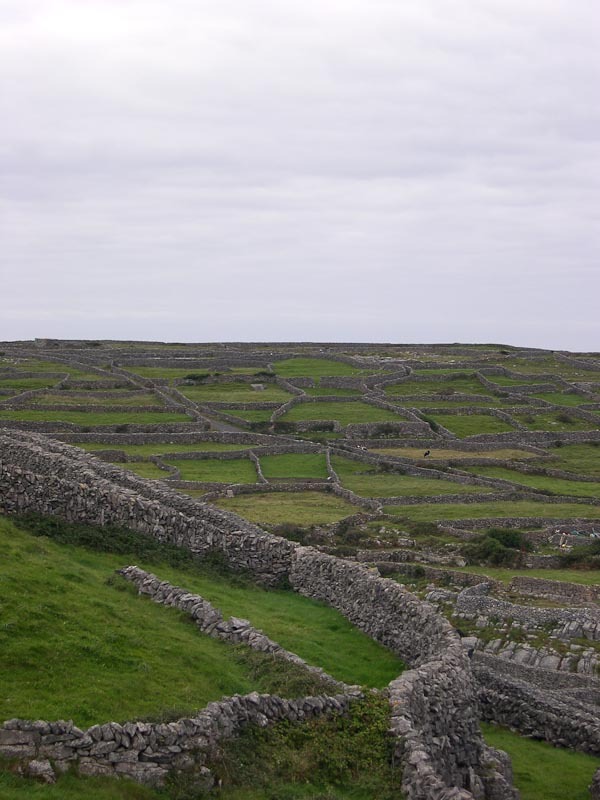 Stone walls crisscrossed the land, dividing green fields into a patchwork of green and brown. We took a few panoramas of the landscape, one of which turned out well. Thoroughly chilled we headed back to the pub for a pot of hot tea and then took a walk back towards the quay. A few horse drawn carts passed by looking for customers, but Karen's allergy to horses kept us away. We walked through town and saw horses in small fields next to houses, interesting mounds with signs, and a few dogs, or maybe the same dog just getting around quickly. 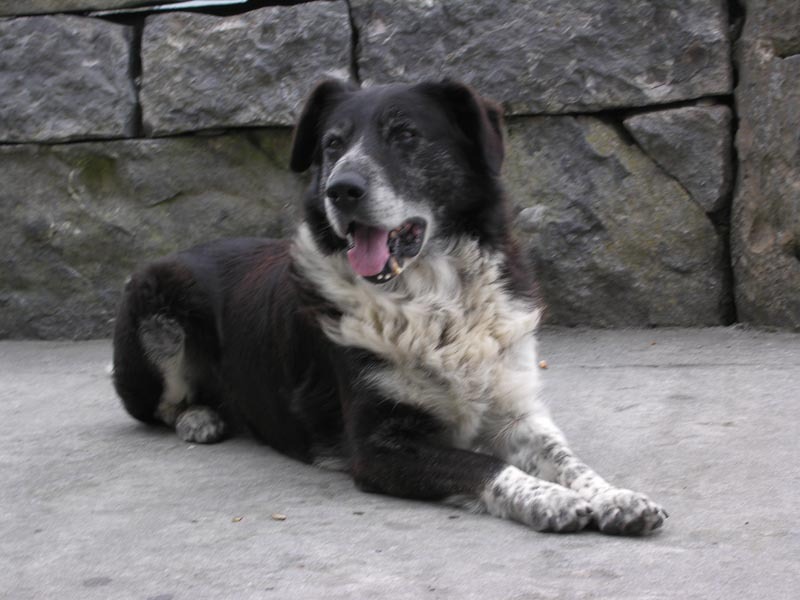 Most dogs in Ireland are small black and white sheep dogs. We walked back to the shore and wandered along doing some beachcombing for shells and interesting rocks. 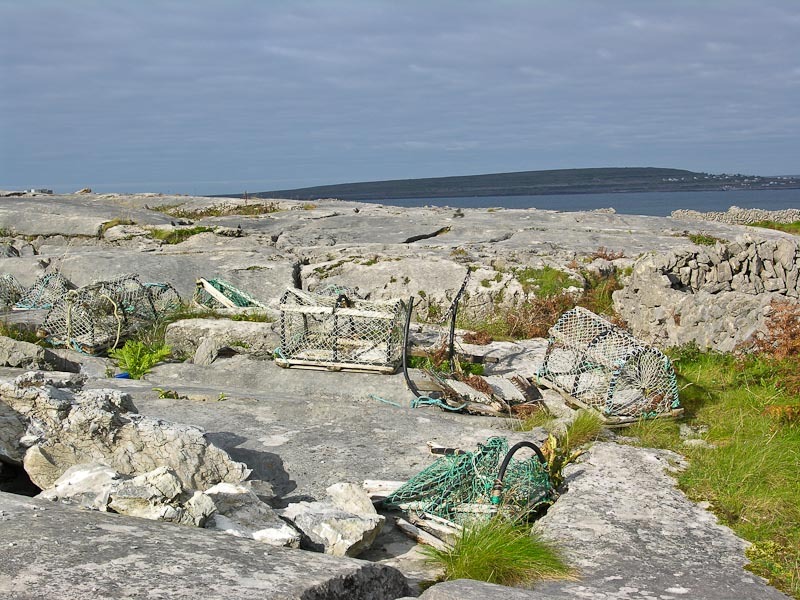 The rocks are very similar to Burren rocks, but more smoothed by the sea. We came to another pub and took advantage of the facilities and shelter from the wind. We chatted with the bartender and examined the memorabilia on the walls. 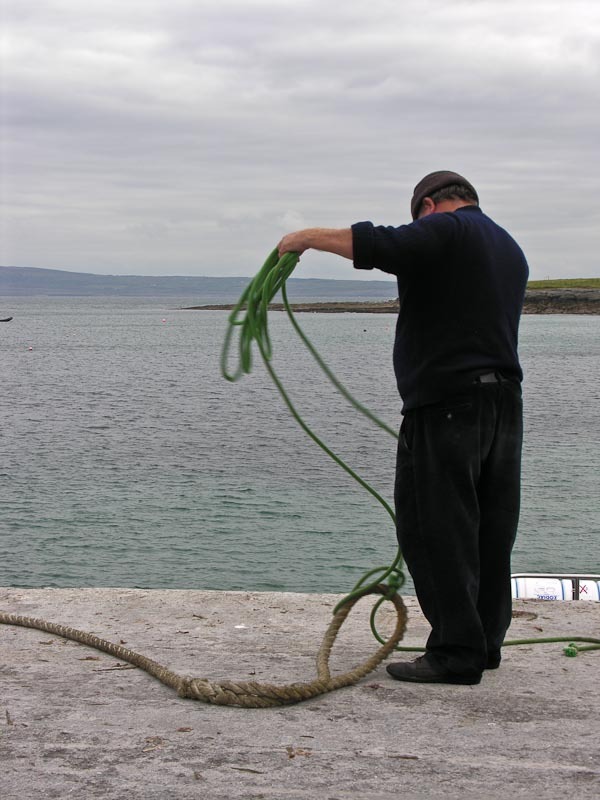 Eventually the ships horn sounded and we made our way back to the quay to catch the boat to Doolin. 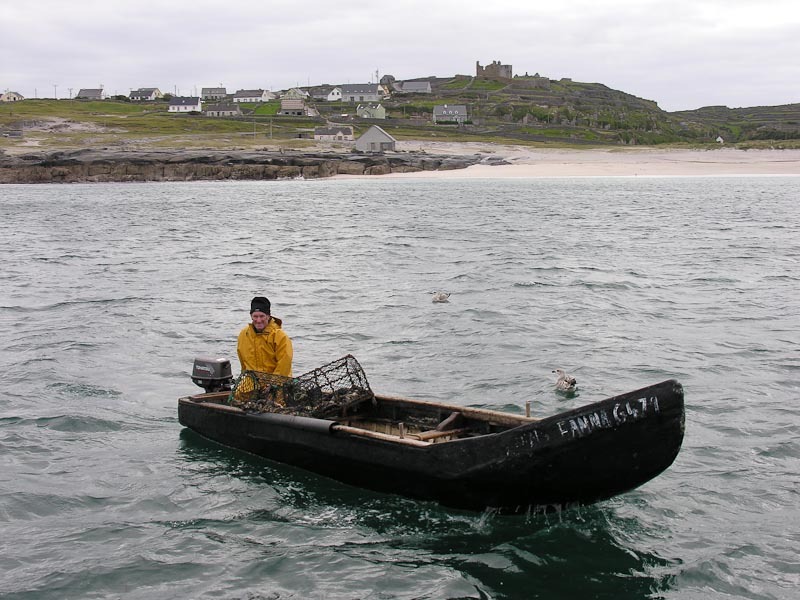 On the way out, a lobster fisherman zipped by in his currach, looking a bit chilled and wind blown, but probably glad not to be rowing. We spotted the wreck of the cargo ship Plassy still rusting on the shore since 1960. 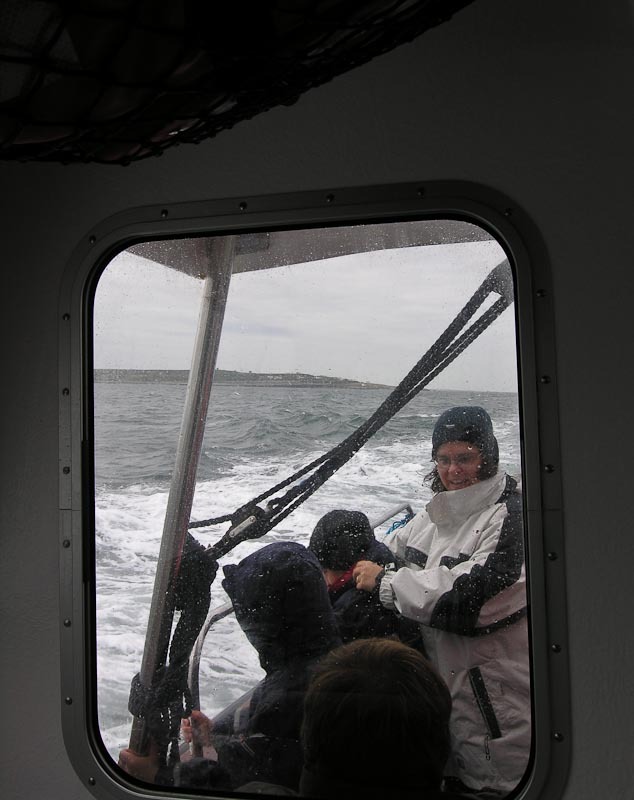 We experienced the same rough seas on the return trip, perhaps a bit more than before. We arrived safely in Doolin, a bit under whelmed by the experience. Going a bit earlier in the season would have at least made bikes available and more shops and sites would have been open. Oh well, live and learn. 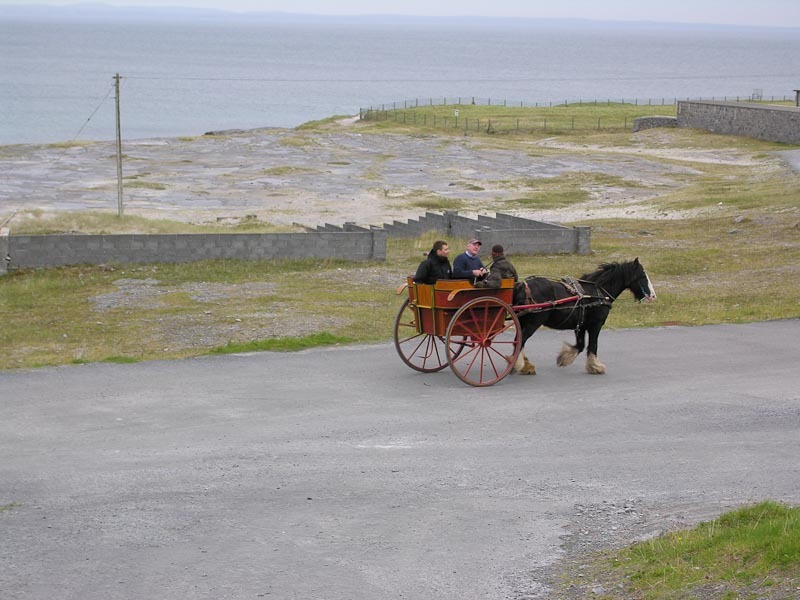 This is not to in any way suggest that you shouldn't visit any of the Aran Islands. Just pick your time carefully and adjust your expectations accordingly. 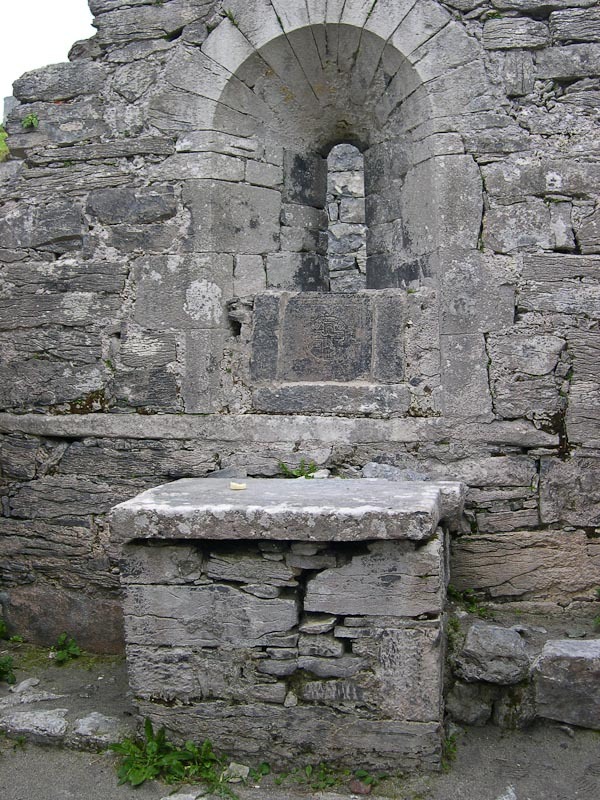 St. Flannan's Well or as I like to refer to him, the patron Saint of Recycling is located in Maurice's Mill near Inagh Co. Clare. Northeast of Inagh, Drumanure. From Inagh on the Corrofin road take the second turn left to Drumanure, down a black road. Ask locals for directions (as we had to), since this well is unmapped. At the time the path up to the site was pretty rough. Just a worn area through the weeds and mud. As of 2007 there is a nicely laid out path with sawdust and a roped off boundry. 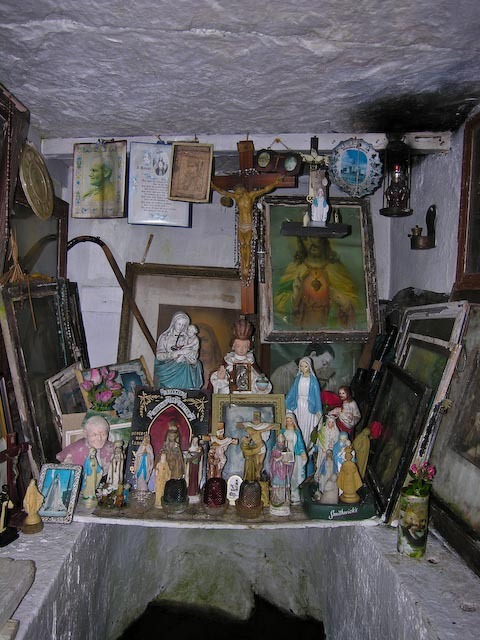 The site is obviously carefully tended and surrounded by unusual little altars decorated with fresh flowers. Lighted candles illuminate the well house. 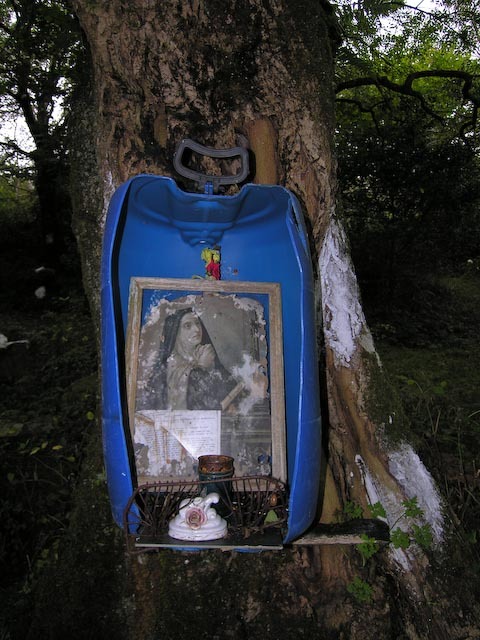 A sacred old ash tree is venerated and it is claimed that the water from the well doesn’t boil. Pattern Day on the 18th of December is still popular. 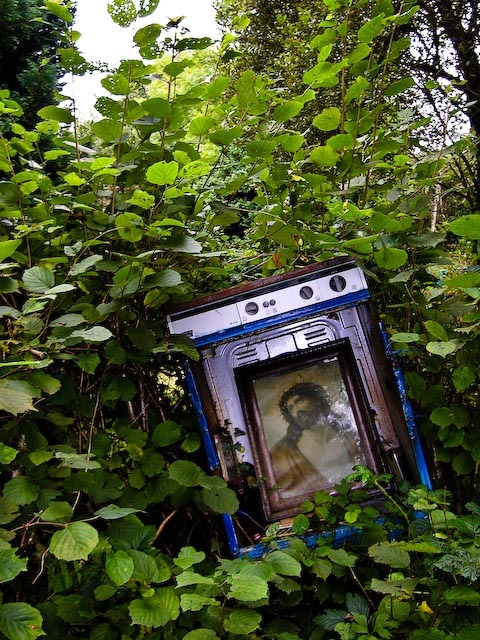 Evidently someone had a lot of spare appliances, plastic bottles and other debris and decided to use it decoratively. 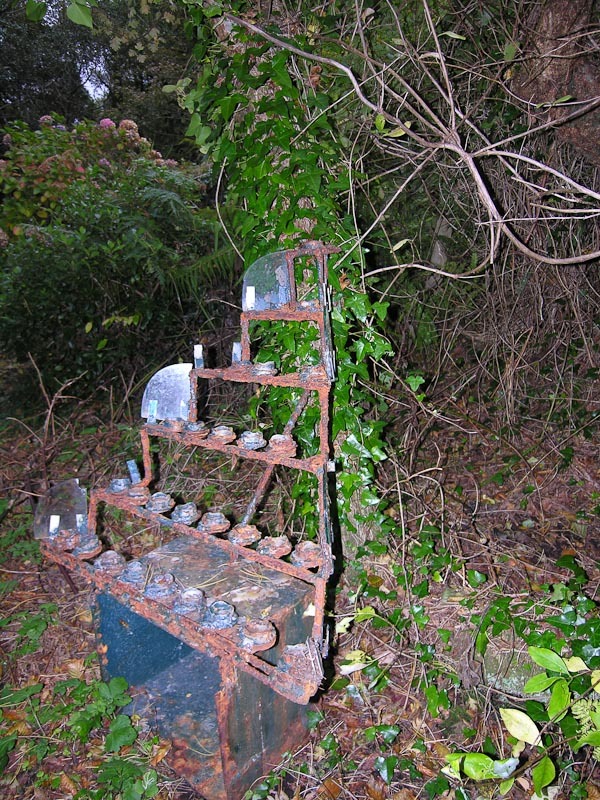 I even spotted what appeared to be a chemical or insecticide sprayer of some kind that had been cut in half and filled with statuary. We avoided being overly familiar with the black and white puppy who created us enthusiastically as he was crawling with fleas. 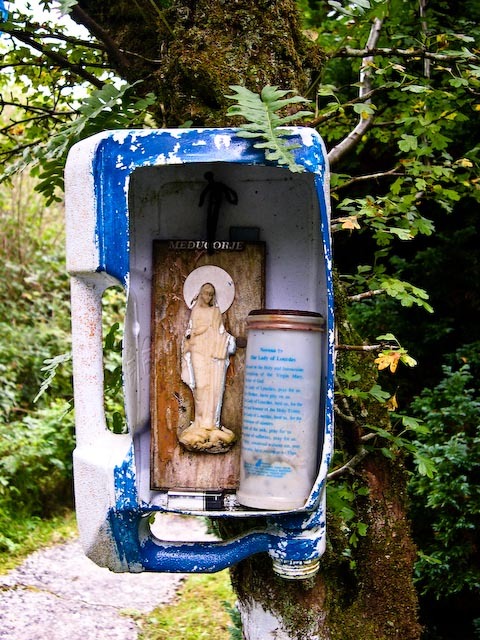 We had a interesting time wandering among the iconography and then slogged back to the car. Leaving the well we headed out into the Burren and stopped at several point for photos. Below is a panorama of one of the more picturesque sights. A rocky canyon opening out onto a flat area before heading into almost pure limestone. Close examination of the ground reveals many small wild flowers and quite a number of small snails darting about with exquisite slowness. 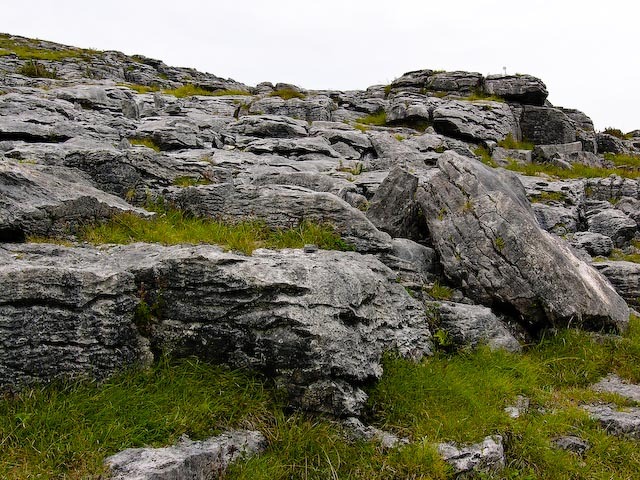 We followed signs to the Burren Perfumery where all the scents are made from local flowers or so the story goes. We didn't find anything that exciting or maybe that is just the male perspective, so we left empty handed. It is a long drive out to the perfumery and after awhile the rock all looks the same. 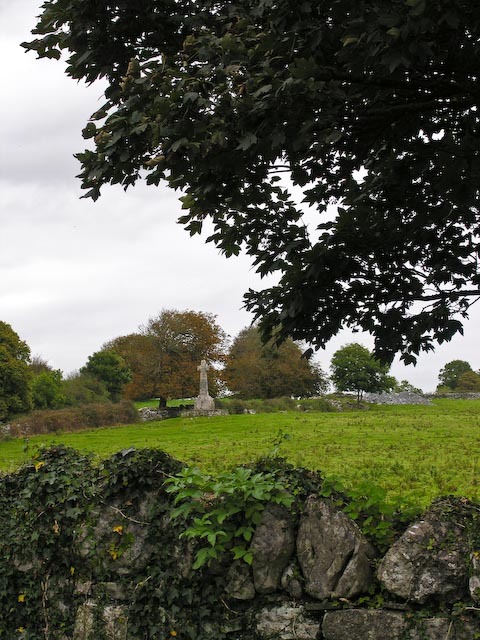 Heading back towards Corofin we saw Carron Church along side the road. We pulled over and walked out to the church. 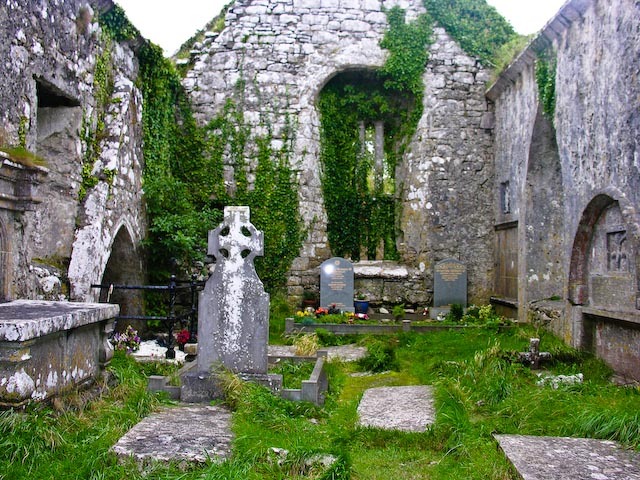 It is another small church and after the many others, it was just an ivy covered ruin with some headstones. None of the pictures came out well and the sky was pretty grey and made the pictures even less interesting. 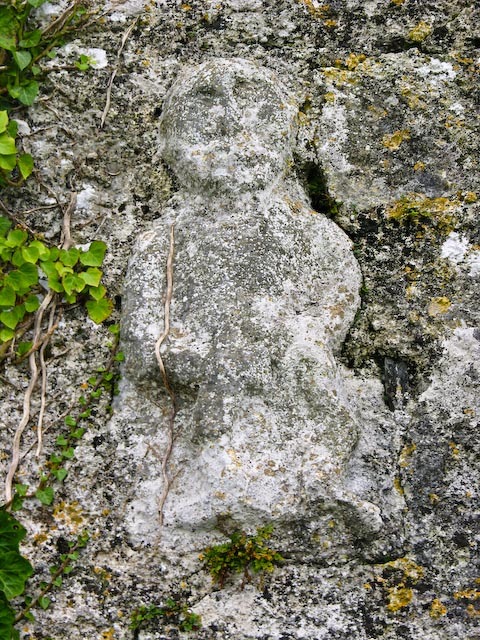 We did find more of interest at Kilnaboy just outside Corofin. This was our third visit. For some reason we like this site. 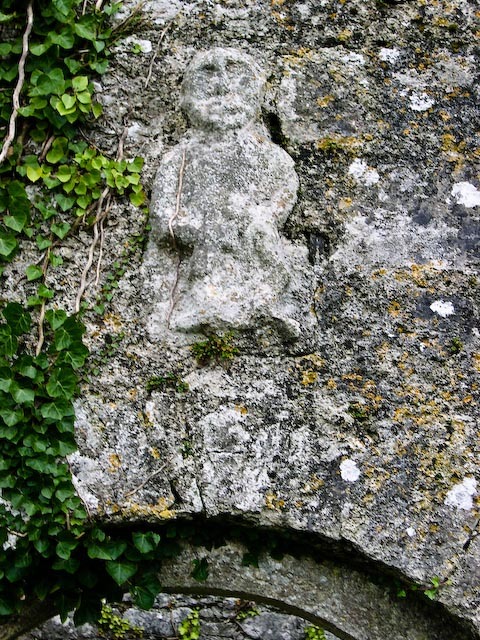 Perhaps it is the location, perched on a hill or having a convenient car park, or the sheela na gig over the door. There is the remains of a round tower in the church yard, covered in ivy. There is a mix of new and old graves and some are quite recent. The site overlooks Lake Inchiquin, but it is barely visible through the trees across the road. We took a long drive to Ballyvaughan to see more of the Burren and then drove around Black Head and back across the Burren to Corofin. 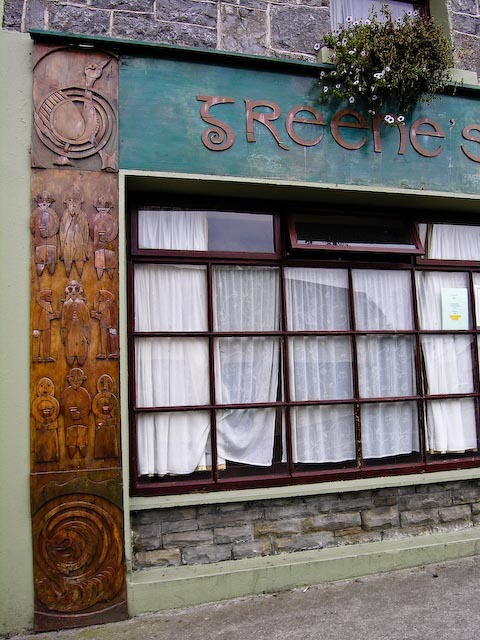 We'd been told that members of the old Kilfenora Ceili Band were to play in Linnane's pub in Kilfenora that evening. We had some dinner and then got back in the car for the 15-20 minute drive to Kilfenora. The road took a bit longer in the dark and I made Karen and Shirley nervous as I zipped along the dark road and around sharp corners. I had driven this route so often in the past few days that I knew every corner and hill. We made it one piece and settled in the pub for a crowded evening of music. The band was in good form and had a number of guests joining in. We stayed for several hours and then called it a night and made the drive back to Corofin safely but with a few more white knuckles from the ladies. 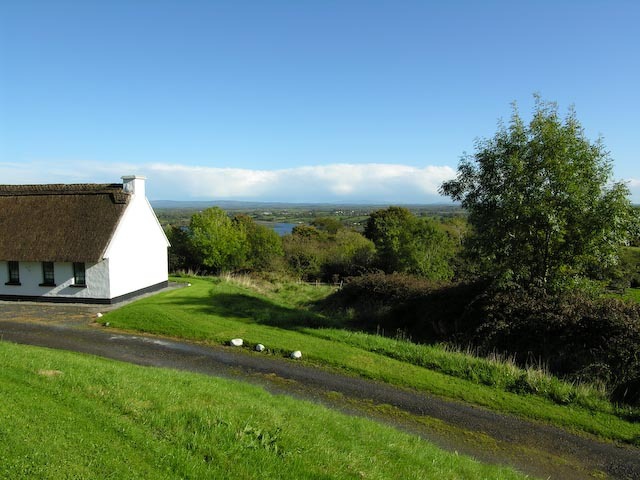 This morning we thought we'd take a long drive to see Lough Derg and drive around the East side. From Corofin we took the R460 through Tubber to Gort and then the R353 toward Portumna. Along the way we made a few stops. The first was driving through the trees on the way out of Corofin. 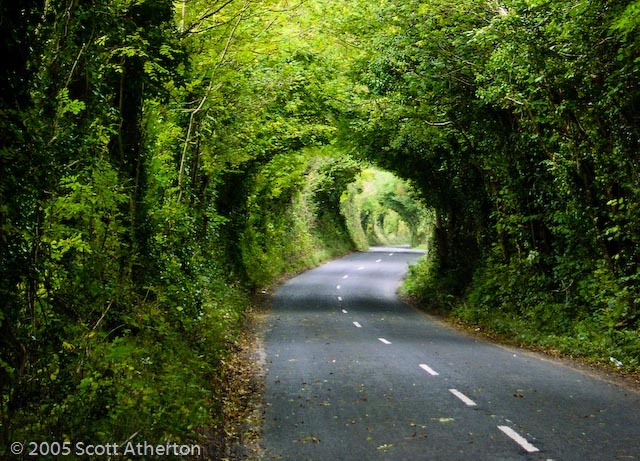 The trees had been trimmed in an arch over the road forming a tunnel of green. The next stop was to see the Abbey Friary or as we called it Abbey Abbey. 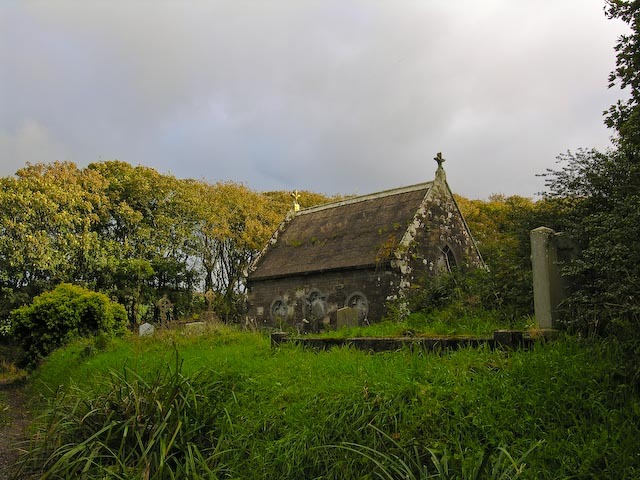 It is a nice small ruin with some interesting buildings in a well tended graveyard. 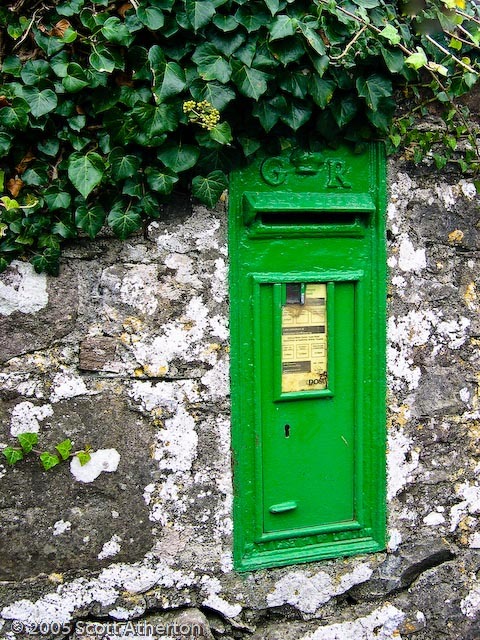 As we drove along we spotted several photo opportunities including a mailbox set in a ivy covered stone wall. The rest of the drive was pretty but uneventful. The weather was primarily overcast with some bursts of sun through the clouds. We stopped along the way for pictures when the sun came out and a scene caught our eye. It was a nice drive, but again, being the wrong time of year, many of the tourist sites were closed. 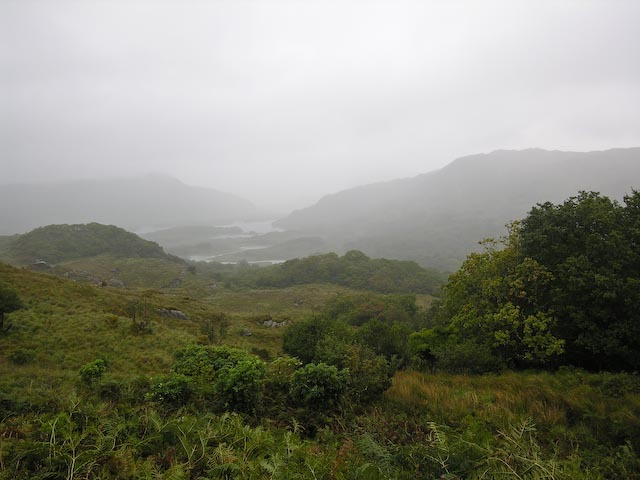 A long and painful driving day (with some small rewards) through Spiddal, then to the Connemara to Clifden and to Cong. The weather ranged from overcast and cold to downpours. We spent a lot of time driving and little time looking. In spite of all that, we were able to get a few good pictures. 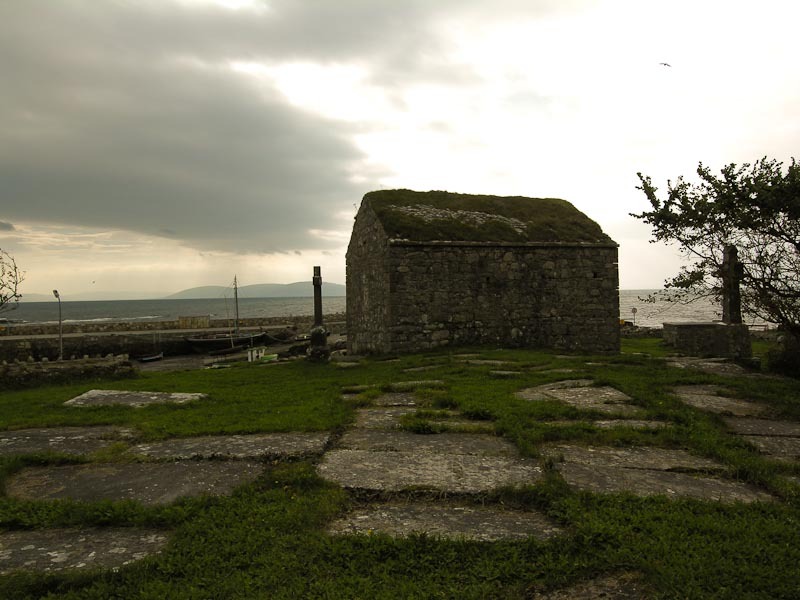 We made a quick stop in Spiddal to visit the graveyard right next to the quay. This is a nice location as you can see the bay, see the boats and visit the church and graveyard all from the quay car park. It was a bit overcast and gray in preparation for the rain to come throughout the day. The area is exposed to the wind and can be quite chilly. 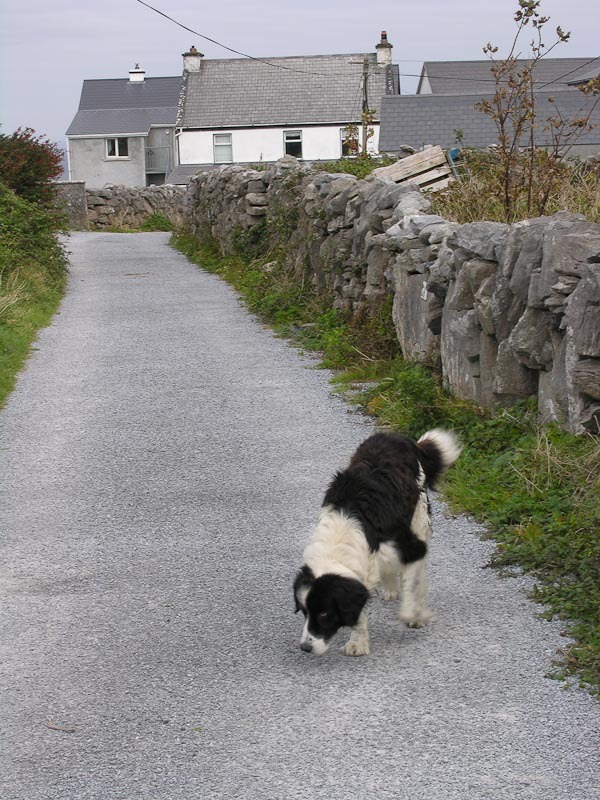 We headed of for Clifden and zig-zagged through the area, taking the most direct route. It rained quite a bid and was pretty cold, so we didn't get out much except for bio breaks and one stop for lunch. We parked next to a large patch of gorse in bloom. If the sun had been out the landscape would have been much more attractive. In brief, it was pretty desolate, barren and gray, beautiful in a gloomy sort of way. Clifden was crowded and it was raining so we swung through and kept going. Further along we made a stop at what appeared to be a gift shop. Apparently they'd put up some statutes and plaques. One said that on such and such a date absolutely nothing happened. We ran across a boat near Letterfack, rusting in the rain alongside a battered looking pier. We parked in the car park and I went out on the pier for a closer look. 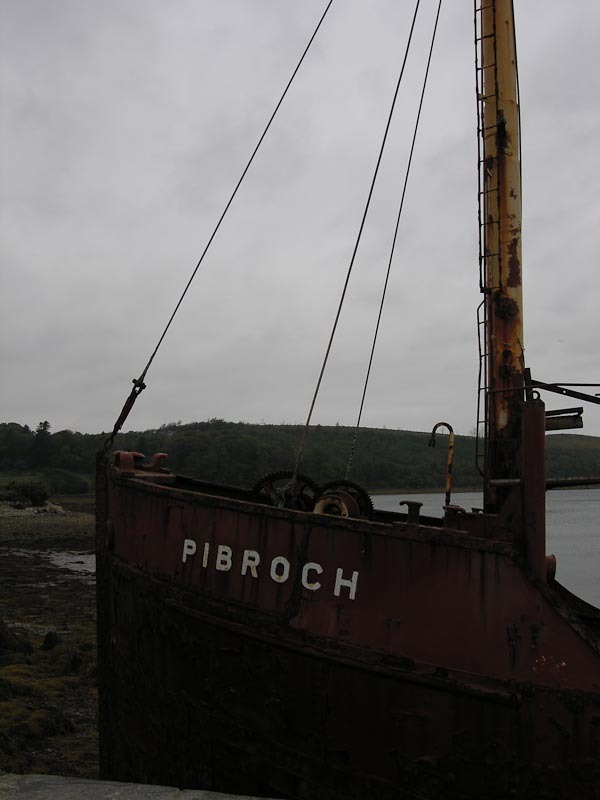 The boat name was Pibroch. The boat is badly rusted and much of the paint is flaking off. Further research reveals some interesting facts about this boat. 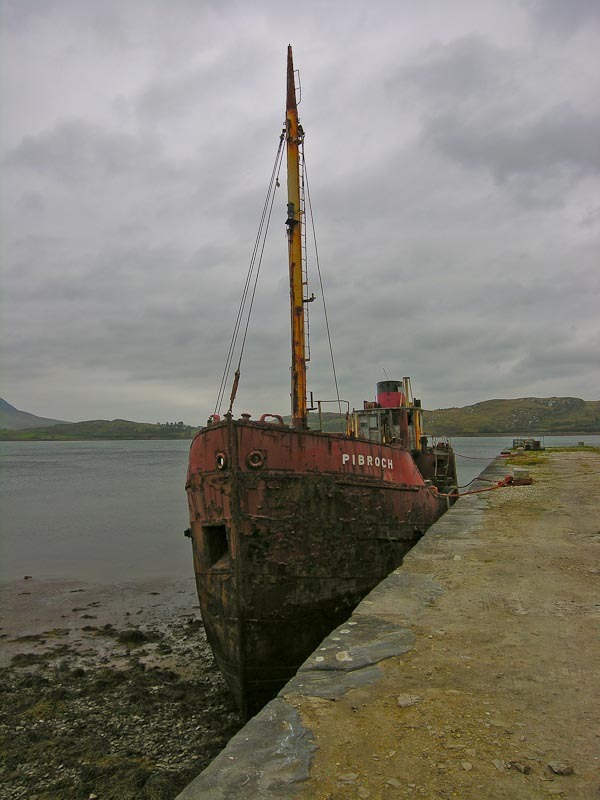 The Pibroch was a tug boat that was built in Glasgow during 1957. It is one of the last of the Clyde Puffer type of vessels remaining today. Here is some more information. Just down the road not more than a few hundred feet is some kind of shrine that we stopped to look at. 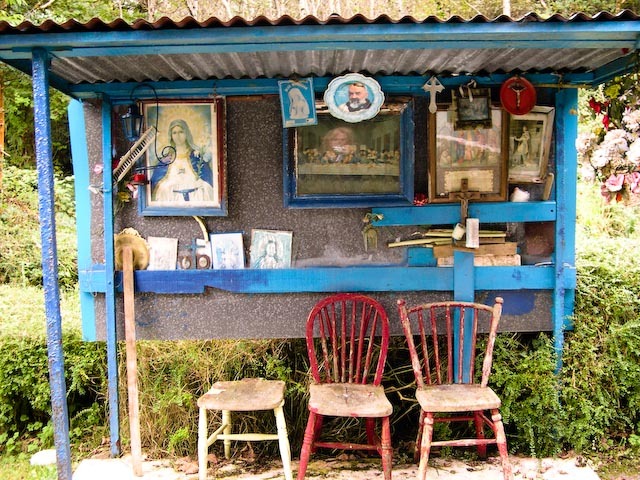 It appears to have the stations of the cross as well as some other shrines and objects strewn about the area. The path winds up and around the small rock outcropping / hill. The next logical stop was Kylmore Abbey. You pretty much can't miss it. We stopped in the car park, used the facilities and had a snack in the food area and wandered through the gift shop. Back out in front we took some obligatory pictures of the lake with the abbey in the distance. The weather had improved slightly as it wasn't raining, but the air temperature and wind made things uncomfortable so we headed back to the car quickly. 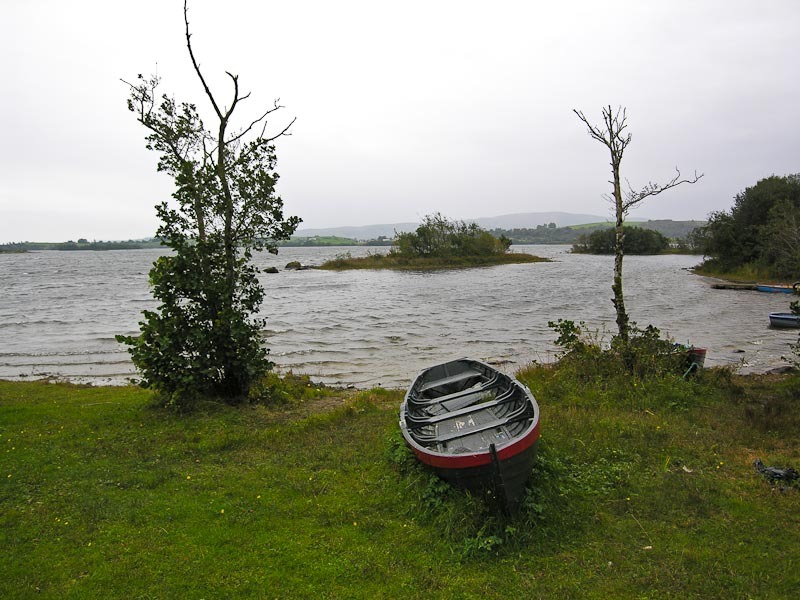 We made a quick stop at a car park along Lough Corrib, but again the weather was prohibitive. We kept going towards Cong. We hadn't really intended to visit Cong, but the weather had cleared as we hit the area and the signs reminded Karen that The Quiet Man was filmed here. I hadn't seen the movie or at least didn't remember it but Karen and Shirley had. I've seen it since and enjoyed it for what it is. There wasn't much to see from a Quiet Man standpoint as most of the tourist stuff was closed. 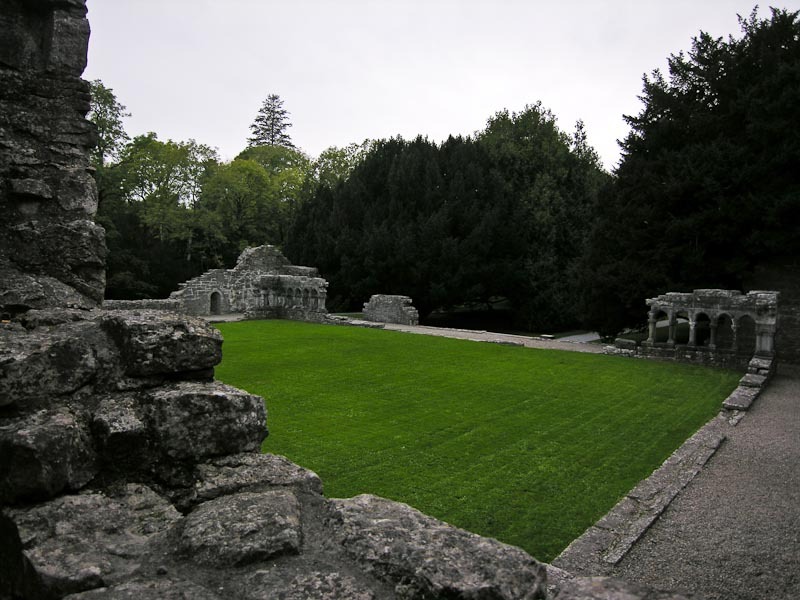 We found Cong Abbey and parked in the car park and wandered around the site. This is a nice ruin and has a number of interesting areas and view. Well worth a visit. A nearby house was covered in red ivy and we took a few pictures. We bundled back into the car when the rain returned and headed back towards Corofin. Corofin was still a good distance away and the rain began to really come down in earnest. We stopped in Headford for dinner and found a small Chinese restaurant. The food was actually not to bad as compared to previous experiences with Chinese food in Ireland. There was both spice and heat and nothing was overly sweet. The decor was typical Chinese restaurant and the patrons ranged from teenagers out for a Friday night date to older couples in evening wear. Back on the road the rain continued and the visibility was so bad on the N6 due to headlights and rain that I elected to take the slower back roads. We arrived well after dark and the second day of driving and the pokey mattress just about killed my back. I was seriously contemplating sleeping on the stone floor. We got up and cleaned up the cottage and took off for Shannon to return the car and catch our flight back to Portland. Things went off without a hitch and we had plenty of time to get to our flight. We made all connections on time and arrived in Portland, tired but with a lot of memories.